For months, we had been looking forward to the Fourth of July holiday weekend. 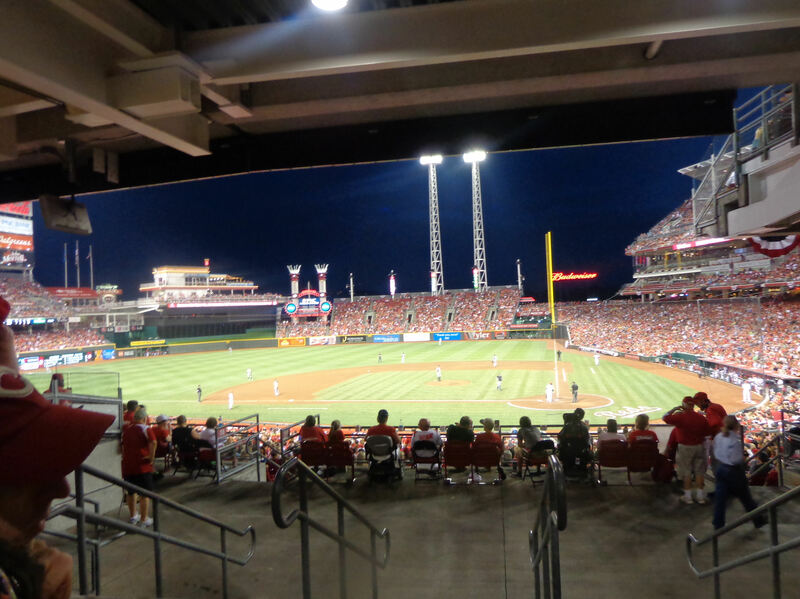 Our Mariners were scheduled to take on the Reds at Great American Ball Park in Cincinnati. The original plan was that my folks would come out for the series and my wife would join us too. But through a series of plan squashing issues, neither my folks nor Colleen could end up making the trip. My folks were out weeks in advance, but Colleen was going to join us right up until July 3rd. 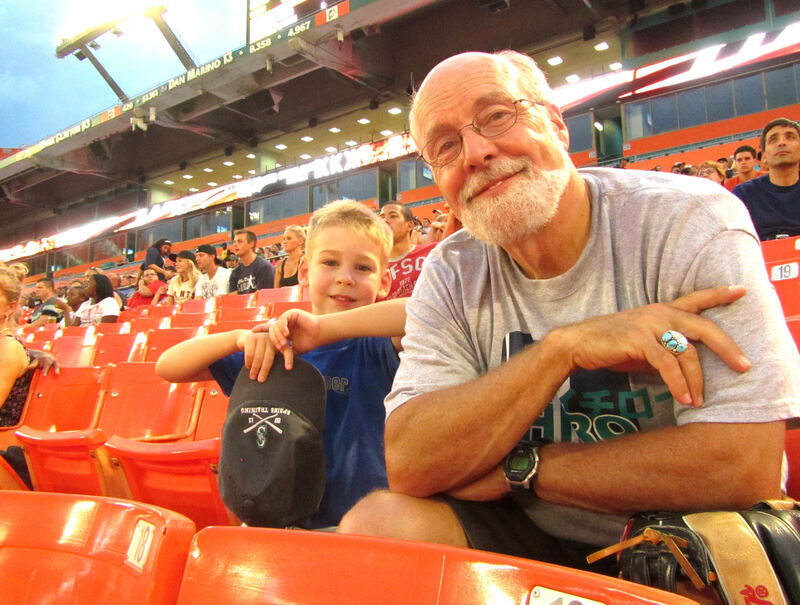 We picked out our hotels and bought our game tickets with her input…but then something more important came up that she had to attend to and had to drop out. …join our traveling roadtrip caravan. For the record, that guy jumping above is traveling from left to right…and Avi wasn’t impressed until the very end when the last two bikers did back flips. 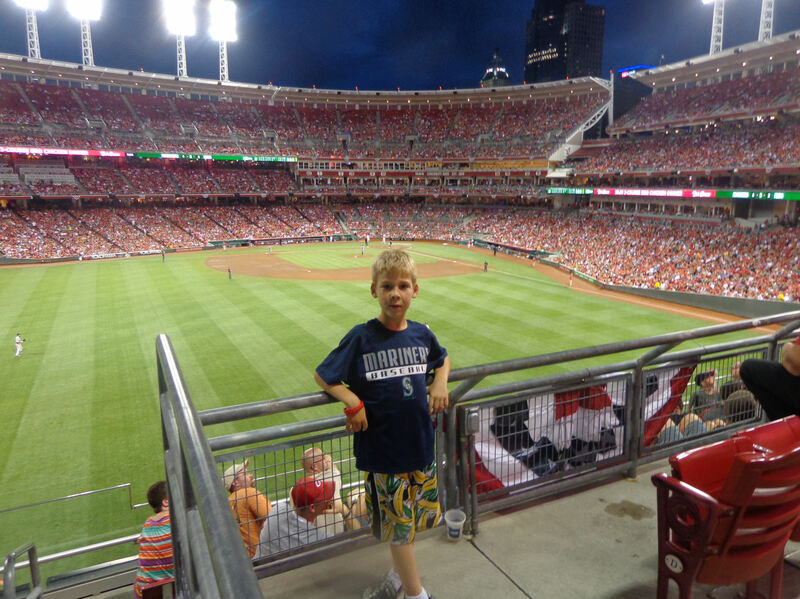 Oh, by the way, this game marked Kellan’s 50th MLB game and Great American Ball Park his 16th MLB stadium. The Reds have an extra early BP “tour.” You pay some extra cash at the Reds Hall of Fame (which is an awesome Hall of Fame that you should definitely check out), and you get in to BP super-duper early. 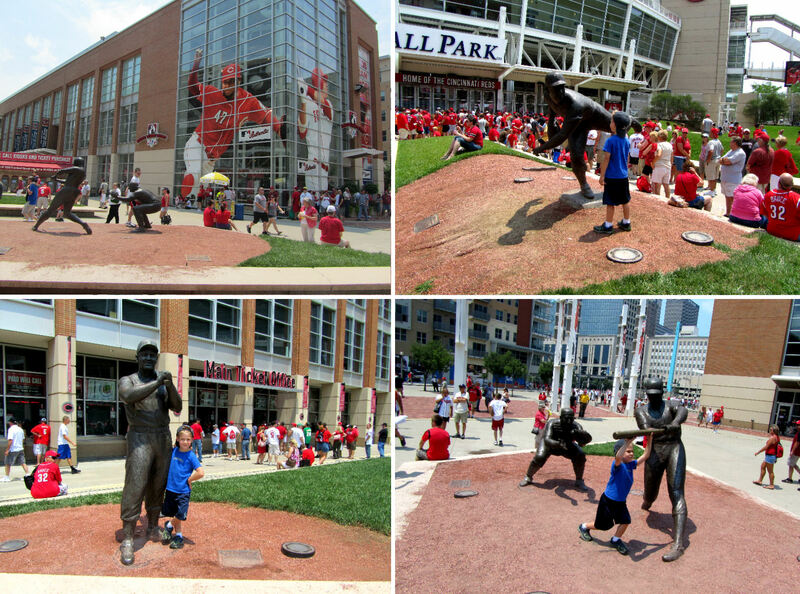 You also get a pass into the Reds HOF and a cool Ted Kluzinsky statue. 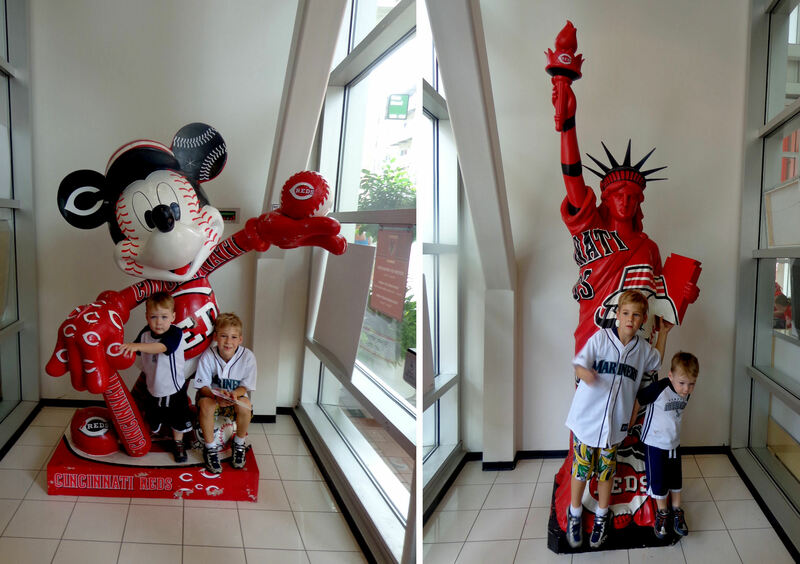 …and Reds Statute of Liberty. 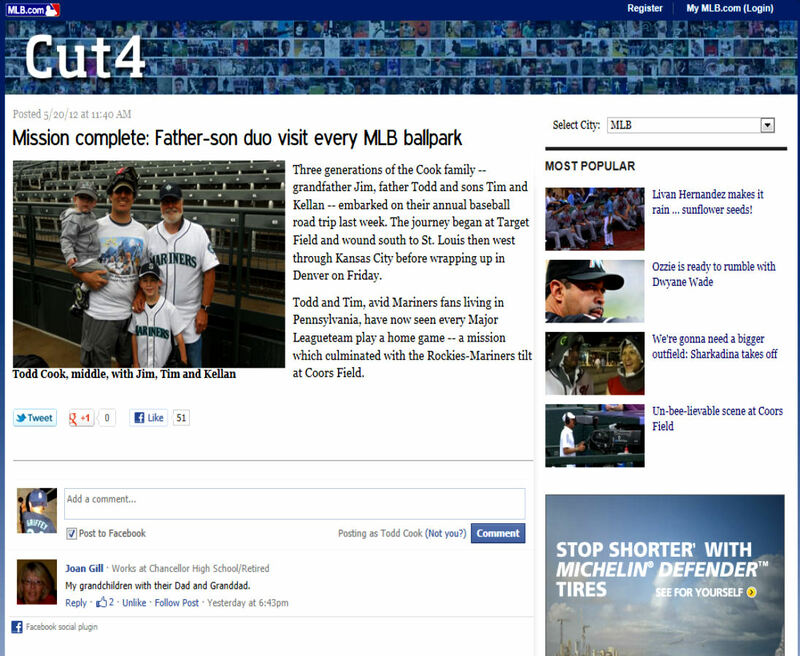 (Note: Tim is using a brochure as a catcher’s mitt in that picture). …and told us what would happen once we went out to the field. Essentially, for the first half hour we would be confined to right field. 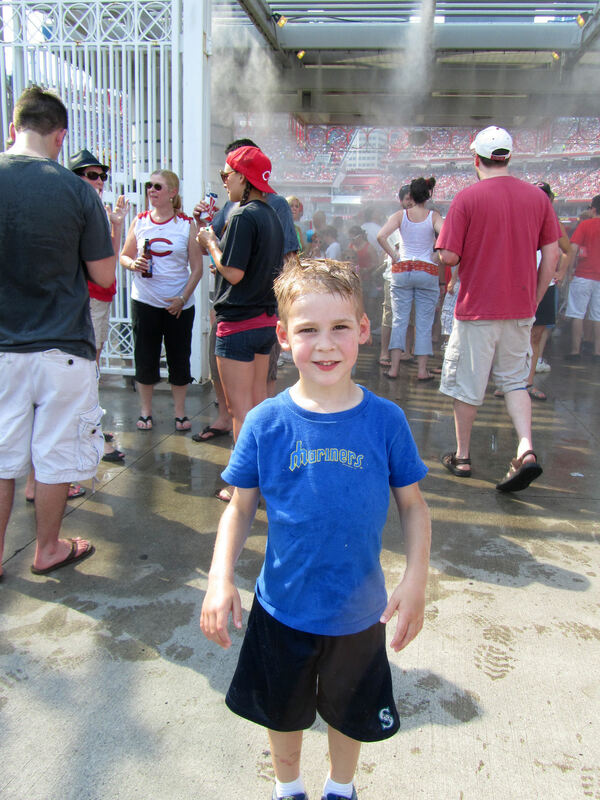 Then the first base line would open up for us (and I think all Reds season tickets holders. 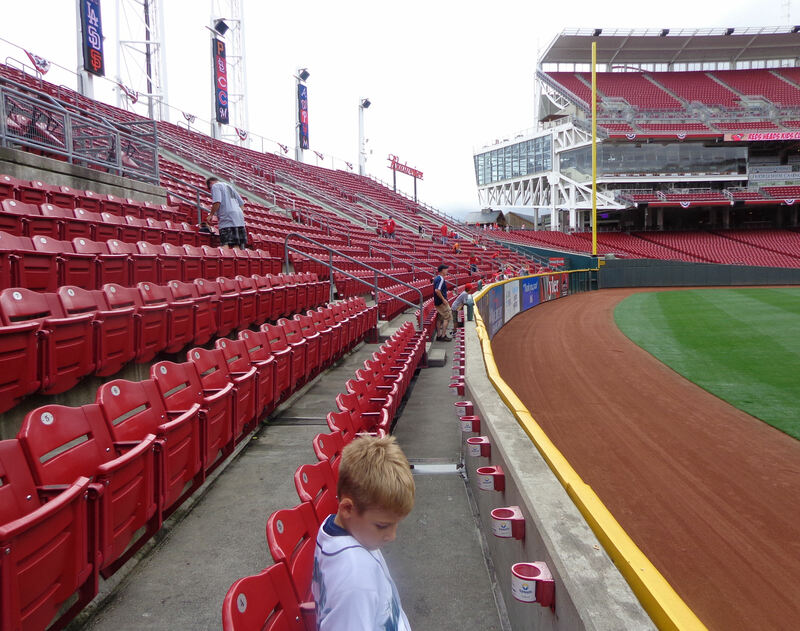 At that point, we could stay in RF or we could head down to the Reds dugout in search of autographs. Eventually, the gates would open to the general public and we would be able to go anywhere. 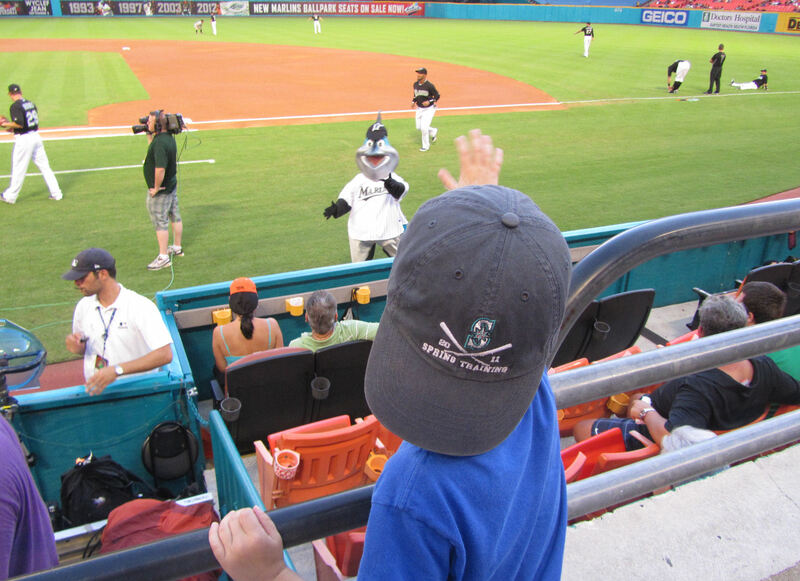 We watched Saunders while Avi went off to watch BP. 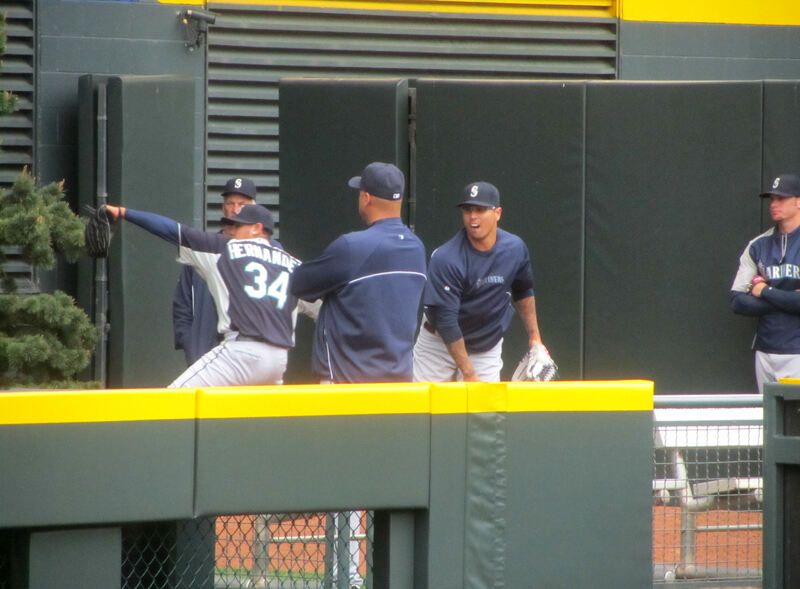 After Saunders wrapped up his throwing session, Saunders flipped his warm up ball up to Tim between the narrow gap between the seats and the net over the top of the bullpen. 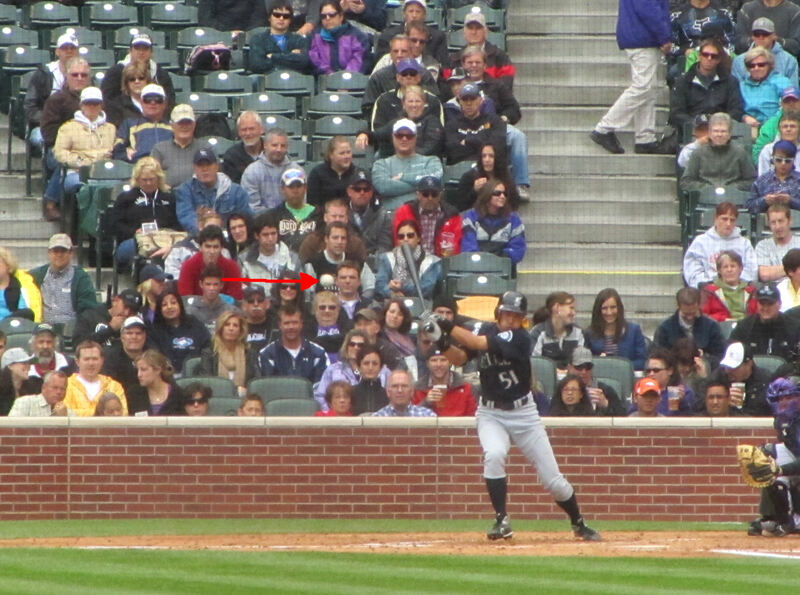 You can’t tell in that picture, but we were in a little partial row pressed up against the batters’ eye. Spots like that are always ideal for us because the natural barrier on one side helps keep Kellan from trying to wander away. 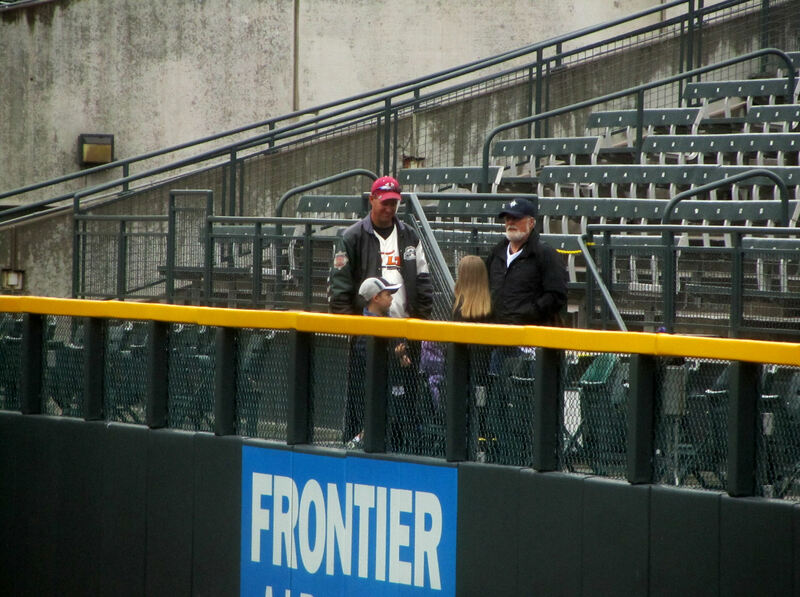 …but then I saw a familiar face, Mariners bullpen catcher Jason Phillips. I hadn’t seen him in the bullpen when Saunders was throwing. He must have been hiding in the corner. We exchanged our customary tip of the caps as he walked across the field with Saunders. 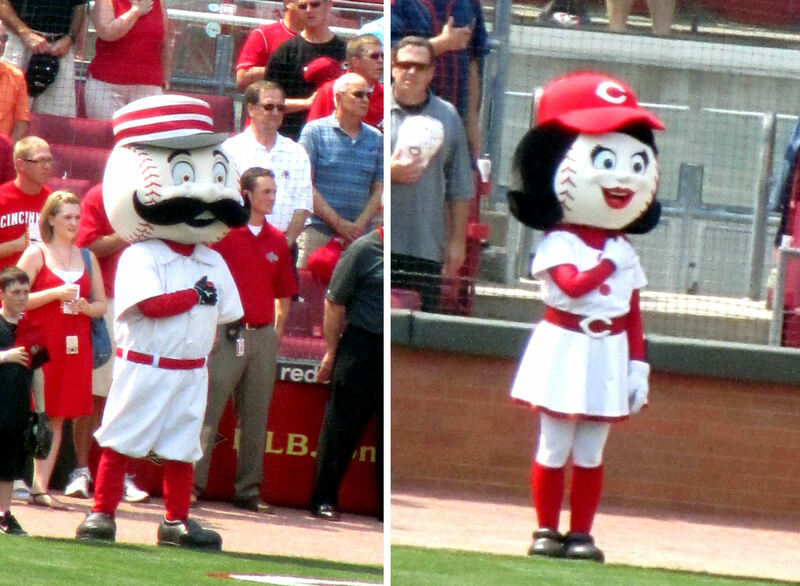 Eventually, I recognized two Reds in the outfield. 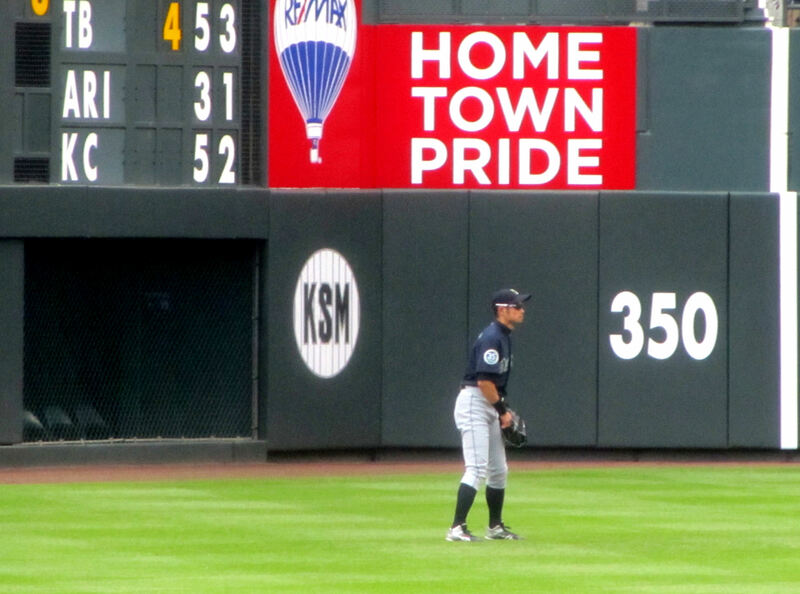 First, I noticed Shin-Soo Choo shagging balls in CF. When Choo made a catch on a sinking liner in CF, I called out an extended “CHOOOOOOOO!” He turned around and fired the ball to me. About thirty second later, he shagged another ball and it tossed it to Tim. 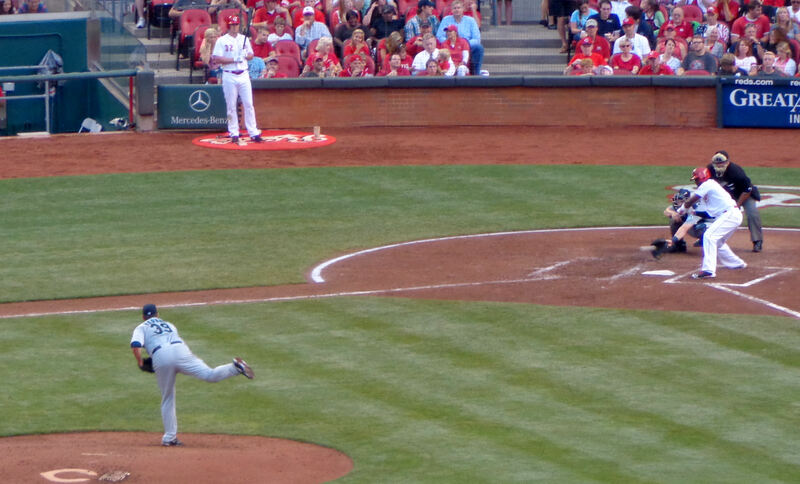 Over the past several years, I haven’t really followed but have admired Aroldis Chapman from afar. He seems like a good guy and, heck, he throws balls at crazy fast speeds. Amongst the sea of unrecognizable Reds in the outfield, I eventually noticed that Chapman was hanging out in straightaway right field. 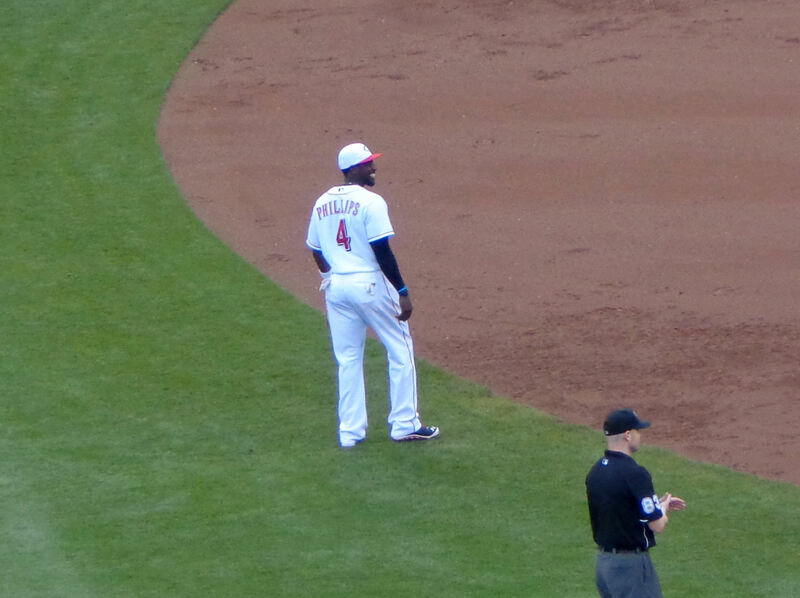 When I spotted Chapman way over there in RF, I shouted out a loud, “AROOOOOOLDIS!” This prompted Aroldis to look over and exchange waves with us. He was way over there. 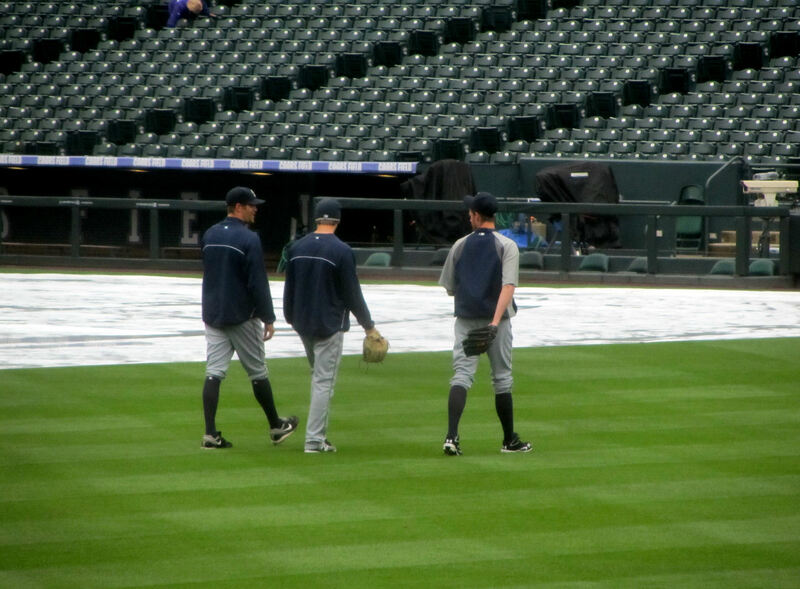 Carter Capps was “way over there” too – way over across the field from this throwing partner out on the LF. Capps was firing seeds across the field. It was impressive. A little while later, someone hit a grounder through the infield and into somewhat shallow RF. 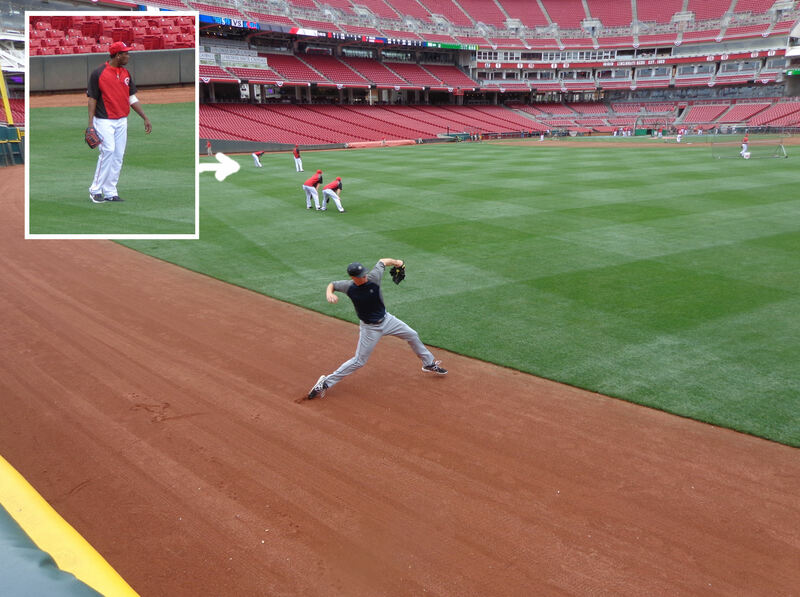 Aroldis sauntered over and grabbed the ball. 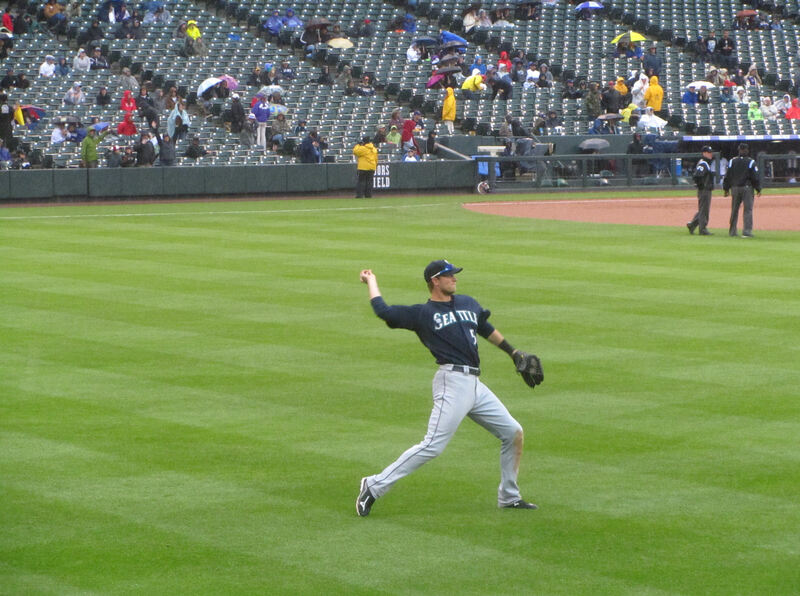 I called out his name again (you know, we were buddies after that exchange of waves) and he threw the ball all the way from RF to my glove waiting in CF. …hit one of them right to me and I made the catch on the fly. Thanks to Rocco for identifying Bruce for me later in the day based on that last photo. See that bat laying on the ground in the photo above to the right? 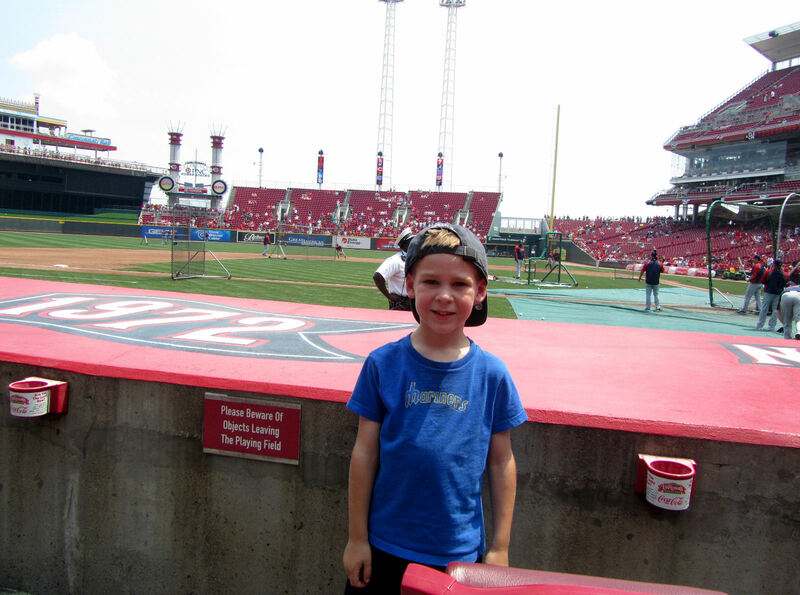 When Reds BP ended, we headed around the RF foul pole and toward home plate. 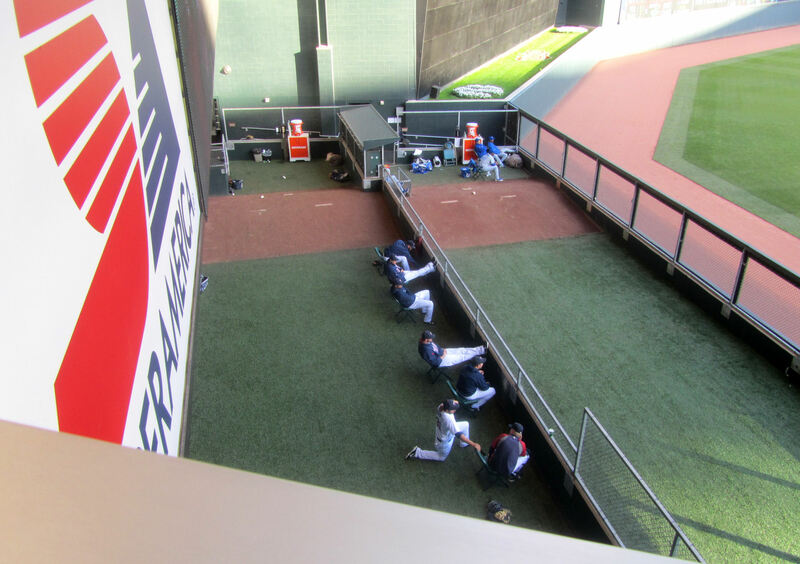 On the way, I took a photo (that photo) of a bat (that bat) sitting on the ground in the Mariners’ bullpen. 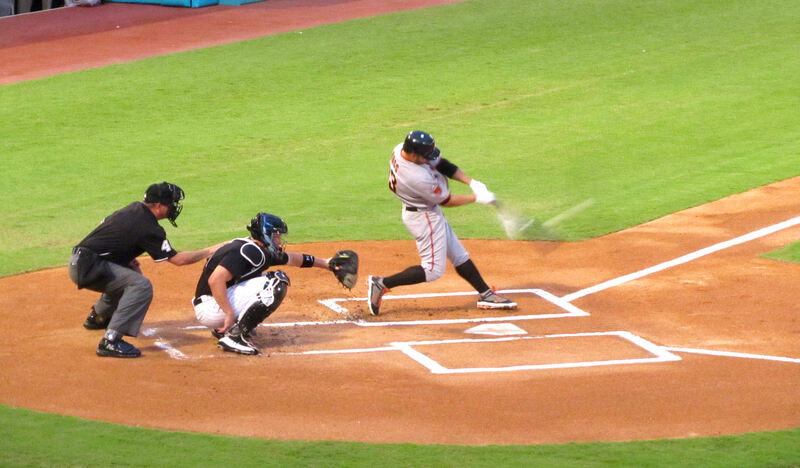 I took the photo for the sole purpose of zooming in on the picture to see whose name was on the bat. 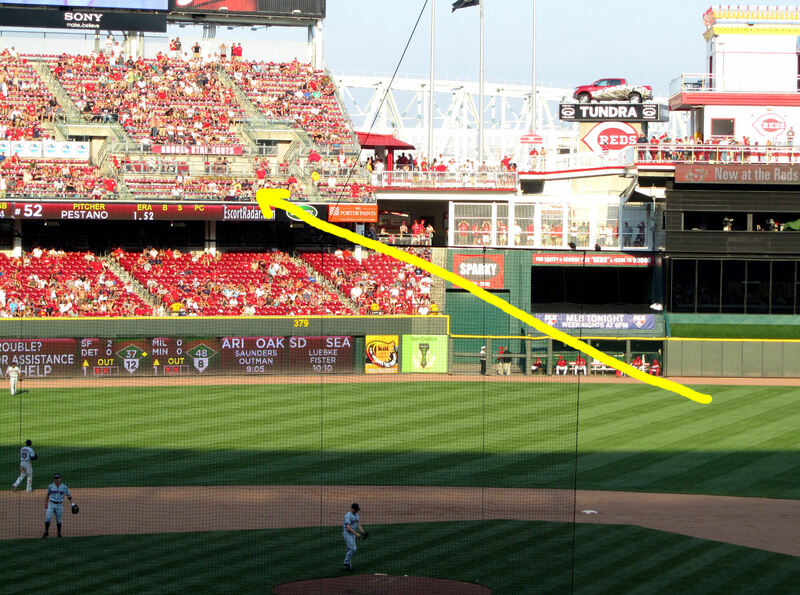 So click on that photo and check it out: it was Jay Bruce’s bat. That’s odd. 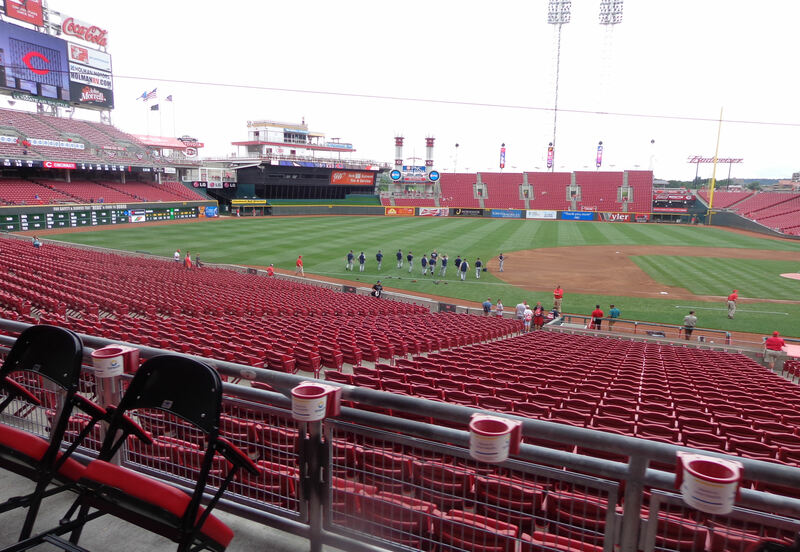 As we approached the infield, the Reds grounds crew removed the cage and screens from the field. What was this all about? It was very confusing. 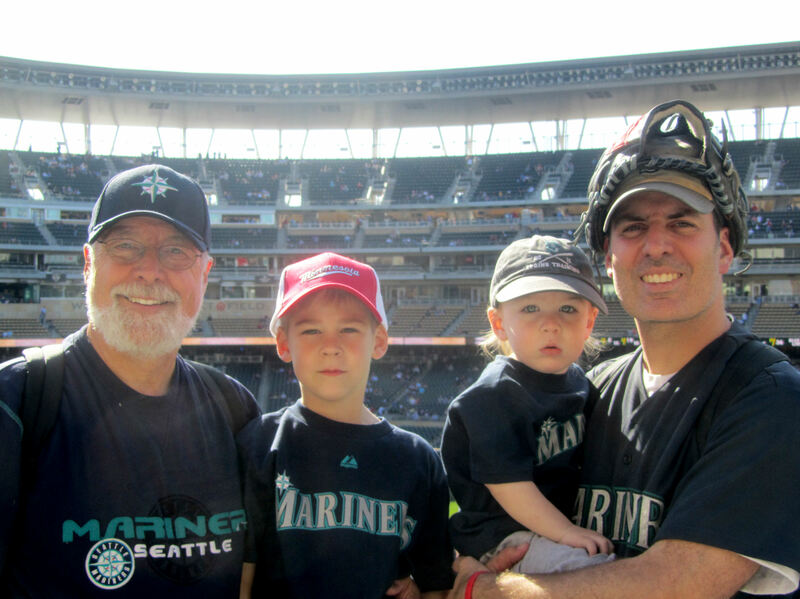 It was also a bit of a bummer because this was only our second Mariners game of the season and the Mariners didn’t take BP before our first game either. Funny side note: Kellan ate part of that pretzel while sitting on my shoulders. When he finished, I had to pick big grains of salt out of my hair for the rest of the afternoon. 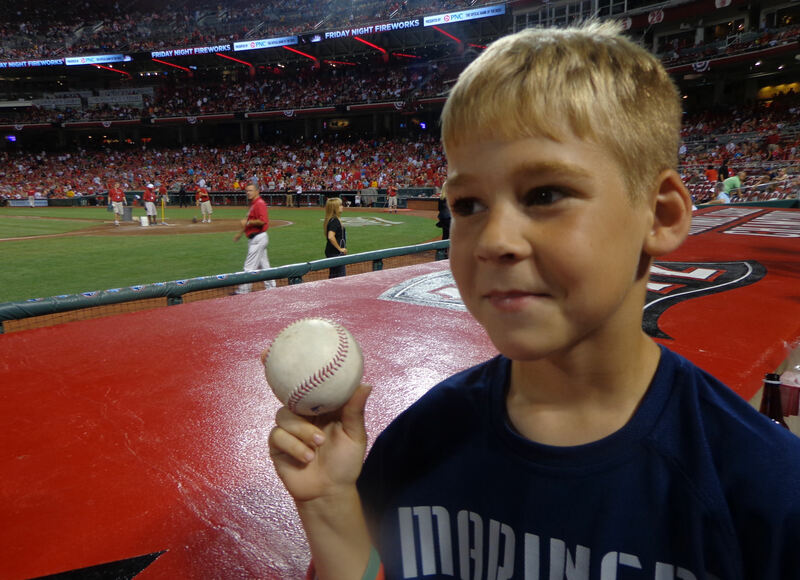 Tim got him to sign the Jay Bruce homerun ball. I asked Felix why the M’s weren’t taking BP. He said they had got into Cincinnati around 2:30 in the morning after playing a road game in Texas the previous night and decided not to take BP. 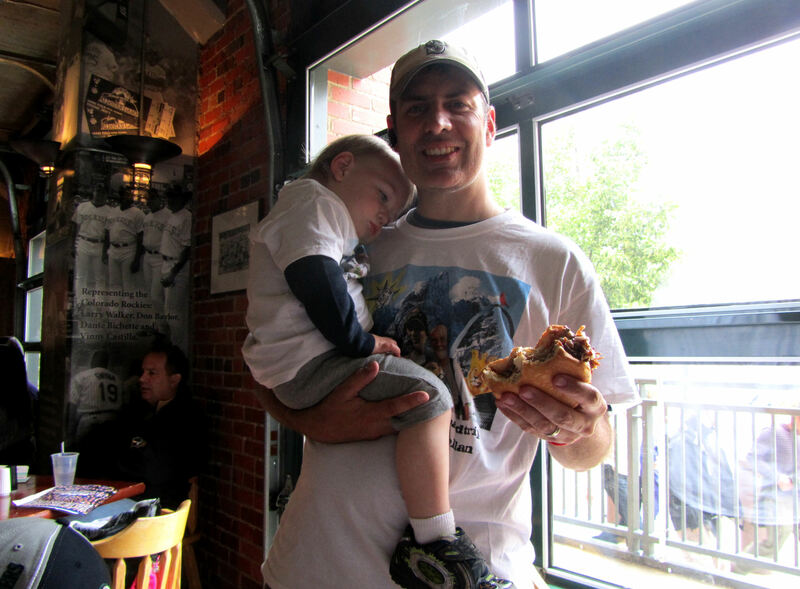 …and a big bobblehead burger guy. …for throwing a no-hitter against the Giants three days earlier. 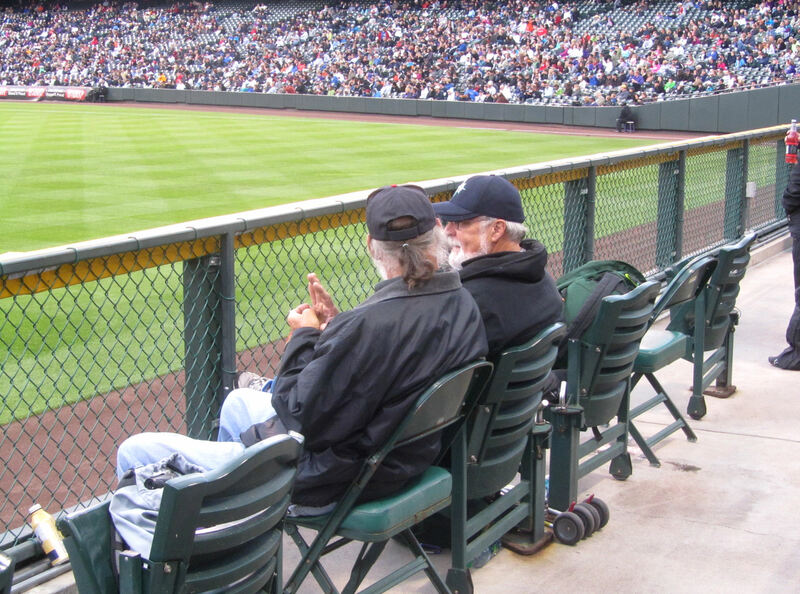 In the couple of games Tim and I had previously attended at Great American, we’d sat in RF and lower LF. 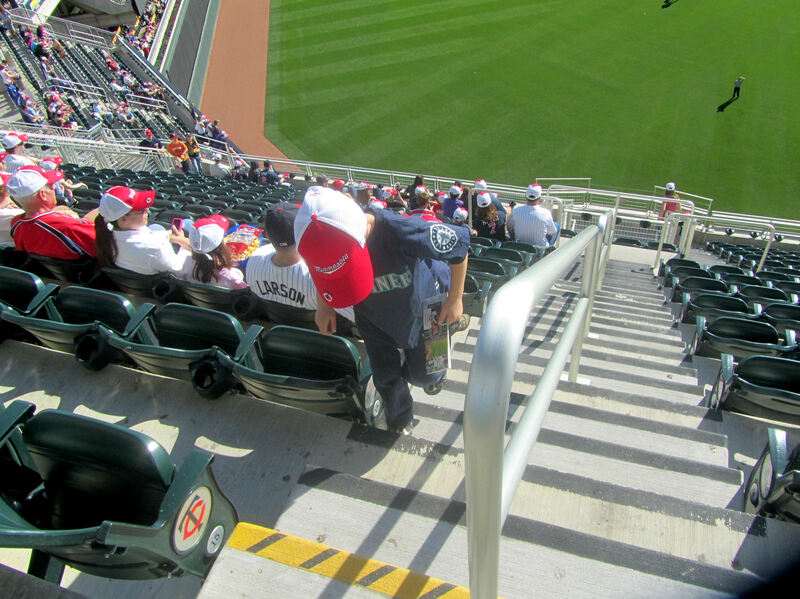 We once visited the upper deck in LF, but never watched game from up there. I’ll tell you though, I loved it. 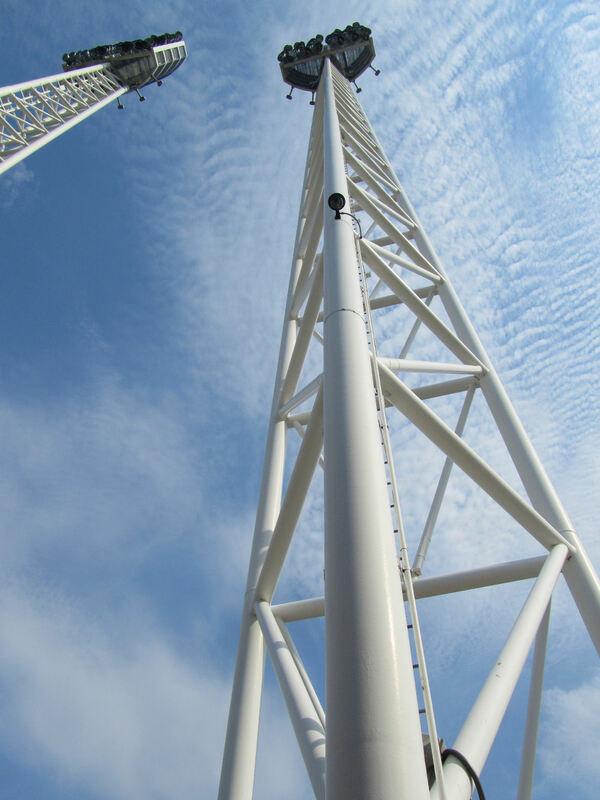 For an “upper deck,” it’s not very high up there and the view is great. Plus, we had a nice view of Kentucky across the river and a great breeze. As an added bonus, at the back of the upper deck, there are covered seats to either shade you from the sun or keep you dry in the rain. 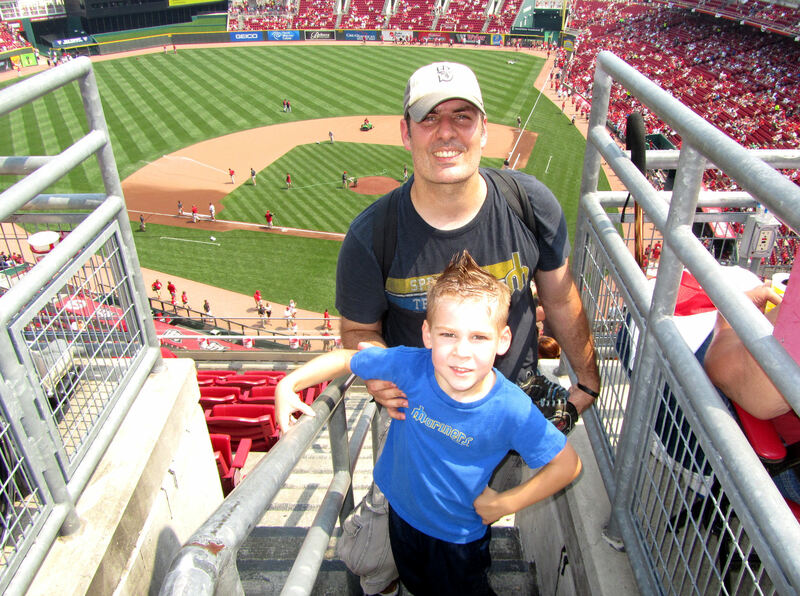 The LF upper deck at Great American Ball Park definitely gets my seal of approval. 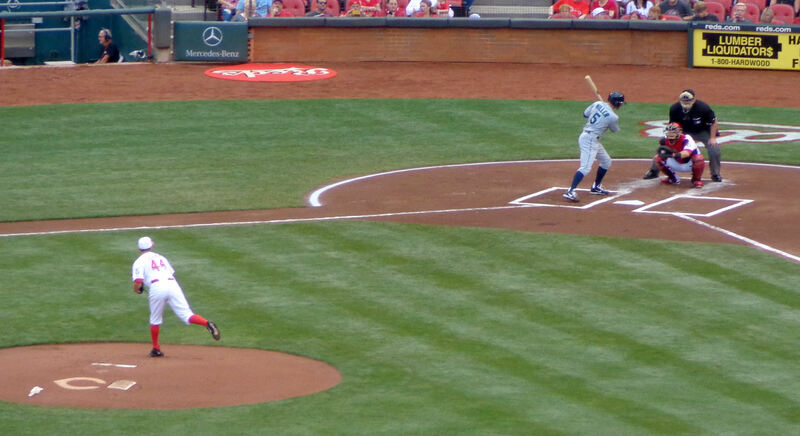 The pitching match-up was Aaron Harang vs. Mike Leake. I wasn’t a big fan of the match-up. But sometimes a struggling pitcher can pull out a better-than-normal performance when facing his old team. That’s what I hoped for from Harang. 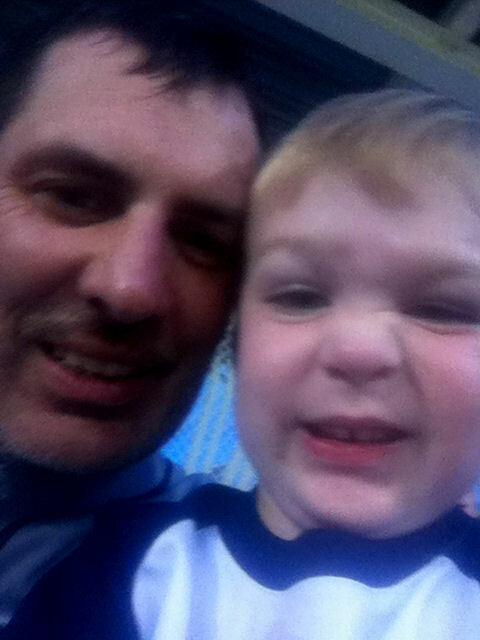 And then Kellan and I headed down the stairs on our way to get some ice cream for the boys. 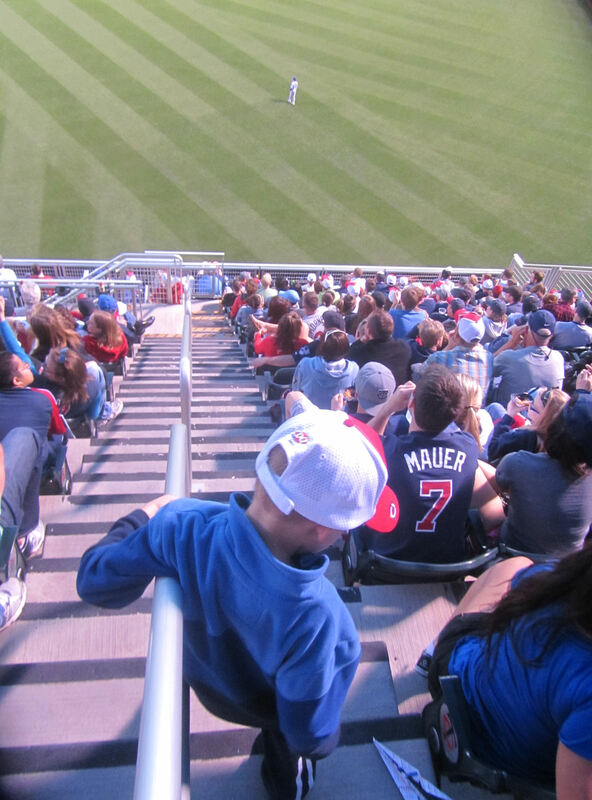 As we walked down the upper deck stairs, Miller laced the ball down the RF line and coasted in for an easy triple. A great start for the M’s! 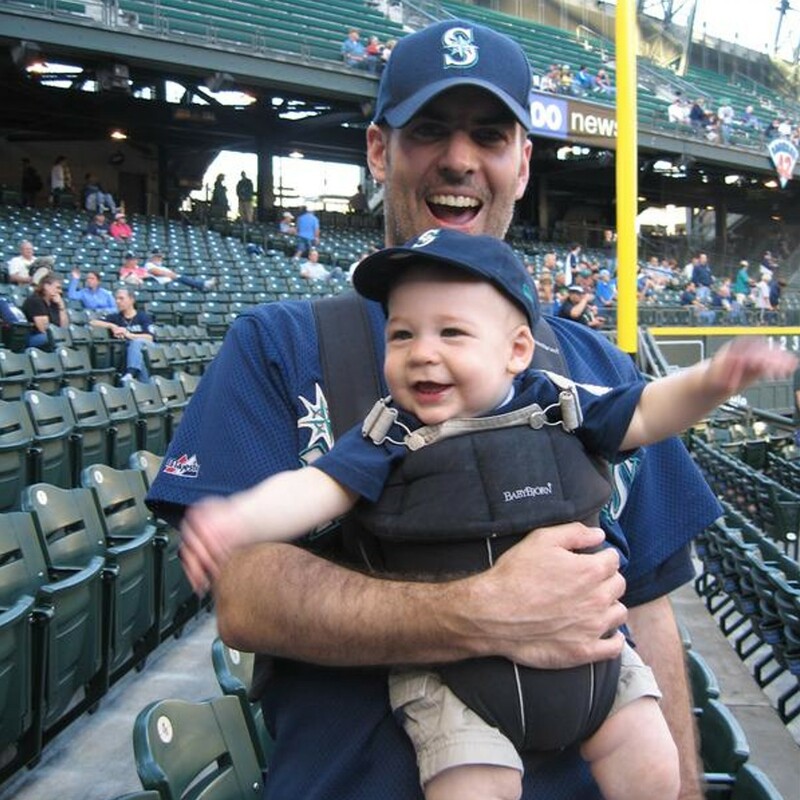 As Kellan and I ducked into a men’s restroom, Nick Franklin stepped to the plate and blasted a 2-run homer. Kellan and I had no clue this had happened. 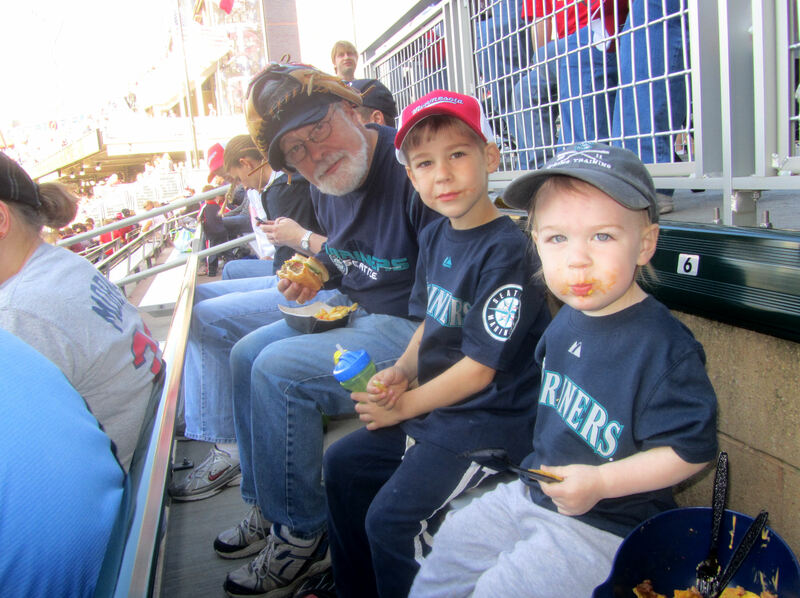 But when we got back to the ice cream place we saw the score – 2-0 Mariners! 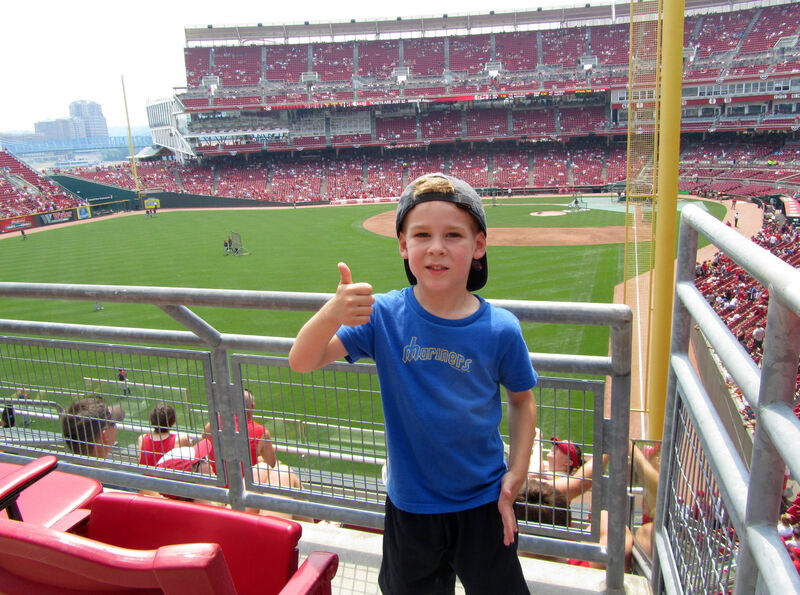 …, Avi informed us about the Franklin homerun. Check out that big smile clearly visible from the top of the upper deck in LCF! That’s how I like to see guys playing the game, like my favorite player, Ken Griffey, Jr.
Michael Saunders in RF, Dustin Ackley in CF and Rauuuuuul Ibanez in LF. Tim and Kellan either spend their time trying to annoy one another or hugging and telling each other how much they love the other. 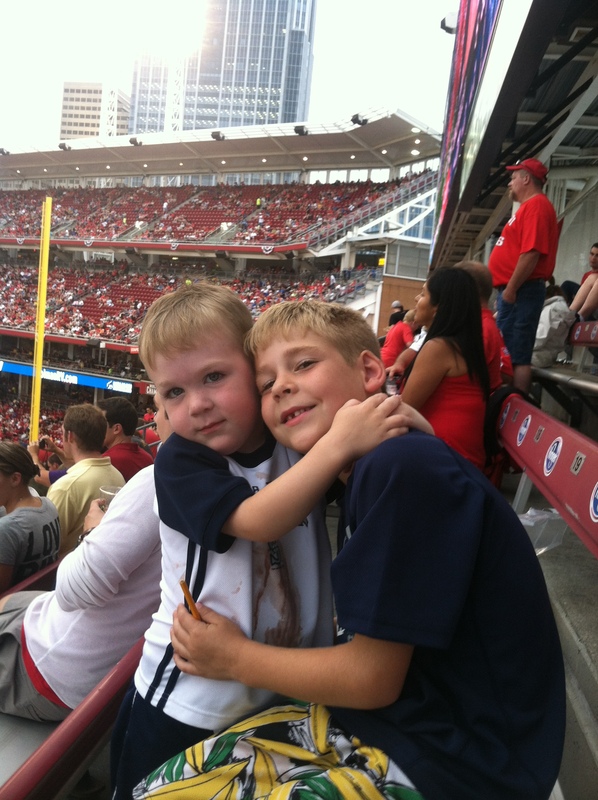 Generally, they act like wonderful loving brothers while at baseball games and reserve their annoying each other for play time at home. 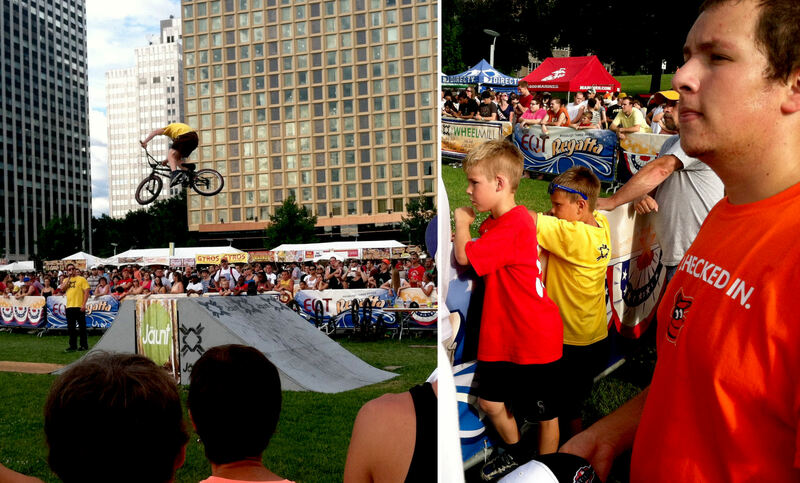 …for a little kid fun. That table looks like it is covered in sand, but it is really a mixture of different colored bits of rubber chopped up into little grains. There were digging tools and dinosaur skeletons that the kids could dig up. The two big dinosaurs standing behind the boys in the picture above to the left felt real’ish and they moved around every couple minutes. The one on the right also laid eggs. The boys couldn’t get enough of this little dinosaur display. Before the game started we were hanging out in dinosaur area and another guy wearing Mariners gear asked me if he’d seen us at Pittsburgh. We chatted about it and, indeed, he had seen us in Pittsburgh. His name is Greg. 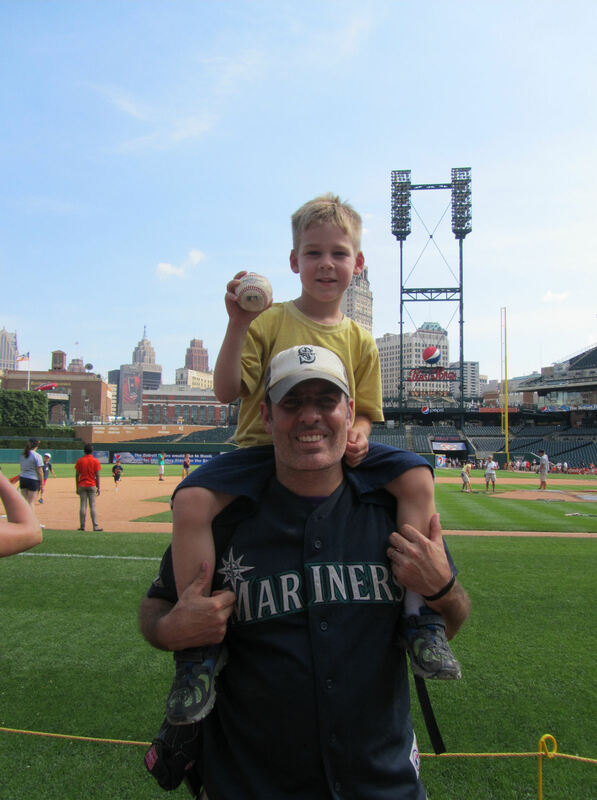 He’s a NW Mariners fan transplanted to Detroit. We’ve kept in touch a bit since running into each other several times this weekend. 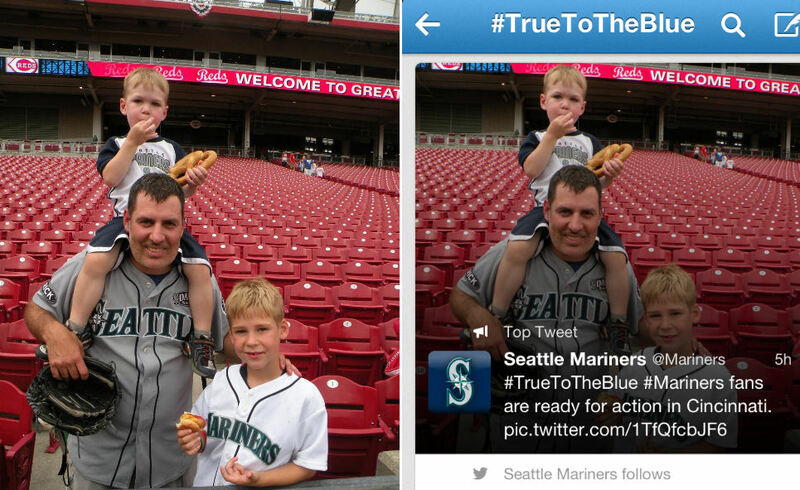 Good guy, and good Mariners fan. I should mention that the Mariners took a 4-0 lead in the top of the fourth inning when Michael Saunders hit a sacrifice fly to LF scoring Kyle Seager. 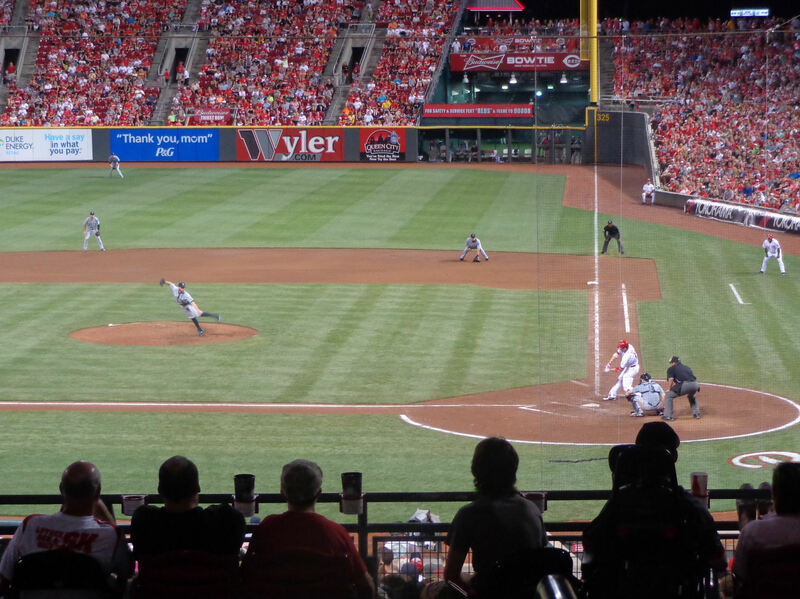 In the top of the fifth inning, Brad Miller made some Great American Ball Park history when he hit his second triple of the game. 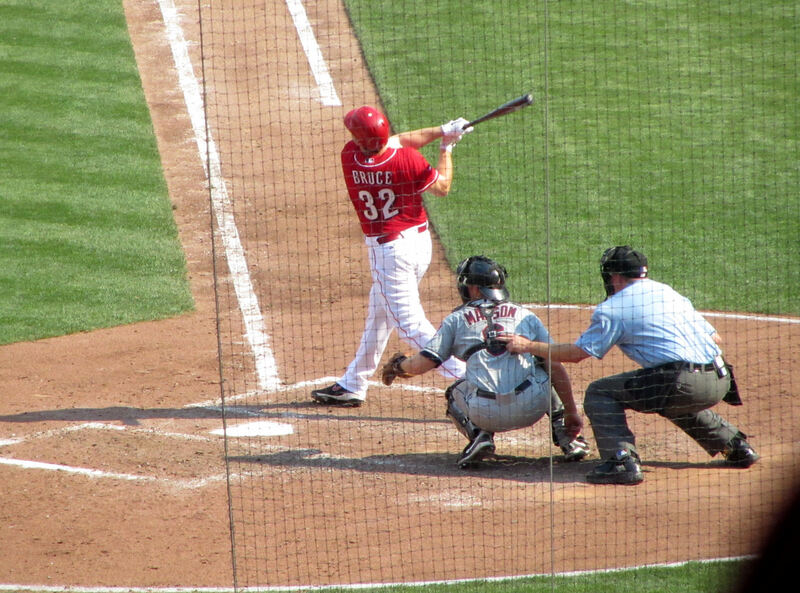 In over 800 games, it was the first time that a player had hit two triples in a game at GABP. Pretty cool. 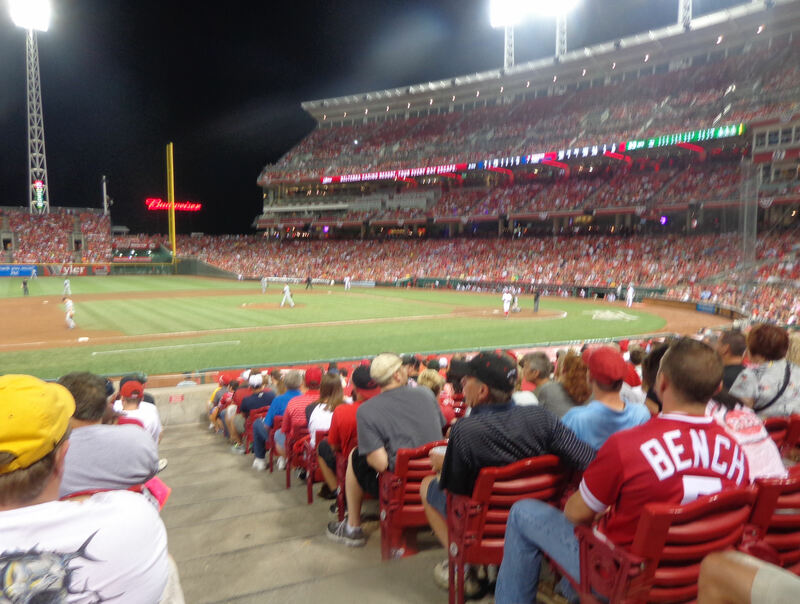 In the bottom of the fifth, Shin-Soo Choo hit an RBI-double to put the Reds on the board. 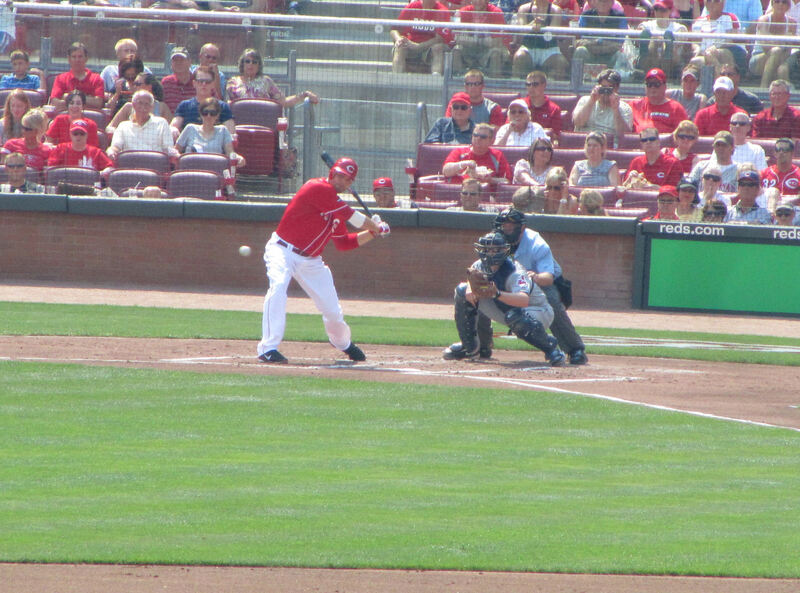 In the bottom of the sixth, the Reds capped the scoring for the day when Joseph Votto blasted a leadoff homerun to CF. That made the score 4-2 Mariners. 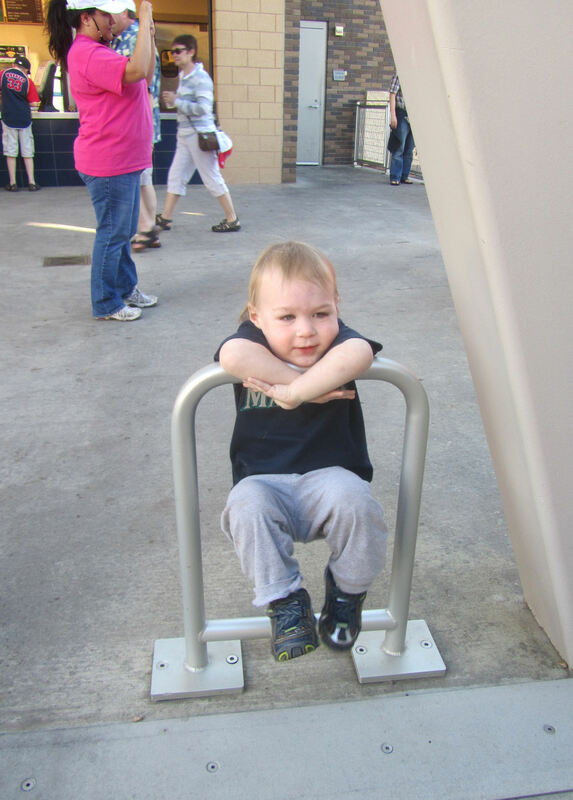 When we arrived at the SRO area, Avi was nowhere to be found. 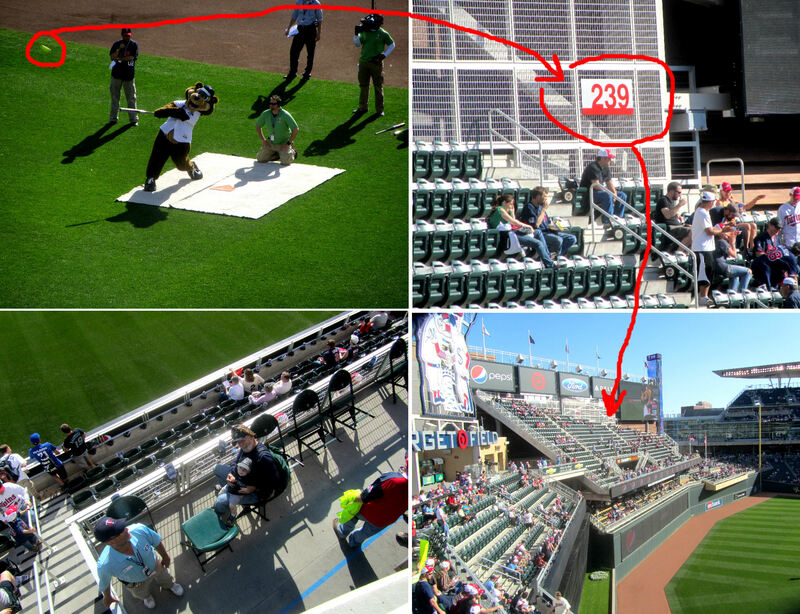 Ends up, we’d left section 402 to meet up with him and he left the SRO area to meet up with him in section 402. Eventually, we did all meet up at the SRO area. They make you stand at the top of the stairs. Eventually, we move down the stairs at stood at the corner of the cross aisle. The ushers didn’t really do anything about it so we stayed there a bit. 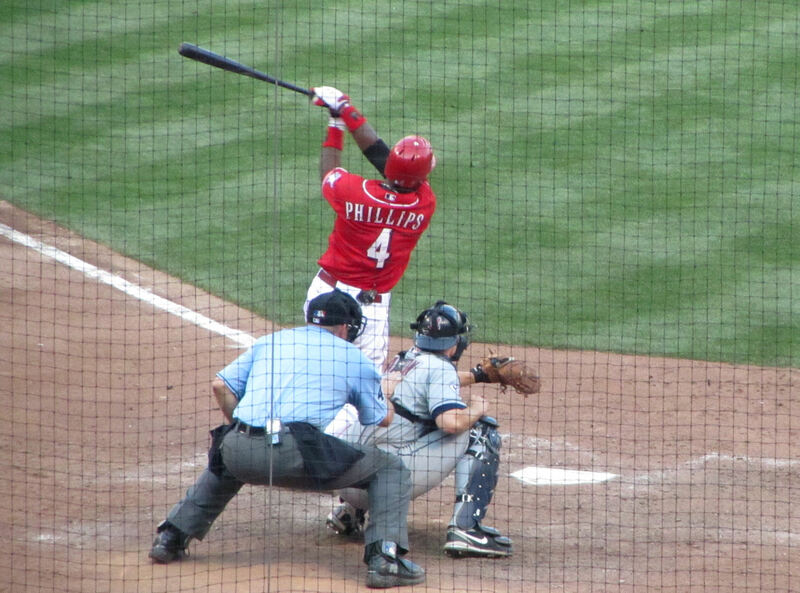 …Votto, and Brandon Phillips, 1-2-3. Check out that guy’s Johnny Bench jersey. That’s sweet. 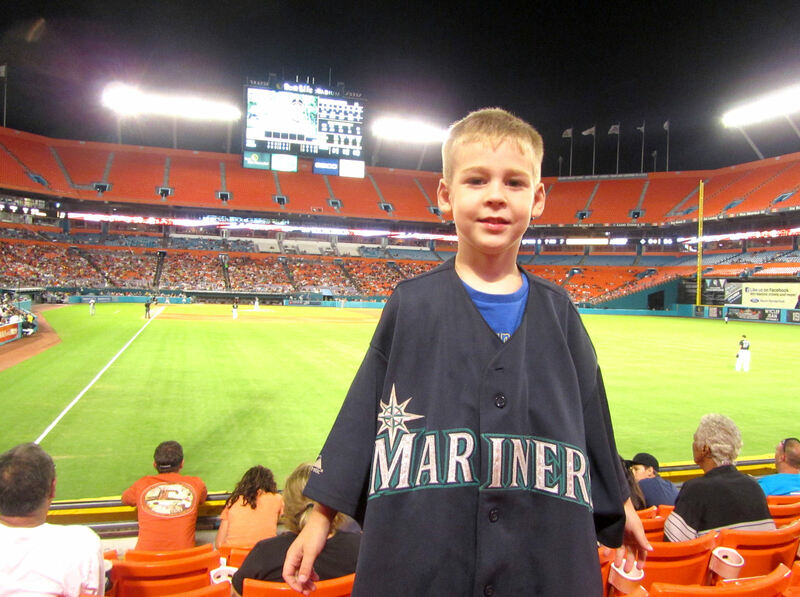 Ollie Perez nailed down a great Mariners Win! 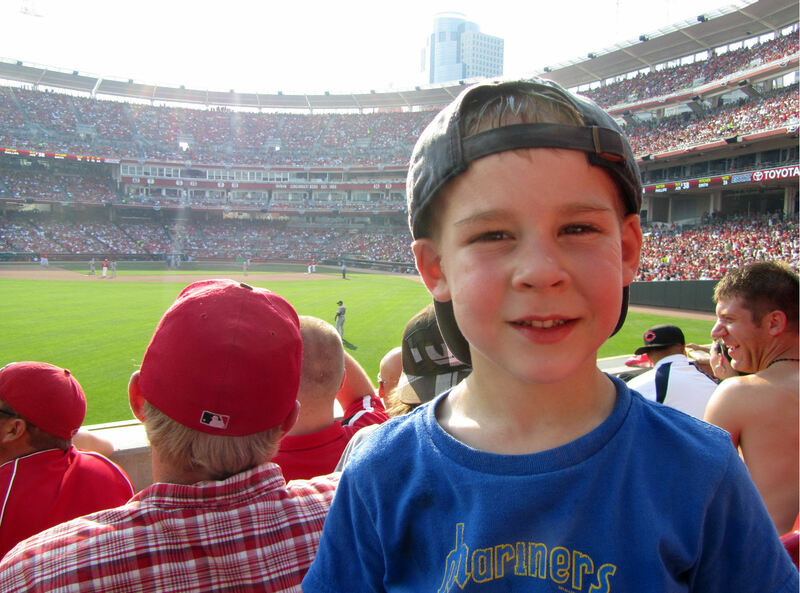 The very first fireworks show of Tim’s life was at Great American Ball Park and it was awesome. 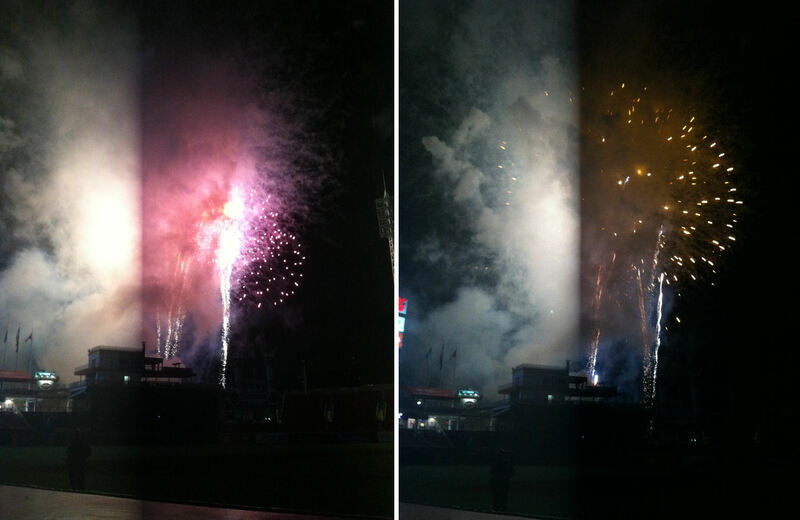 However, since then, we’ve seen a fireworks show at Progressive Field, and absolutely nothing stacks up to the Indians’ fireworks shows. They are incredible But this was a nice show for the boys. They love all fireworks shows. 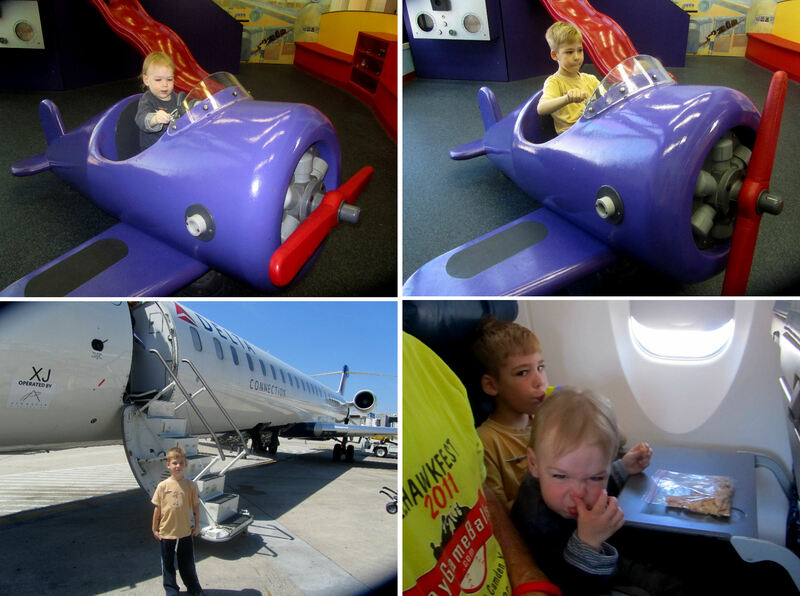 …where Kellan hid under a pillow, both boys acted silly for a while, and then we all called it a night. 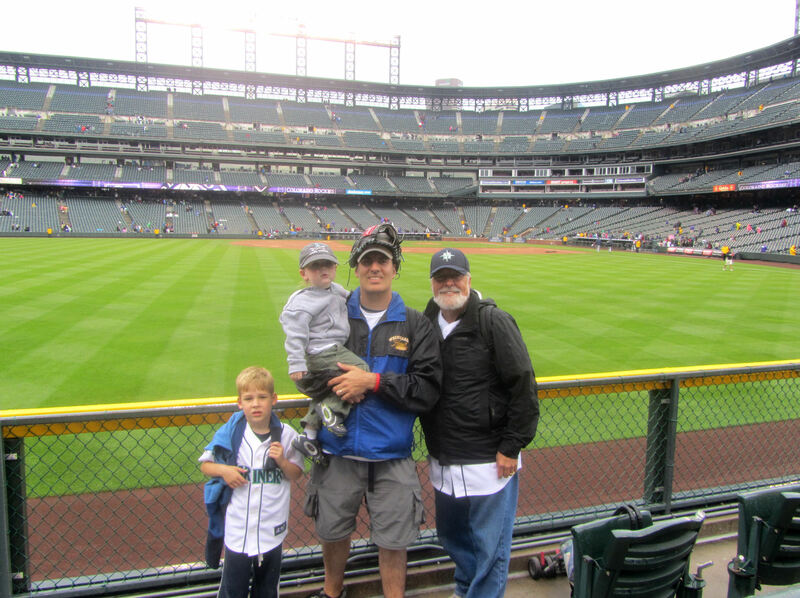 On May 19, 2012, we headed back to Coors Field on a grey and drizzly morning for the sixth and final game of the 2012 Cook Grandfather-Father-Son Baseball Roadtrip. 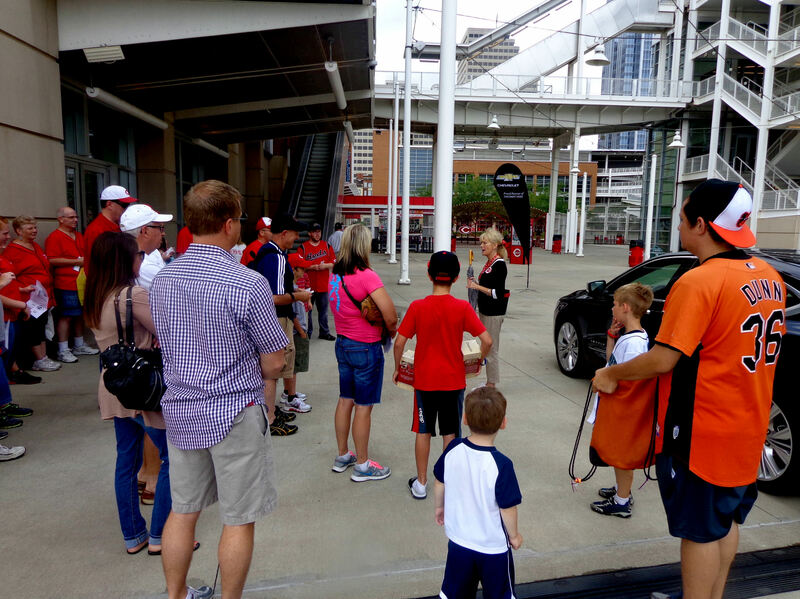 When we headed into the ballpark, it felt like only about 10 other fans joined us. And there was no one on the field. The tarp was out. The batting cage was nowhere to be found. There would be no BP to speak of. Luckily, we did not have to wait too long for some on field entertainment. Pretty quickly, the Mariners pitching corps popped out of the dugout and headed to the CF grass next to the visitors’ bullpen. Eventually, League short hopped Kuma with a hard throw. The ball trickled past Kuma and was scooped up by his interpreter. 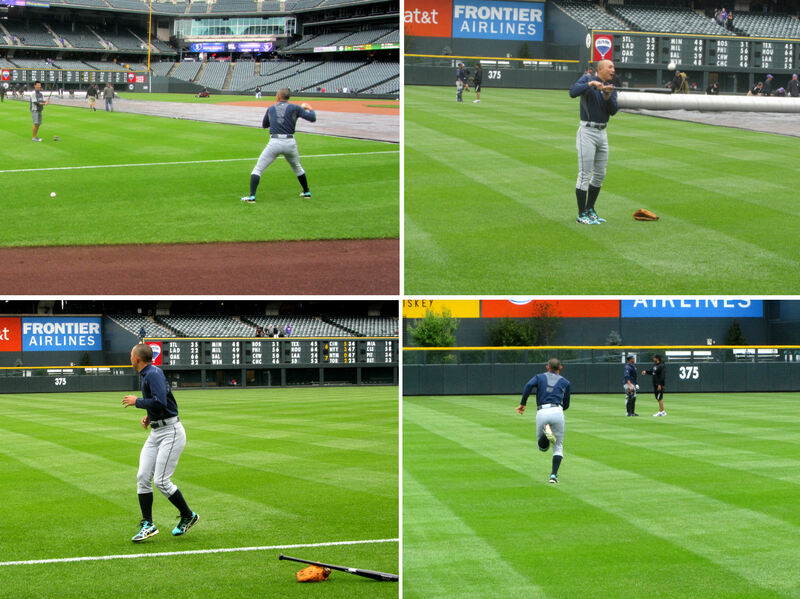 Kuma pulled a second baseball out of his pocket and he and League played catch for a few more minutes. 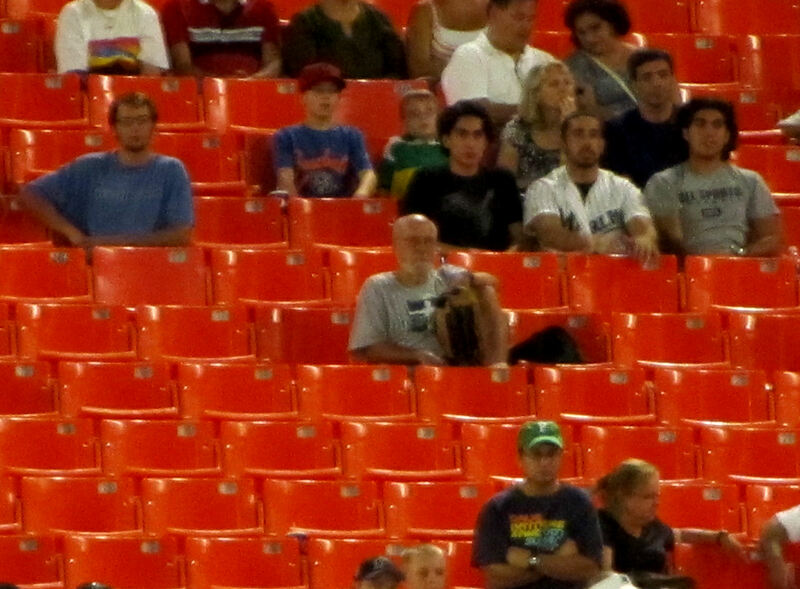 Once they finished playing catch, League tossed the ball they were using to a guy in the bleachers behind us. 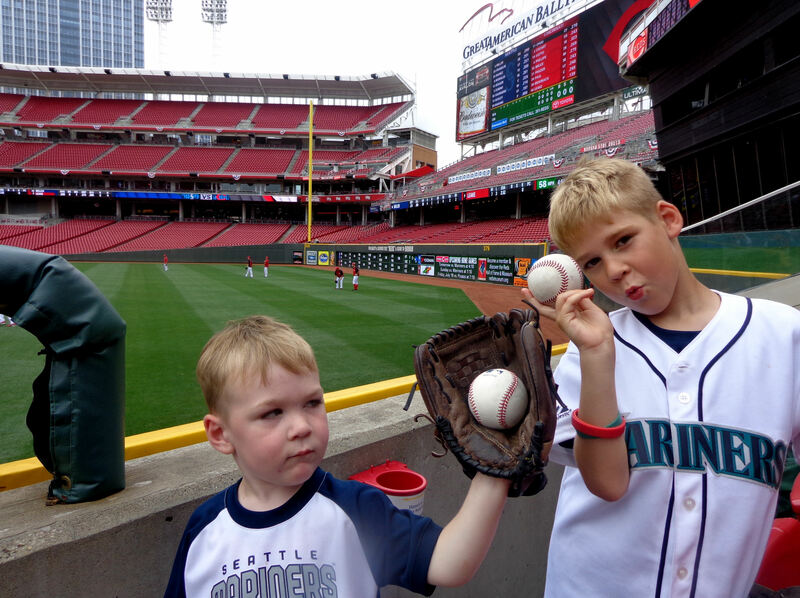 League then motioned to Kuma’s interpreter for their original warm up ball. He tossed that ball to us, and it was a Dodger Stadium commemorative ball! 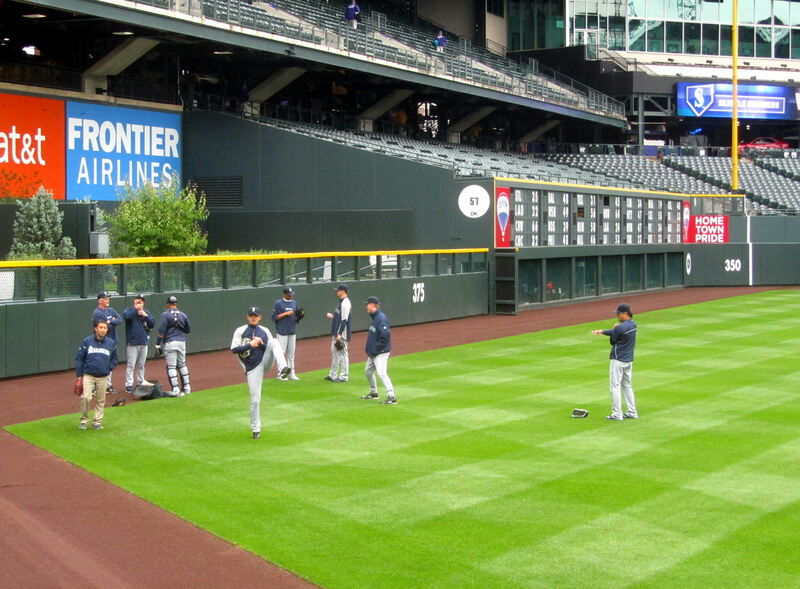 When the interview wrapped up, the only Mariners still playing catch were Tom Wilhelmson and Charlie Furbush. 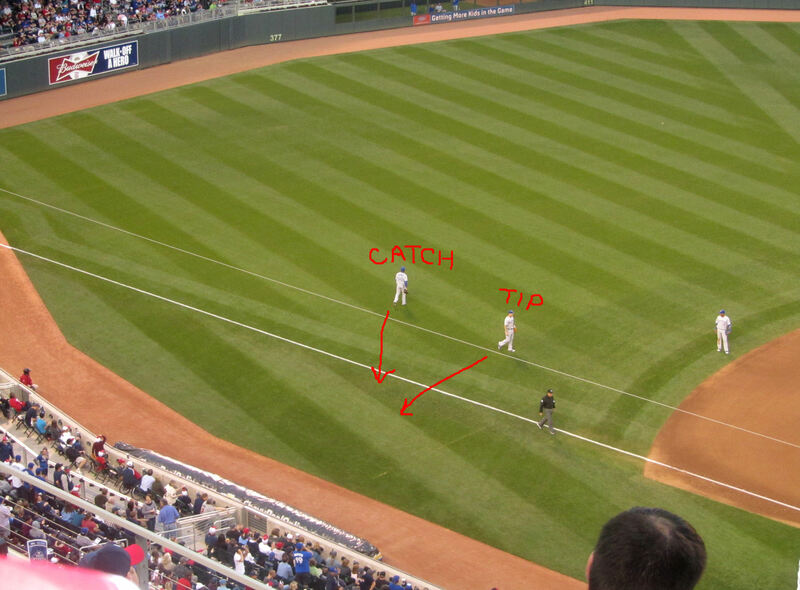 And they were playing extreme-long-toss – from the LF foul line to the RF warning track. 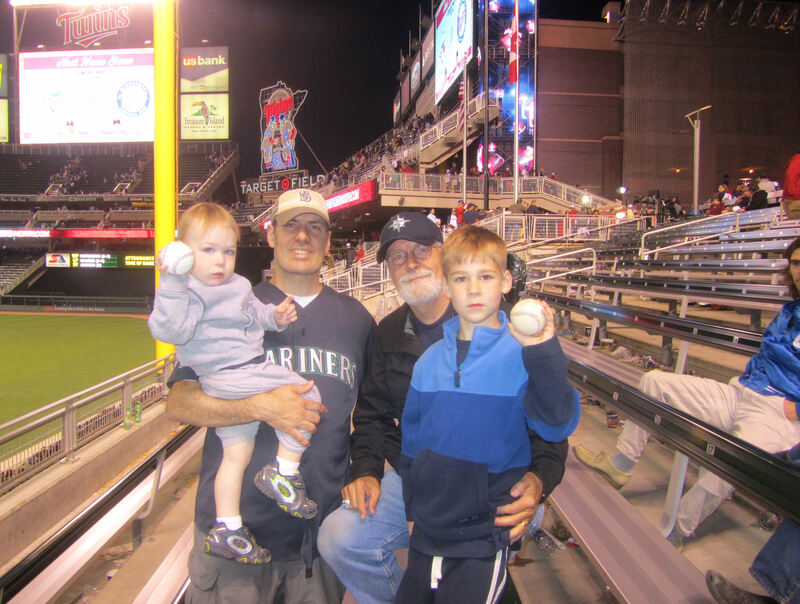 …, one of them (I think Furbush) tossed the baseball to my dad…actually, he completely air mailed him, but it stayed in the front row where we were the only fans who could get to it. It was also a Dodger Stadium commemorative baseball, my dad’s second! …get in some work in the bullpen. Tim, Kellan and I headed over there to watch since nothing else was happening. After playing some pepper, Muni ran some sprints. Check out those fancy shoes he is wearing. When he wrapped up the running, Muni and Anthony started walking back to the dugout, and all of the fans hanging out down the line were completely silent…except us. 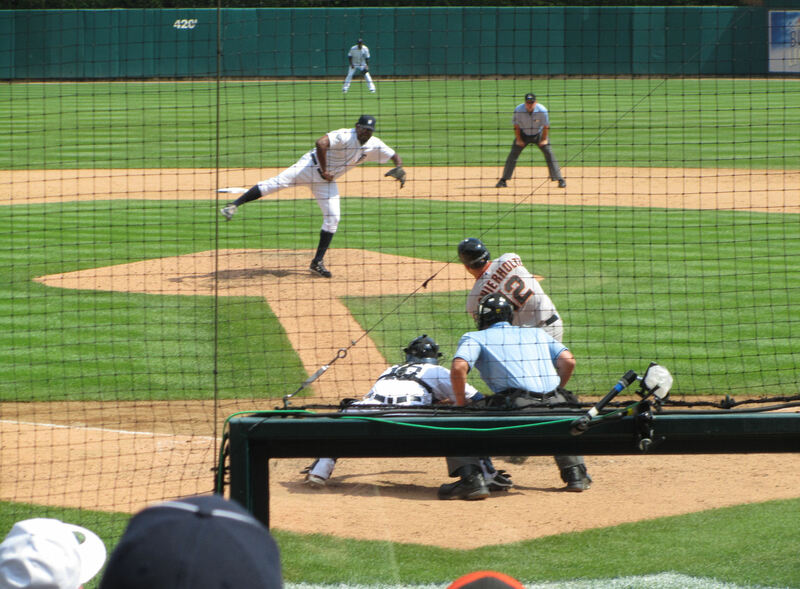 I called out a simple, “Hey, Muni!” He looked over and then did an exaggerated backspin to crow-hop before gentling tossing one of the two baseballs he’d been using to us. No problem, an English Muni-autograph was just fine for us. Check out all of those fans! Man, it was packed! They had to stop and wait for the band that played the national anthem to finish marching by before they could get to the bullpen. 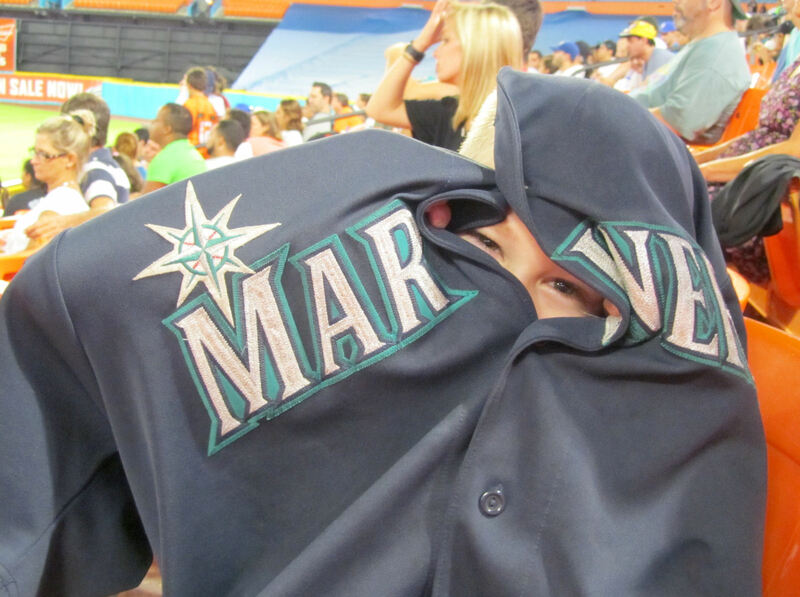 With the 2-0 lead in hand, the Mariners never looked back. 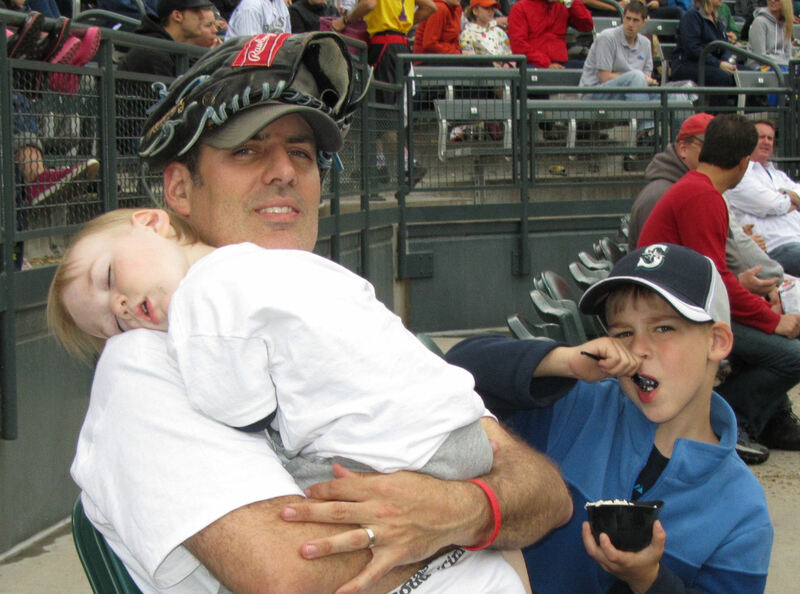 And he just kept on sleeping until THE SIXTH INNING! It was great chatting with these guys. 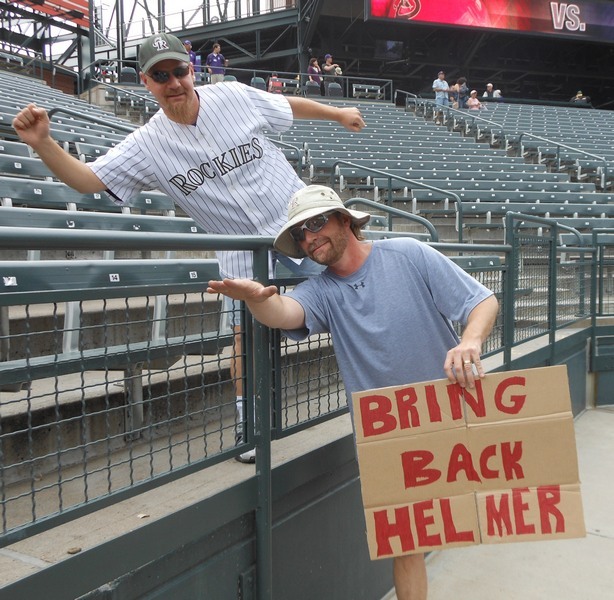 Sadly, I did not get a picture of the “Bring Back Helmer” sign that Hunter periodically held up for the TV cameras. (It looked a whole lot like this). 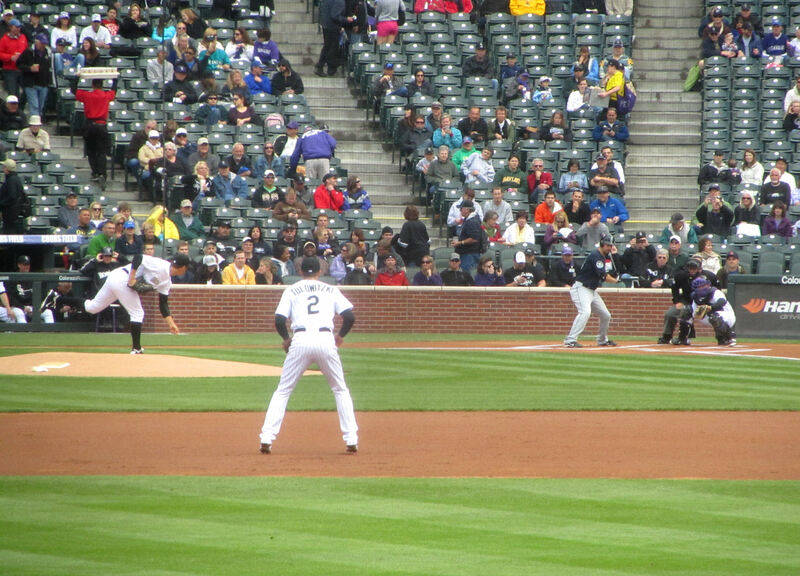 If you click on that picture, you can see the ball just to the left of Ichiro and just barely above his head level. Unfortunately, Tulowitzki made a diving catch on the ball. …, and 4 more in the sixth. That made the score 9-0 Mariners. 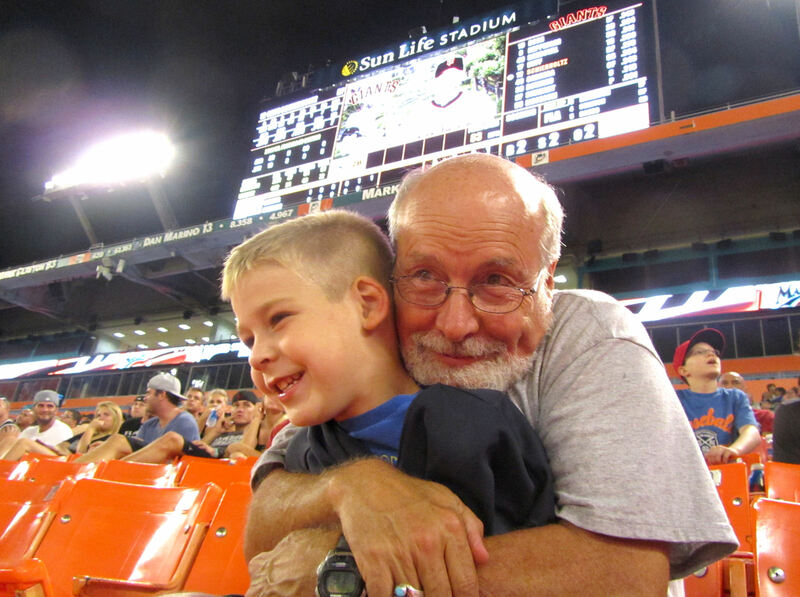 Don didn’t like the score so much, but I sure did. And Kellan would have too if he was awake. Eventually, I headed further out toward LCF to see my dad and Tim. Kellan was mighty satisfied holding it all wrapped up in cellophane. But he was still a little cranky from his nap. When I unwrapped the shirt, Kellan gave me a piece of his mind. Apparently, he wasn’t ready to see it unwrapped quite yet. 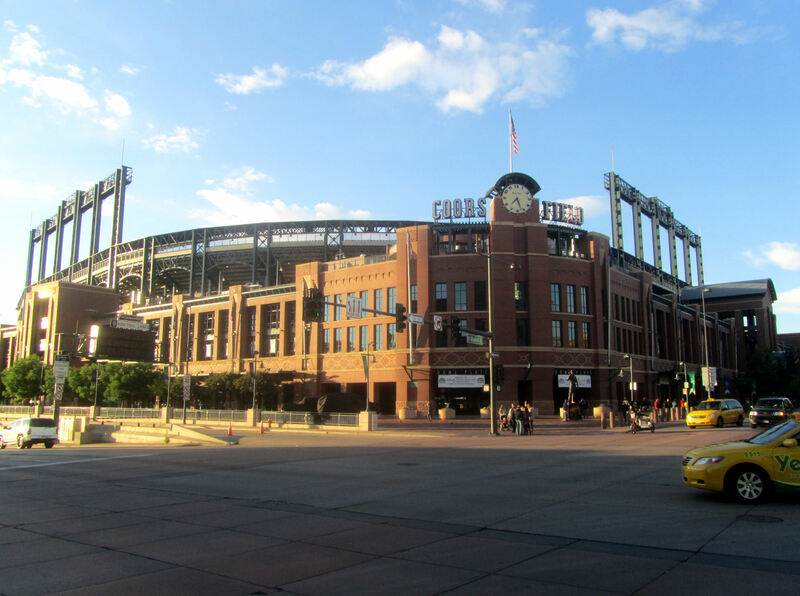 Before this trip, I knew about Robert from the Rockpile Rant and an article Zack Hample wrote about Barry Bonds’ final career homerun. Robert was very nice and he and my dad got along swimmingly during the game. Top left: There is some sort of security office under there, right around the corner from the women’s restroom. Top middle: There was a brief rain shower late in the game. The game wasn’t delayed at all, but we hid out for a few minutes in the tunnel where this was our view of the field. We ended up putting our backpacks in the tunnel for the rest of the game to keep dry. It is definitely convenient having your own personal tunnel like this for a game! Top right: Tim, Emily and Emily’s friend played tag in the tunnel. This was just one of the many things they did to entertain themselves in the tunnel. Kellan tried to mix it up with the big kids a bit too. 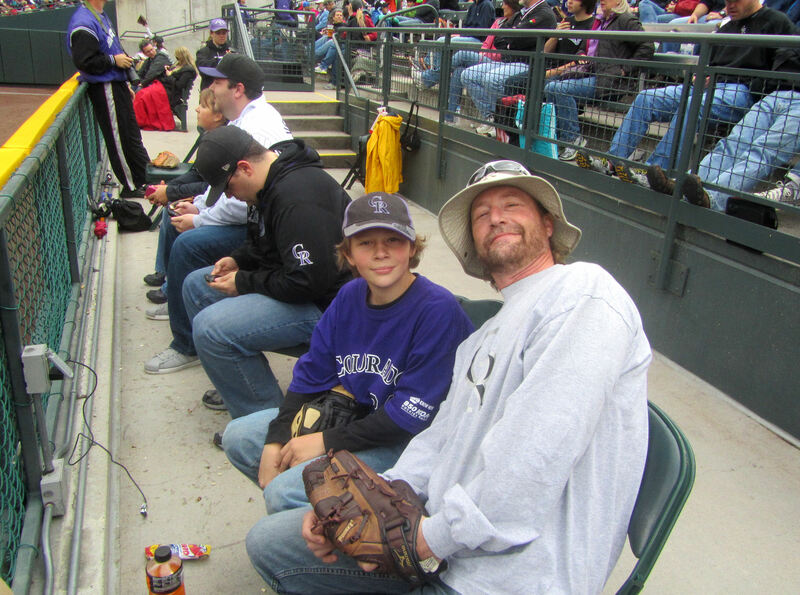 About 5-10 minutes before the rain, the Rockies scored three runs in the bottom of the seventh inning. The final two runs came on a homerun hit by Wilin Rosario that sailed right over our heads into about the sixth or seventh row of the bleachers behind us. 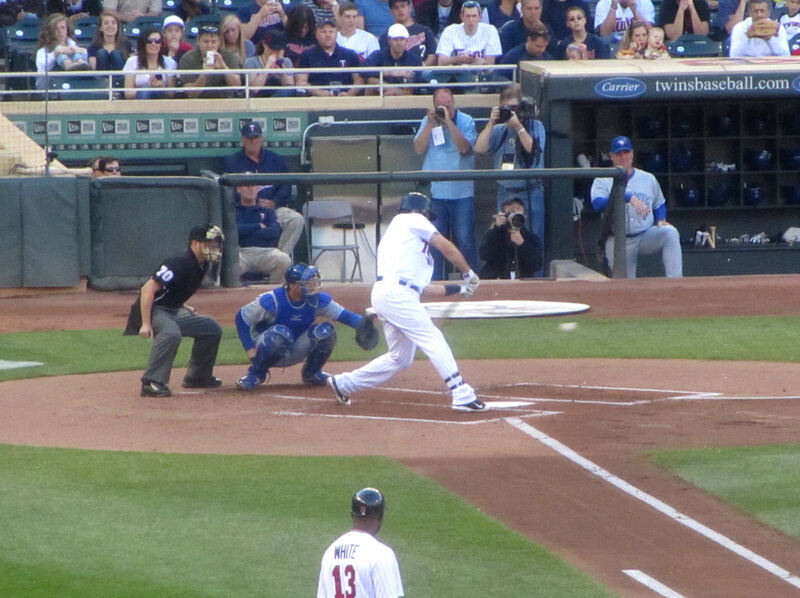 I was hoping it would ricochet back down to us (my Dad had caught a Miguel Olivo BP homer like this the day before and Robert got a Michael Cuddayer game homer like it earlier in the season), but the crowd swallowed it up, never to be seen again by us folks down in the first row. …and the ball almost certainly would have bounced back down to us. 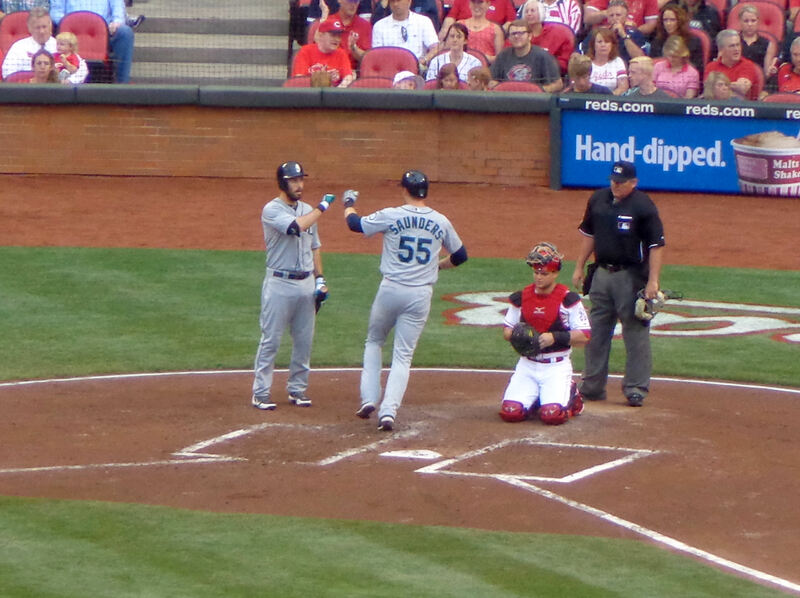 The Mariners got one run back in the eighth on a passed ball to Kyle Seager that scored Ichiro. That made it 10-3 Mariners, which would hold up to become the final score of the game. 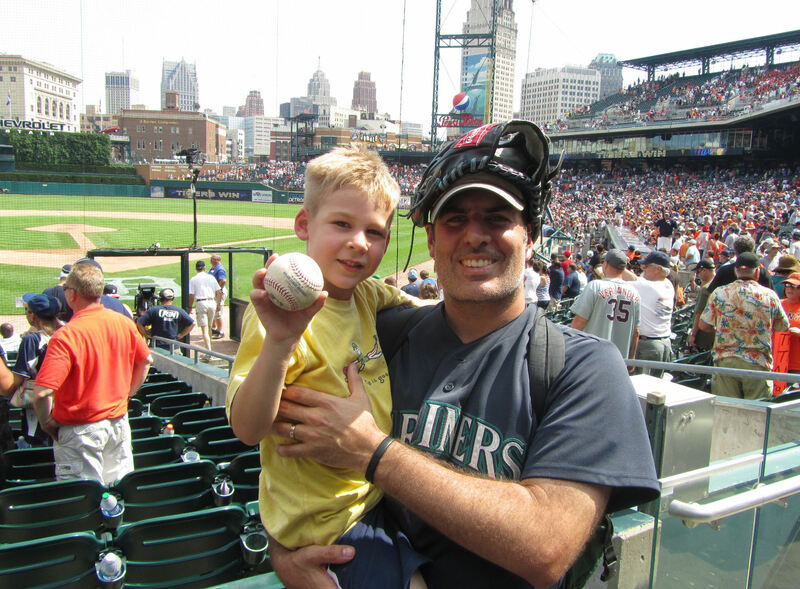 …tossed the CF-LF warm up baseball into the crowd in the ninth inning. There were zero fans in the front row out in CF by the batters’ eye. 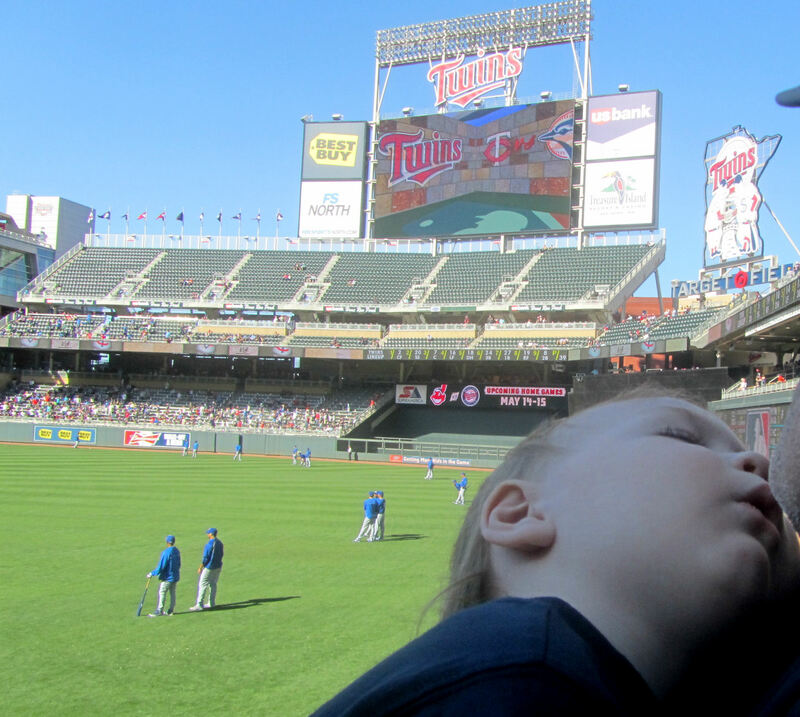 So I figured that Kellan and I ought to head over there in the ninth so Saunders would have a target. It was a solid plan. 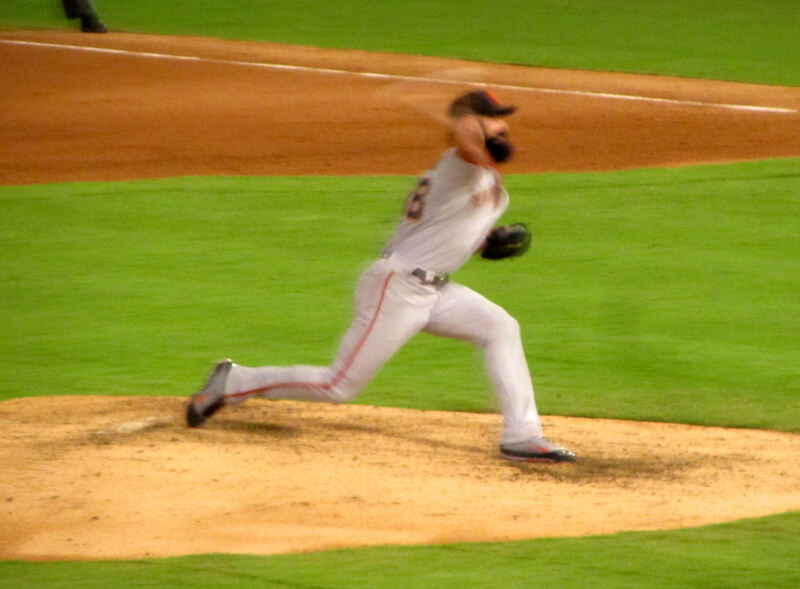 After finishing his ninth inning warm up tosses with Casper Wells, Saunders turned and threw a strike right to us. Another Dodger Stadium commemorative! Sean Kelley and Steve Delabar each pitched a scoreless/hitless inning of relief to cap off the game. 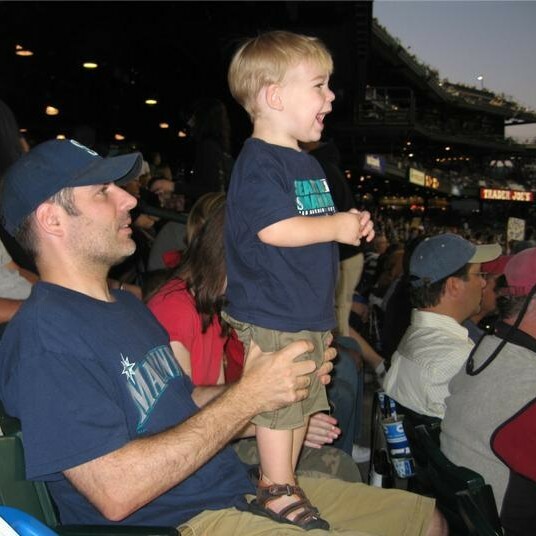 Another wonderful Mariners win! That made them 2-0 for us on the season. The key to that picture was that Tim had his foot up on the step above us. He thought this made the picture look very, VERY cool. And then we headed over to the 15th Street Mall for some dinner. It was an OUTSTANDING trip. Let the planning begin for the 2012 GFS Roadtrip! 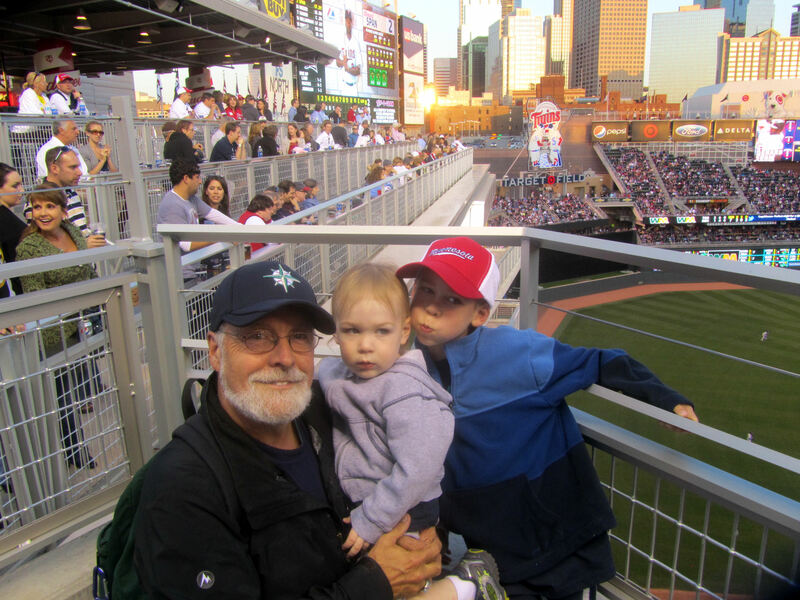 The 2012 Cook Grandfather-Father-Son Baseball Roadtrip is extra special for several reasons. First, it is the Fifth Anniversary of the GFS Roadtrip. Second, we have expanded the GFS roster to include Kellan. 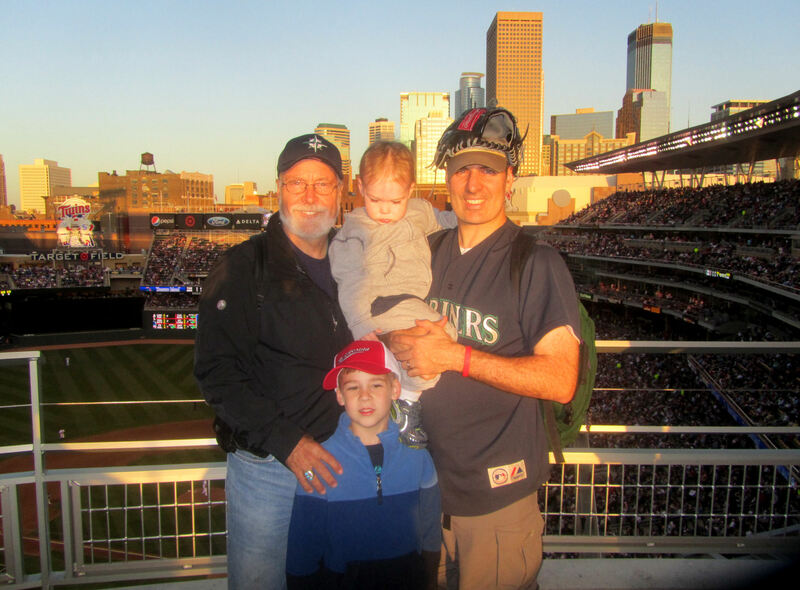 And, finally, by checking off Busch Stadium (Cardinals), Kauffman Stadium (Royals), and Coors Field (Rockies), Tim and I would finally have seen all 30 MLB teams play a home game – we had already seen all 30 teams play a road game. 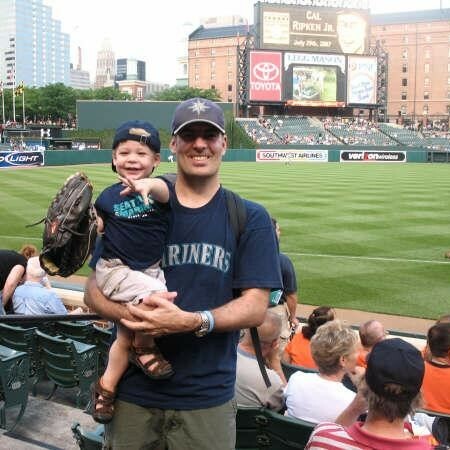 I wanted the Mariners to be involved in the game when we saw our final team play a home game. 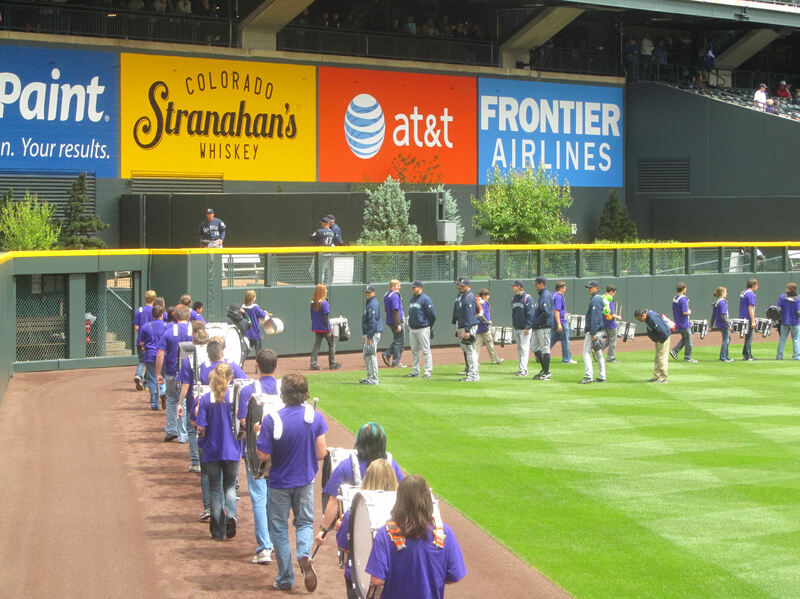 During the offseason, I decided it would happen in Colorado when the Mariners visited the Rockies in May. The Roadtrip kicked off on May 12, 2012. We started in Minnesota. It is the first city we have visited on two separate roadtrips. We went to the H.H.H. 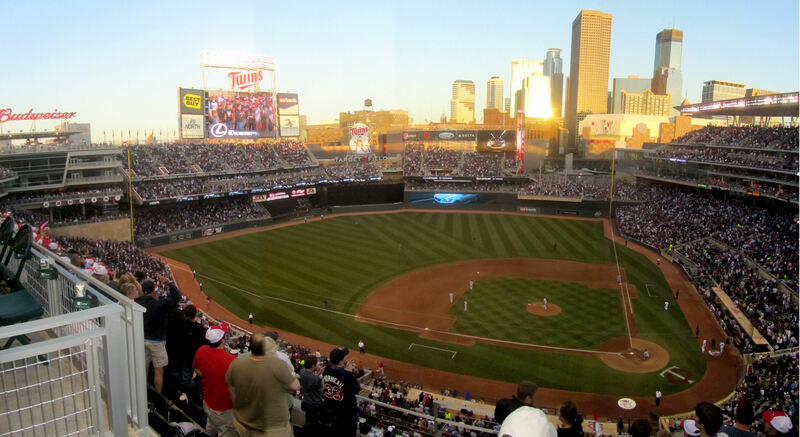 Metrodome during its final season in 2009. 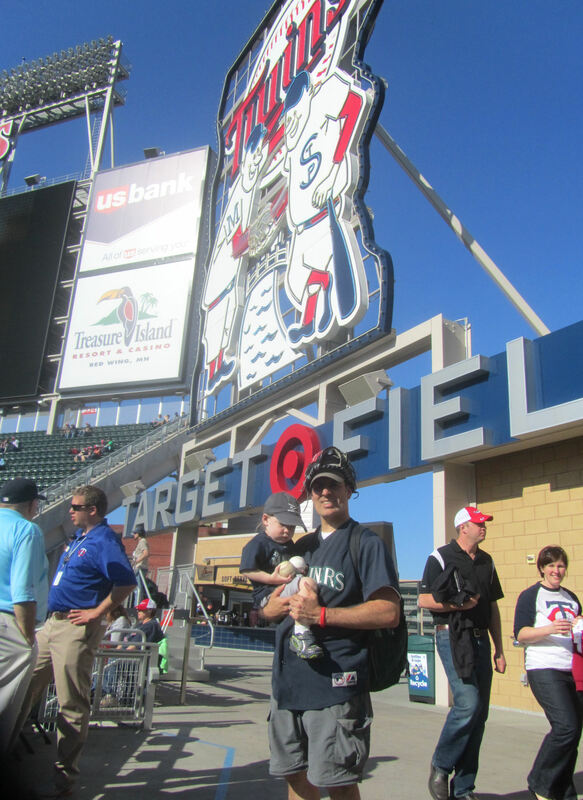 And now we were back to check out Target Field. …and this will officially be Kellan’s final “infant on lap” trip. He’s getting to be huge these days. But we have a nice flight nonetheless and were greeted by my dad at the gate. His flight had landed about half an hour before ours. 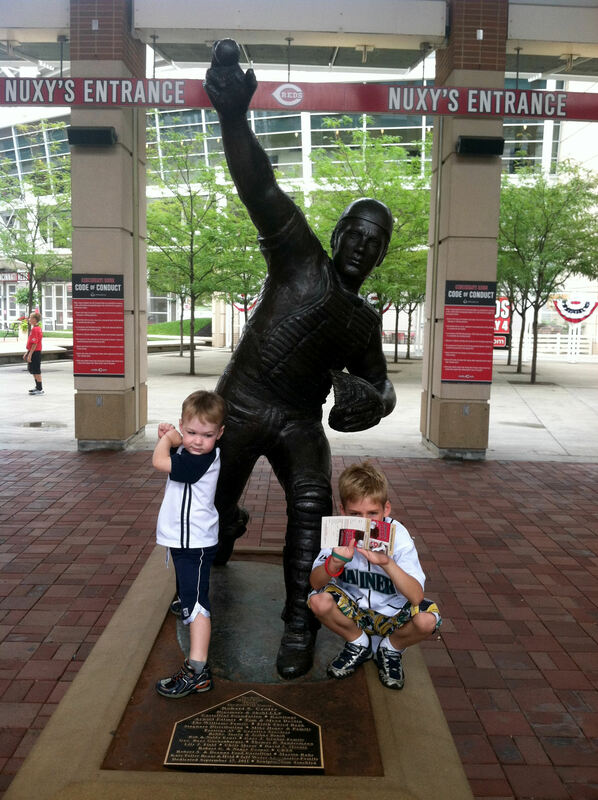 …and then headed around the stadium to the shaded Tony Oliva gate. 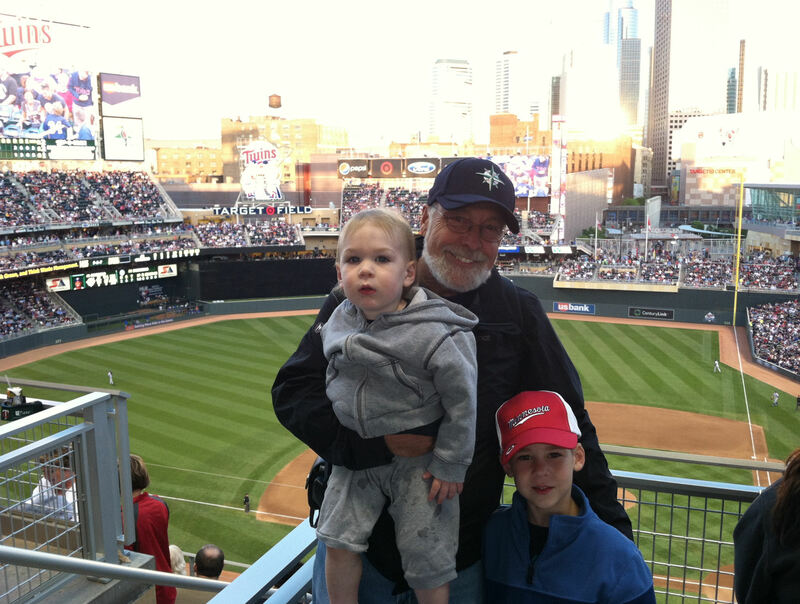 …gave us a smile as he walked by so I asked if he’d pose for a picture with Tim and Kellan. He said he would after he played catch. I asked, “Ah, then, could we get your warm up ball when you’re done too! ?” He said yes and then headed off to play catch. 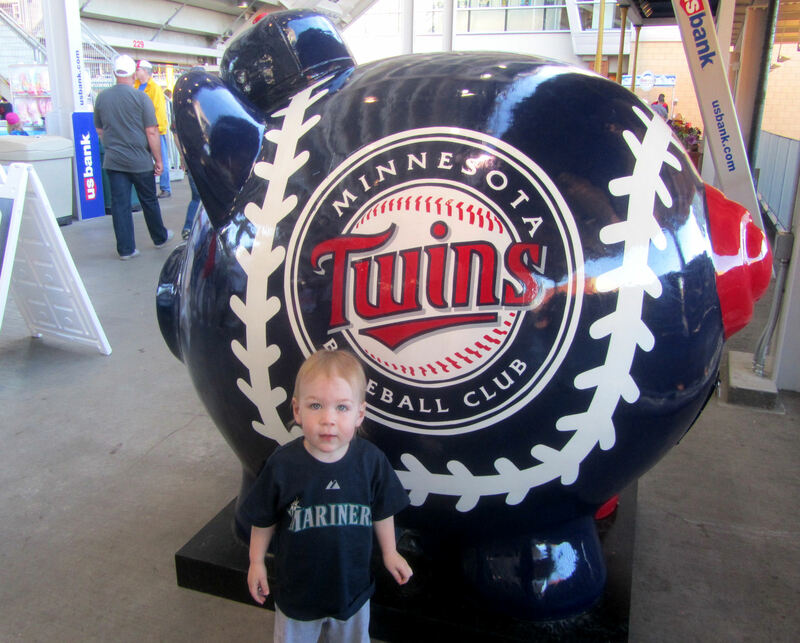 But then he must have decided he didn’t want to forget about us, because he walked back over to us a minute later and handed Kellan our first ever baseball at Target Field. 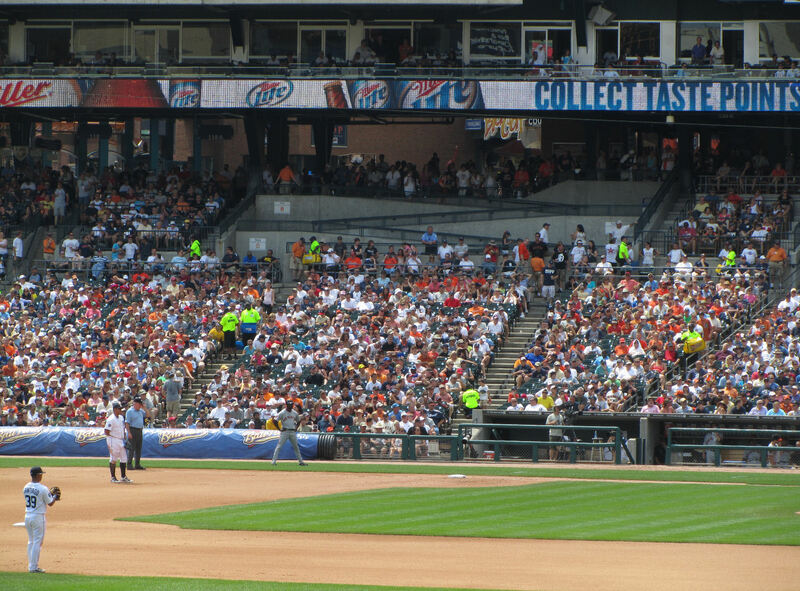 In the picture above to the left, Rajai is all the way out in CF playing long toss. While we were watching Davis play long toss, the on-field security guard to the right grabbed a ball that had been hit against that protective screen and he walked over and handed it to Kellan. That was it for BP as far as baseballs go. 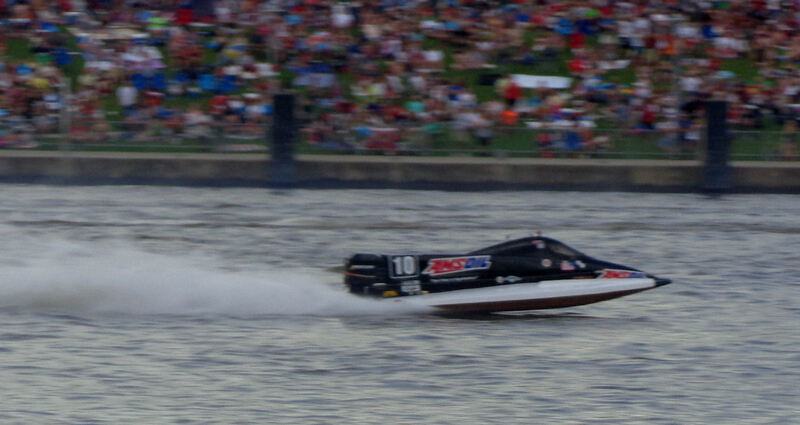 And we never got any closer to Davis. He drifted off into CF after finishing playing long toss. …, but it was too hot and sunny and Tim surrendered to the sun. He was going to burst into flames if he waited any longer for Perez. So, sadly, we did not get a picture with a Blue Jay. 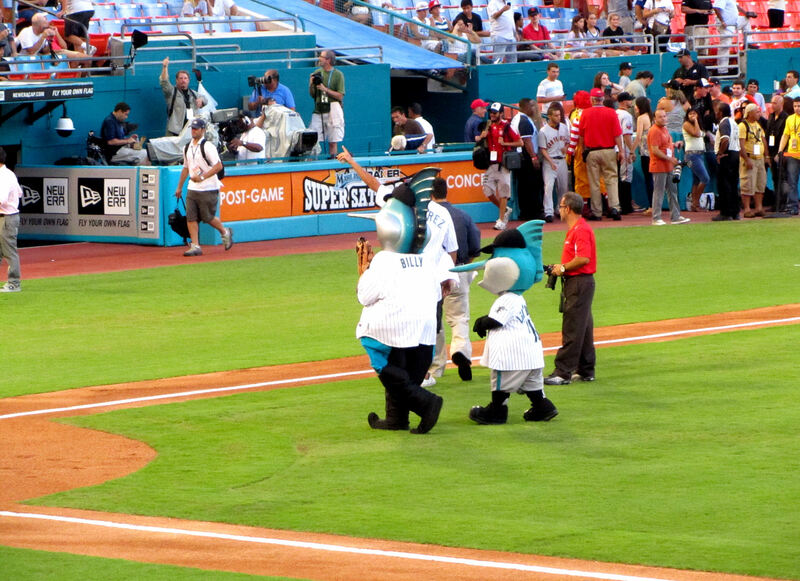 The mascot blasted 6 bombs on 7 swings, including one that hit the back wall of the upper deck. 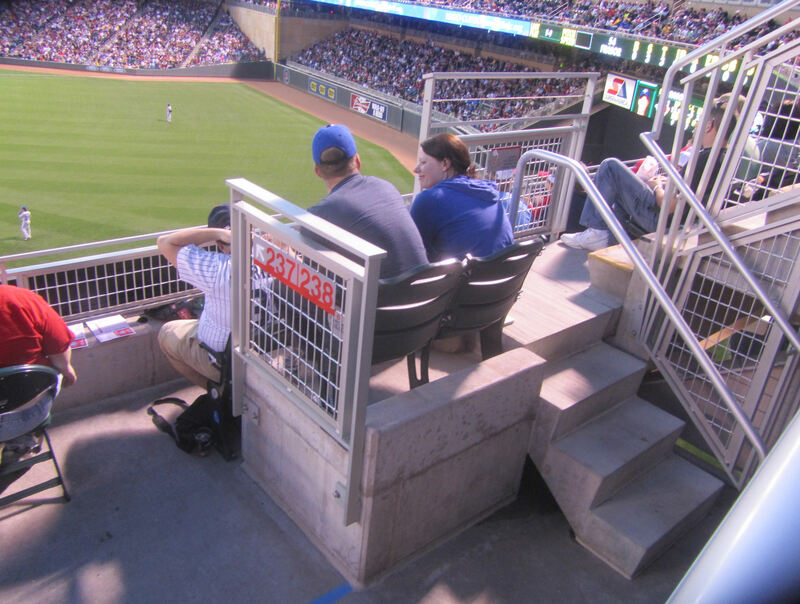 I really liked these seats. They were great. And then it was more running. He ran a lot! They are tucked under the upper deck seats. 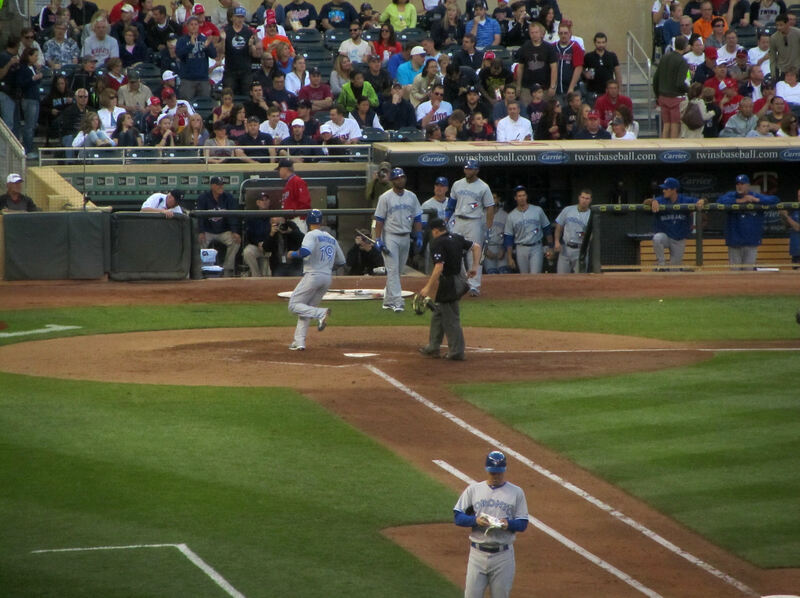 In the bottom of the fourth inning, Hutchinson loaded the bases and then walked in the first run of the game for a 1-0 Twins lead. Those are some sweeeeeeet helmets. I love ‘em. These are our first two-tone helmets. 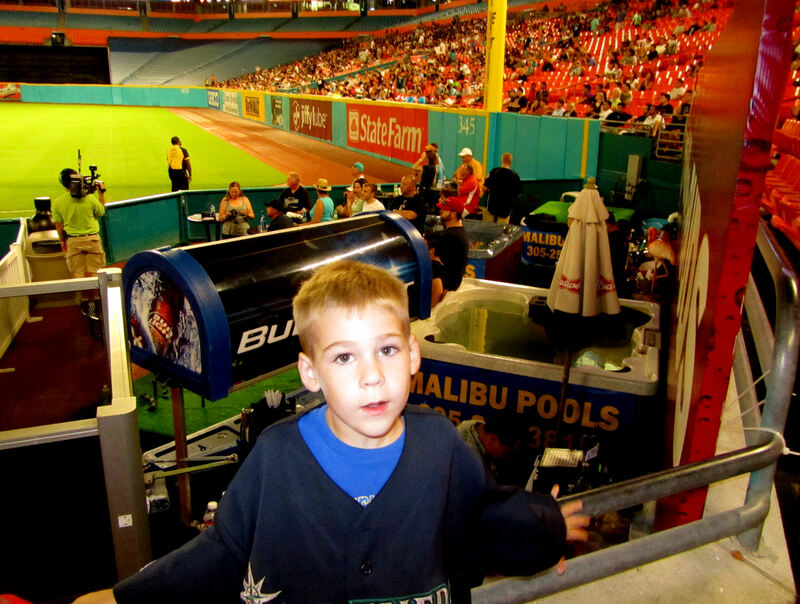 On the last game of the 2011 GFS Roadtrip, Johnny Damon hit a ball off the top of the RCF wall at the Trop. They called it a homerun. I could tell with my unaided eyes that it had hit the bar on the top of the fence and bounced back onto the field without leaving the ballpark. They reviewed it. And eventually Damon was told to head back out to second base. 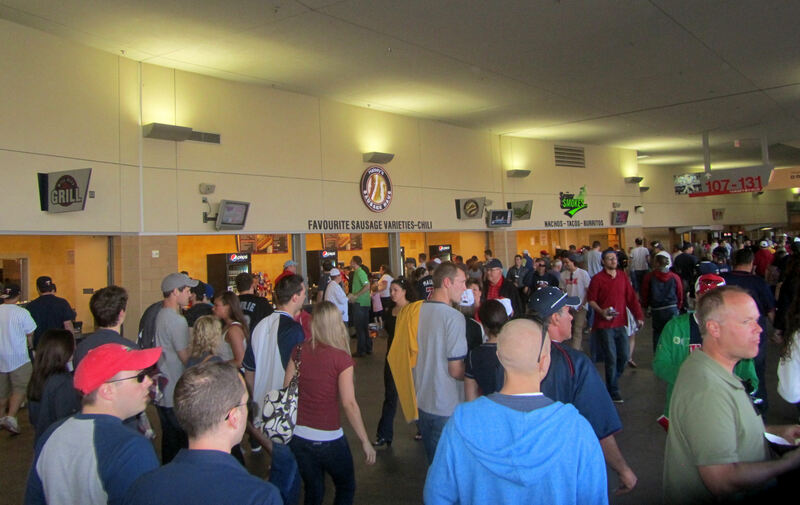 There were a lot of people in the concourse up there too. 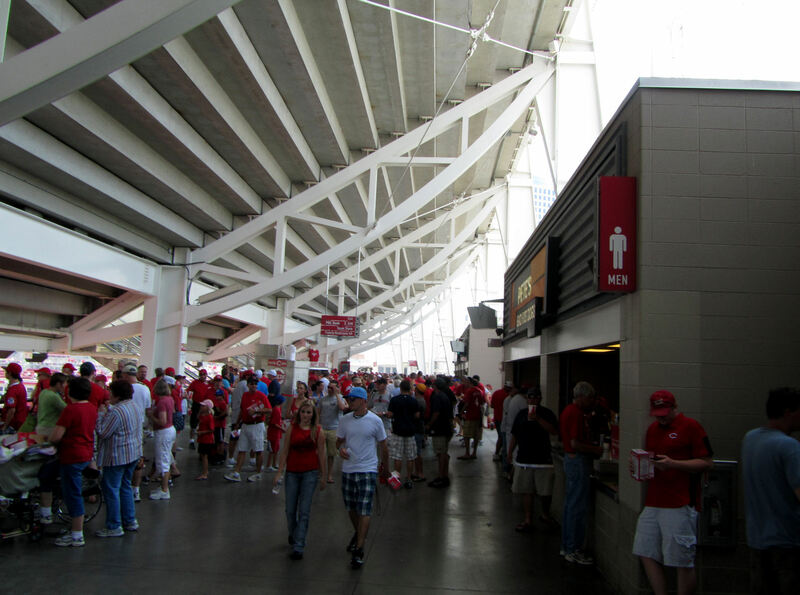 Unluckily, as you circle around home plate, there is an elevated walkway so you can stay out of the concourse. …and he warmed me that the sun would blast us in the face in the photo. All you can see is the right fielder and a TV screen. On the plus side, it is completely shaded (under the RF bleachers). …and one of Tim in front of the Twins Live set. The Blue Jays had pulled ahead to a 2-1 lead, and they held on to win the game, which pleased Tim. He had declared the Blue Jays to be his team to win early in the game. 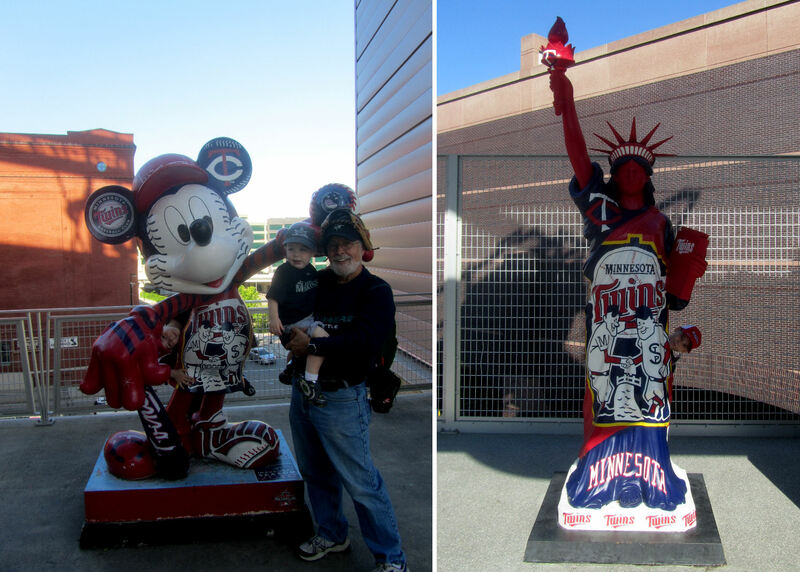 …and it took Tim a few minutes to realize I had duped him into posing for a Target Field bonus picture. Haha!! So there you go. One game down on the Roadtrip. Another great night and another great stadium. 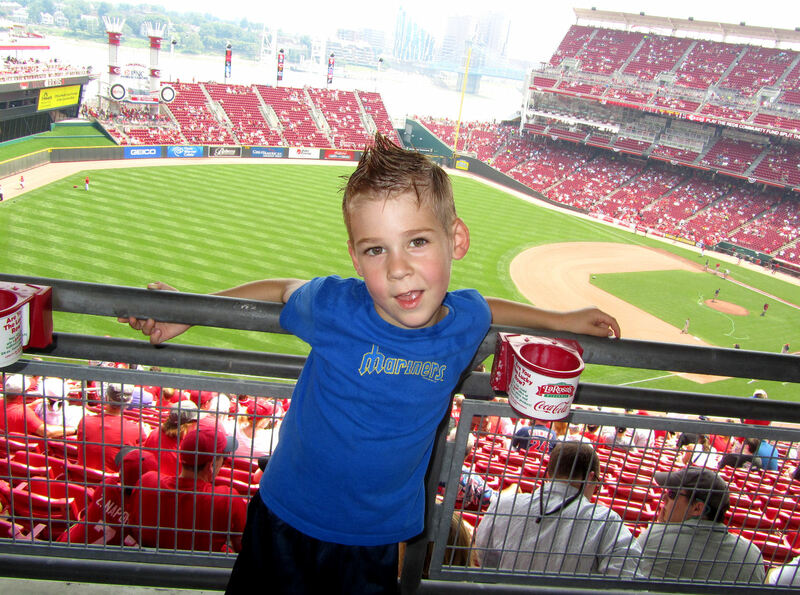 In the morning, we would drive to St. Louis for a couple games between the Cardinals and Cubs at Busch Stadium. It would prove to be a super long drive, but well worth it. 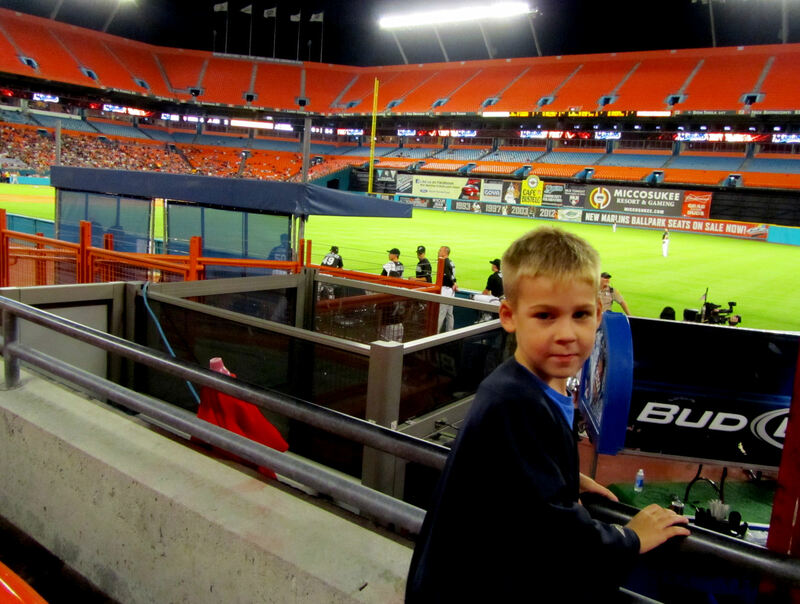 …Sun Life Stadium! Note: that port-a-potty out front of Gate F is just one of the many luxury amenities the Marlins offer at the ballpark. From a snagging a baseball perspective, my base goal was to get at least one baseball at each of the three stadiums we are visiting on this Roadtrip (Sun Life, Turner Field, and Tropicana Field). 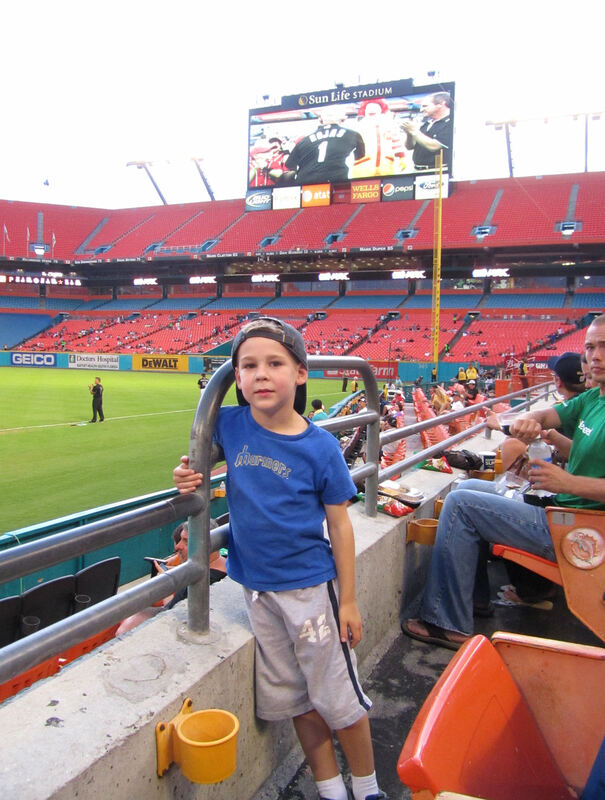 As far as Sun Life Stadium goes, I was counting on this being our best bet. It was a Saturday night game (presumably) with batting practice. But then it started monsoon-caliber rain at our hotel about 15 minutes from the ballpark. 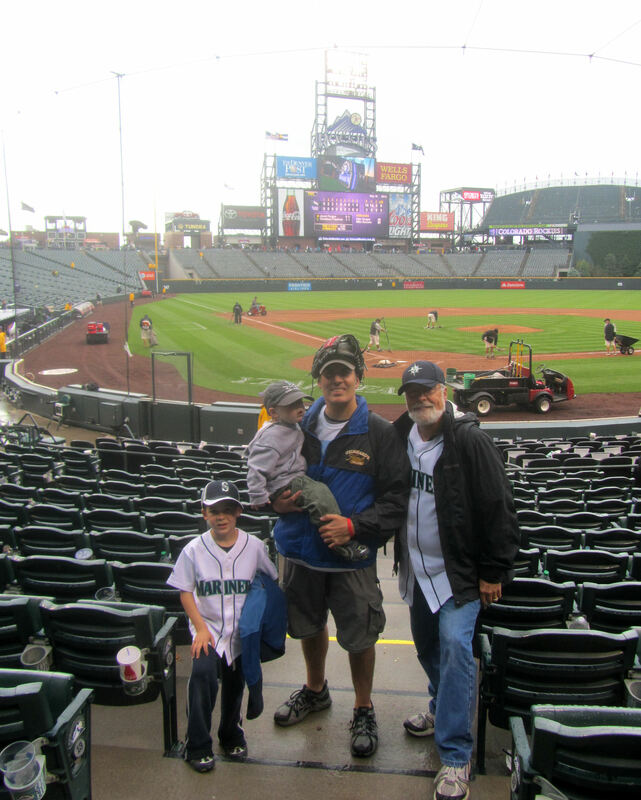 The gates weren’t scheduled to open yet, but we decided to head up to the ballpark anyway and just roam the concourses while clouds drained out all of their rain. But then an amazing thing happened. It was serious Noah’s Ark type rain at our hotel, but it was completely dry at the ballpark. So we ran into the ballpark when it opened and were happy to find the Giants just starting to take BP. proving to us that they) do not like fans. 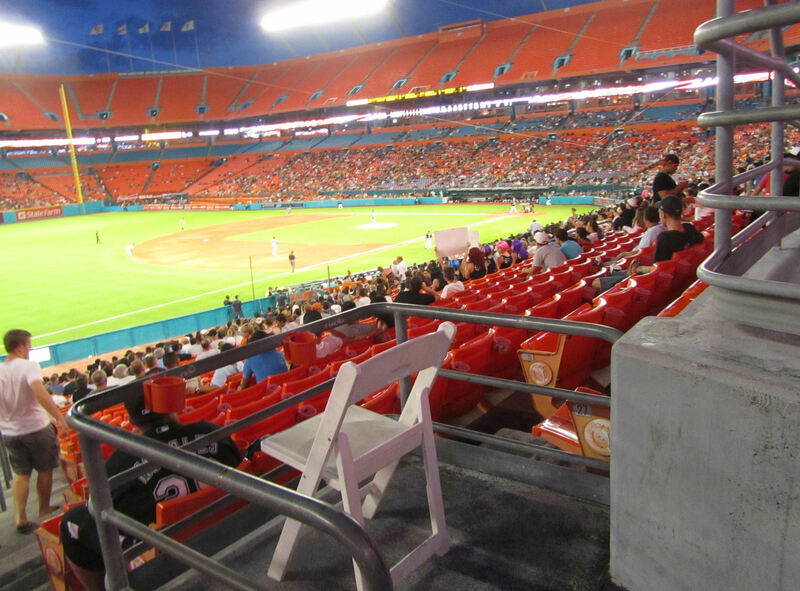 the bat – Sun Life Stadium punished me for this in the form of trying to break my shin on a cup holder bolted to the back of the seat in front of me. Ouch. 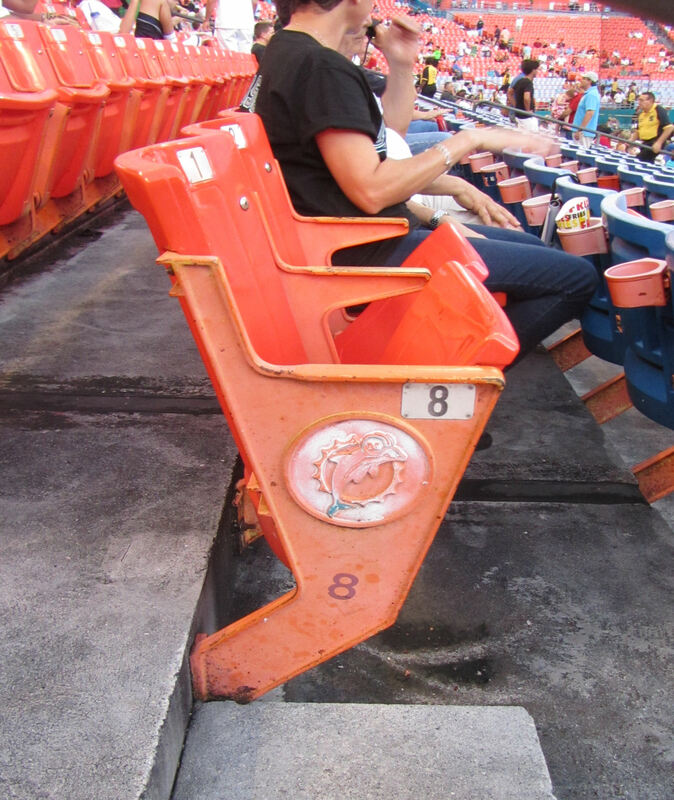 A word to the wise: at Sun Life Stadium, the rows of seats are narrow, the cup holders make them even narrower, and many of the seats fail to fold up. So there are many, many opportunities to bash your knees and shins while passing through the aisles. 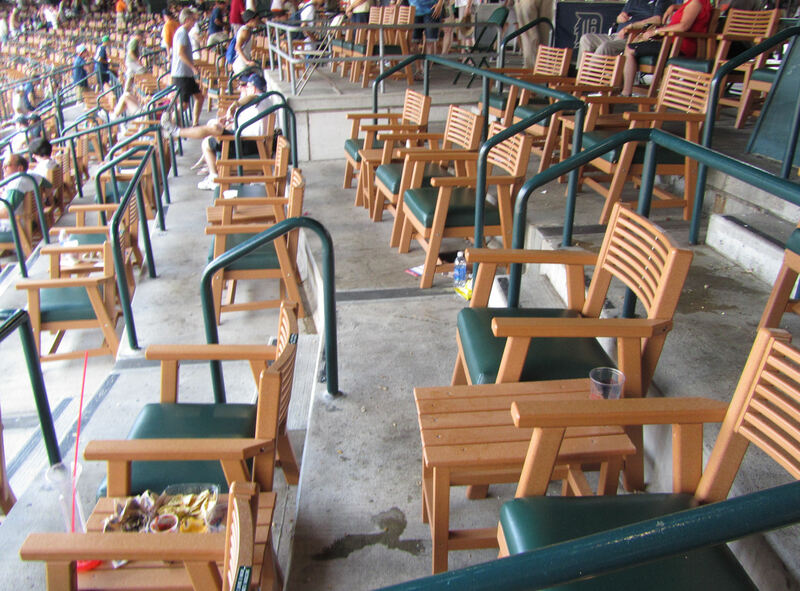 Meanwhile, the Giants literally tossed zero baseballs into three sections of seats in RCF. BP ended with us still looking to secure our first ever baseball at Sun Life Stadium. Our chances were not looking good and I was fearing that we might never get a baseball at this soon-to-be retired “baseball stadium.” Even worse, without getting at least one baseball, we would not be able to get a Sun Life Stadium bonus picture point for the myGameBalls.com photo scavenger hunt! basketball pop-a-shots, two football accuracy throwing things, and two baseball strike zone throwing things. 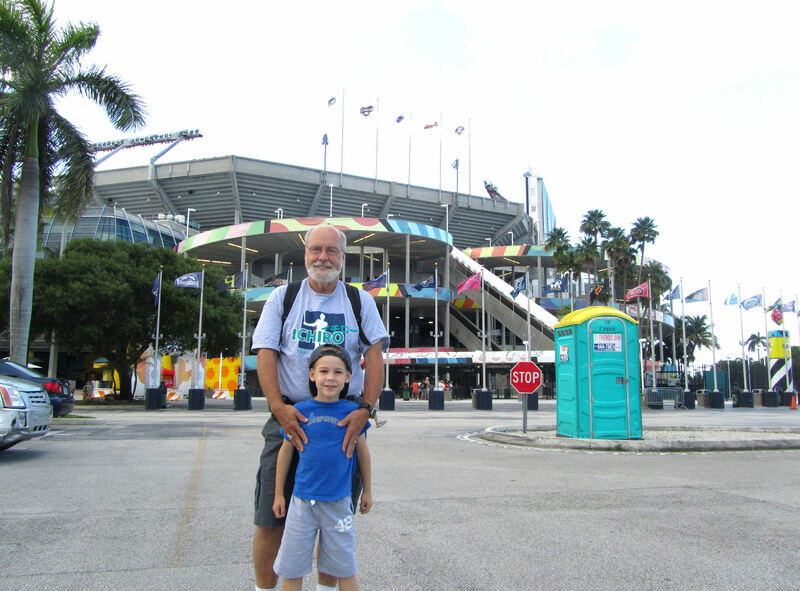 While my Dad wandered around looking for a hat and Sun Life Stadium baseball (FYI, they don’t have them) in the team store, Tim and I shot tons of hoops, tossed a few footballs, and pitched many, many strikes. 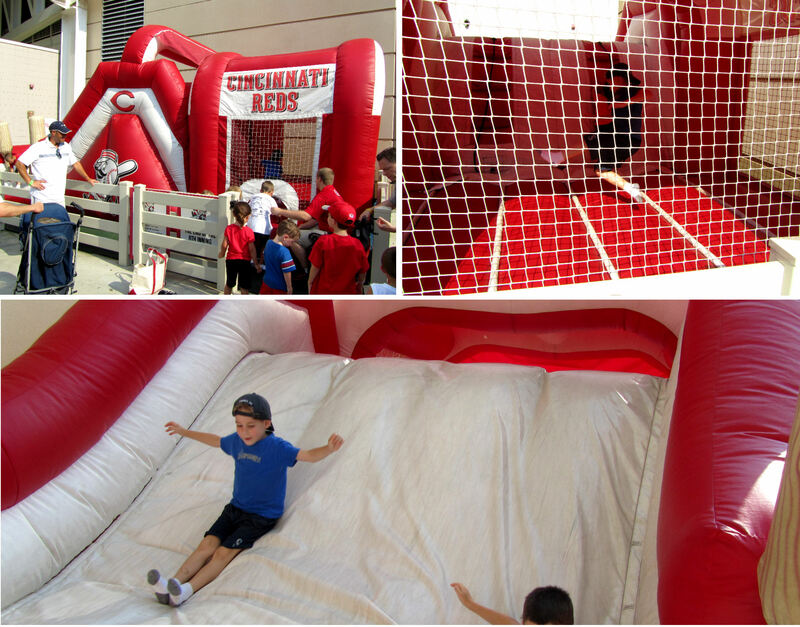 After the play area, we started the process of walking around the ballpark. 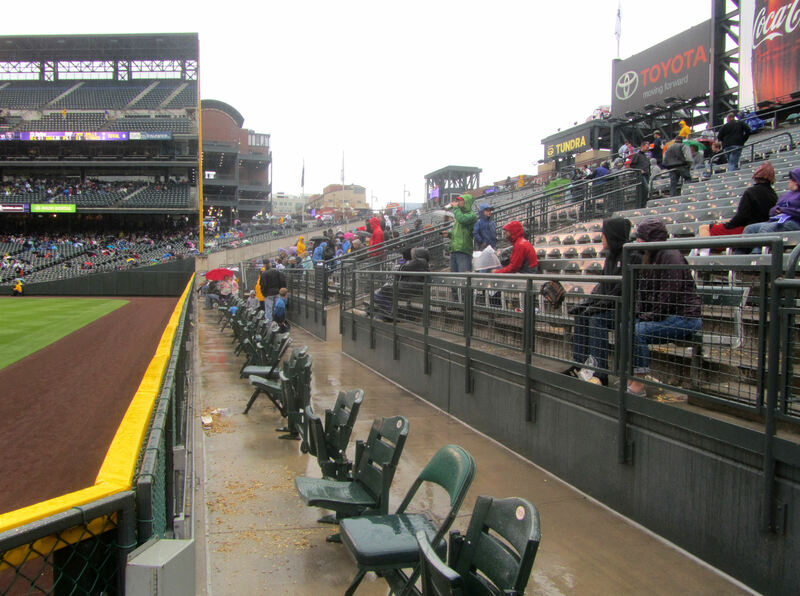 It was a shorter process than normal because the entire upper deck was closed, and the LF concourse is essentially unused. …but the cheese ran out prematurely. The problem was that they only had one cheese holder and didn’t pour any cheese directly onto the chips. 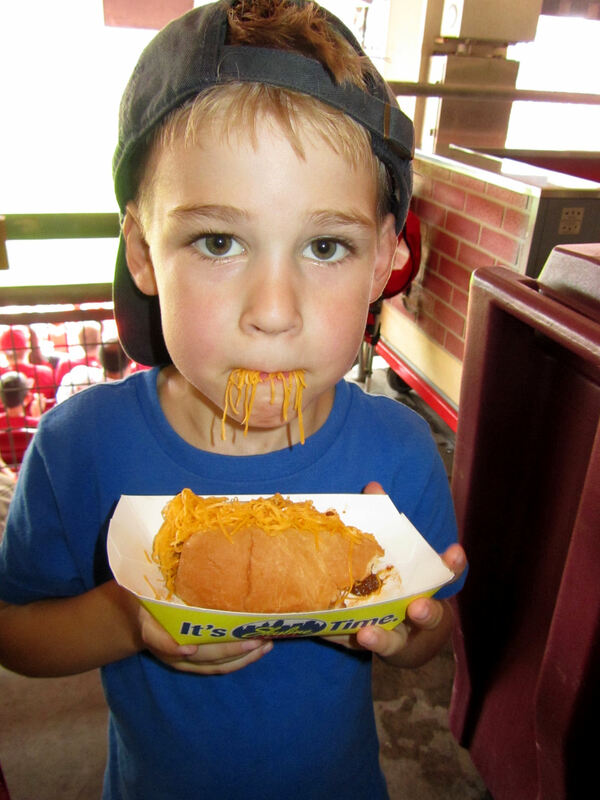 That’s just not enough cheese. 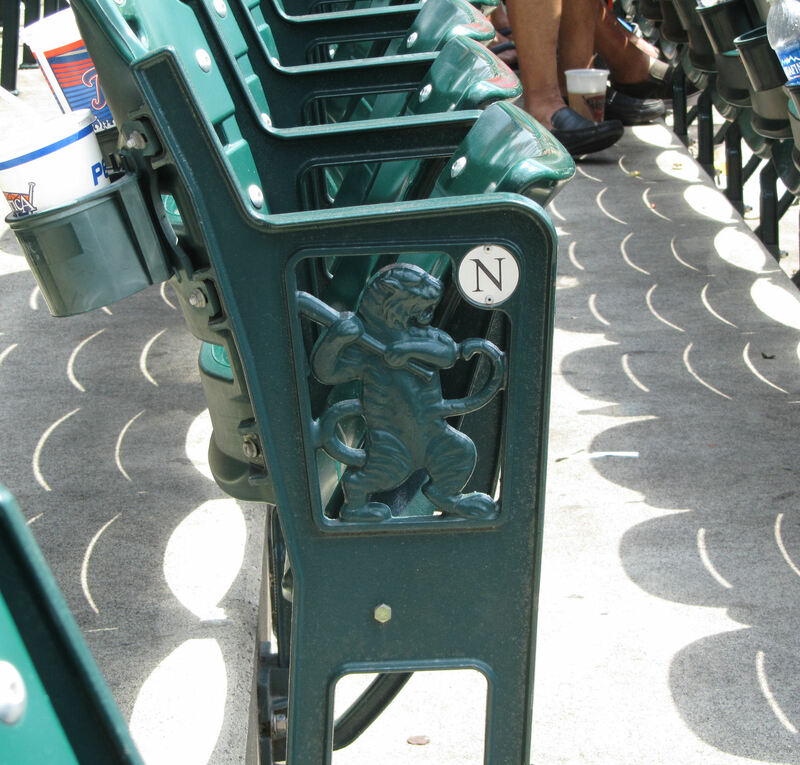 Yep, the stadium used to be called Dolphin Stadium, and the end seat on each row is adorned with a dolphin. 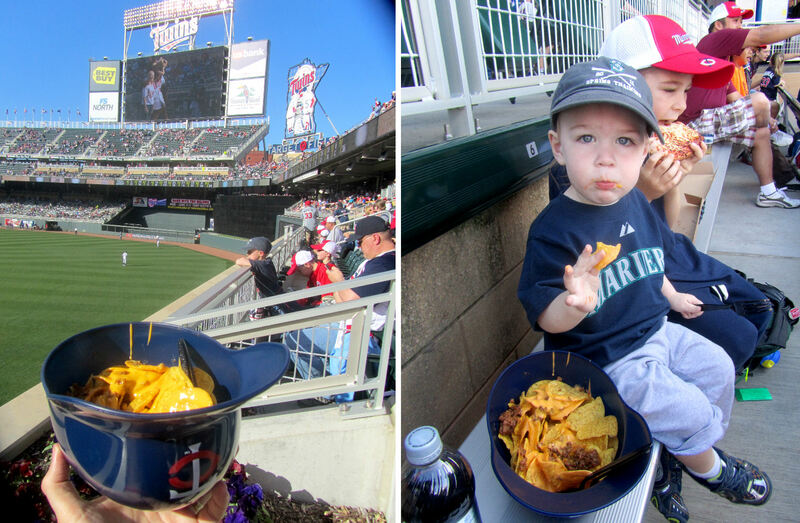 Since there is nothing in left field, we turned around after eating our nachos, and headed back toward home plate. 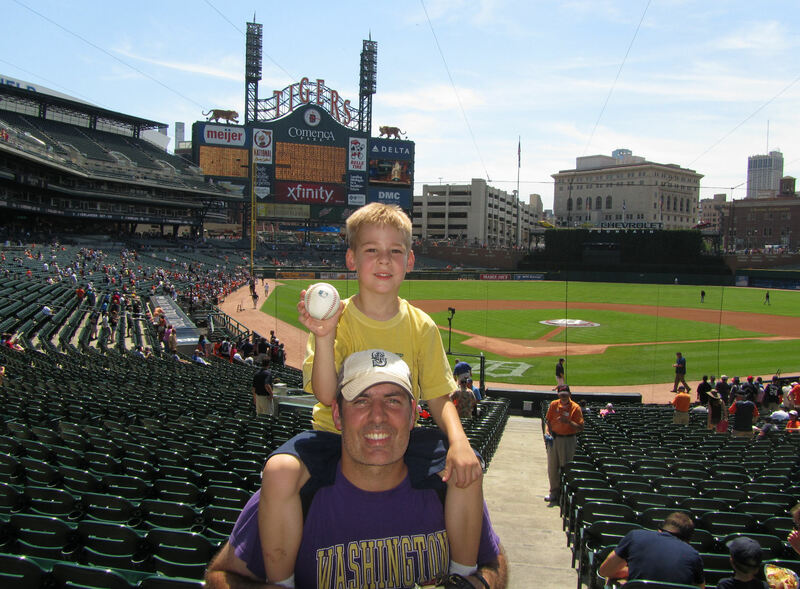 We were still baseball-less, so we decided to make an effort at a pre-game throwing baseball (something that I think we have only ever obtained once – from Ian Kinsler May 5, 2009). I say front row because it is row 1, but there are more seats below row 1. They are right down on the field and you can’t get to them without those tickets. Dobbs scooted way back past first base and played long toss before retreating to the dugout. 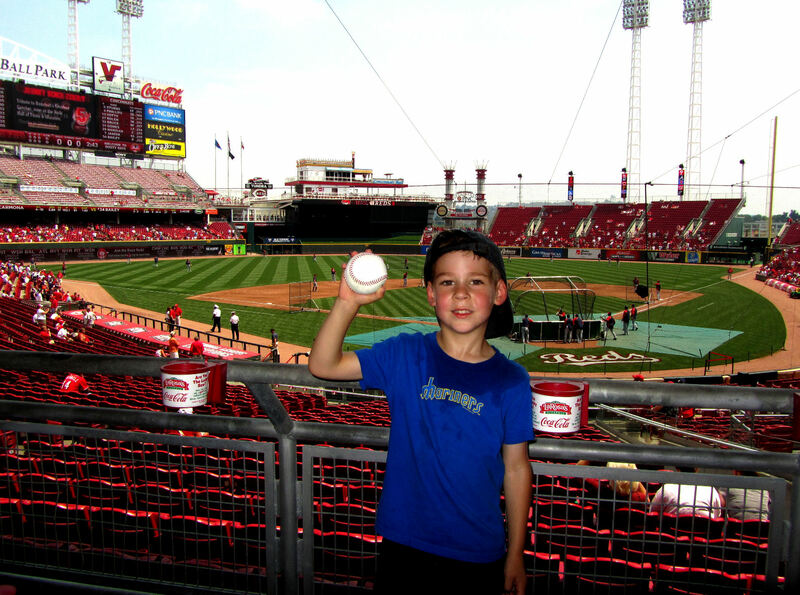 Dobbs was our best chance to get a baseball at this game. He ended up with the ball just 15-20 feet below us. He clearly wanted to give it away. But the music was pumping loud through the stadium and Dobbs just couldn’t hear me. If he had, I’m sure he would have given us the baseball. Instead, he gave the ball to a 20-something fan in the true front row who had not even been paying any attention. Dobbs essentially walked over and said, “Here, take this.” Bummer. 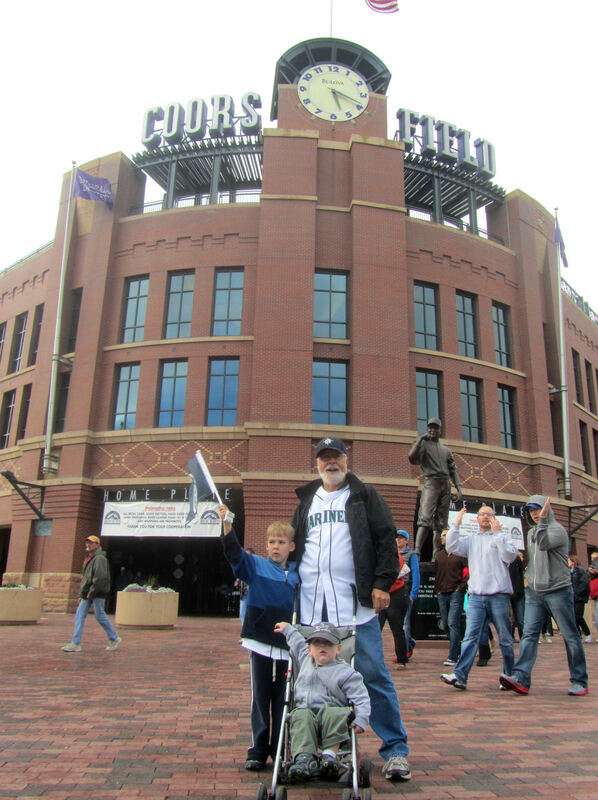 My Dad headed out to RF where we had our tickets for the game. 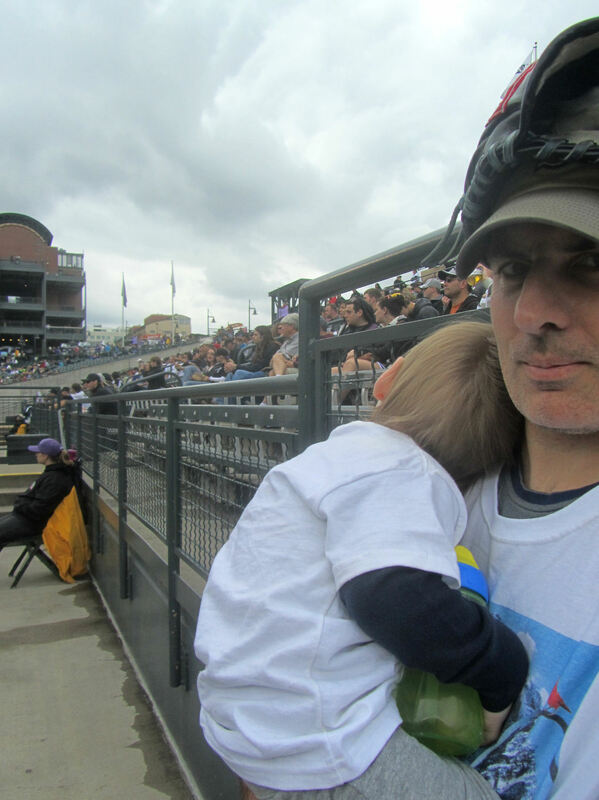 Tim and I hung out behind the dugout for the top of the first inning to see if we could get a third out baseball (something we’ve only ever obtained once before – from Ronny Paulino earlier this season). …and he pitched a very solid game. Eventually, Tim needed some ice cream. I told him I would go get it while he stayed with Grandpa. 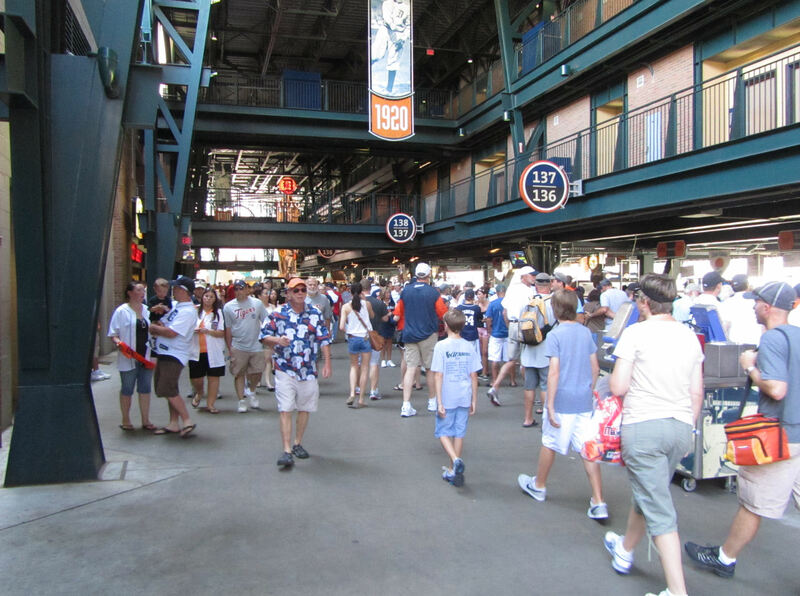 But when I turned toward CF in the concourse, there was no ice cream to be found. It was time to explore again. …and in LF two of the tunnels are open exclusively for cameramen. Meanwhile, in the LF concourse, there is absolutely nothing going on. My thought is that this seat is for the usher patrolling this section. 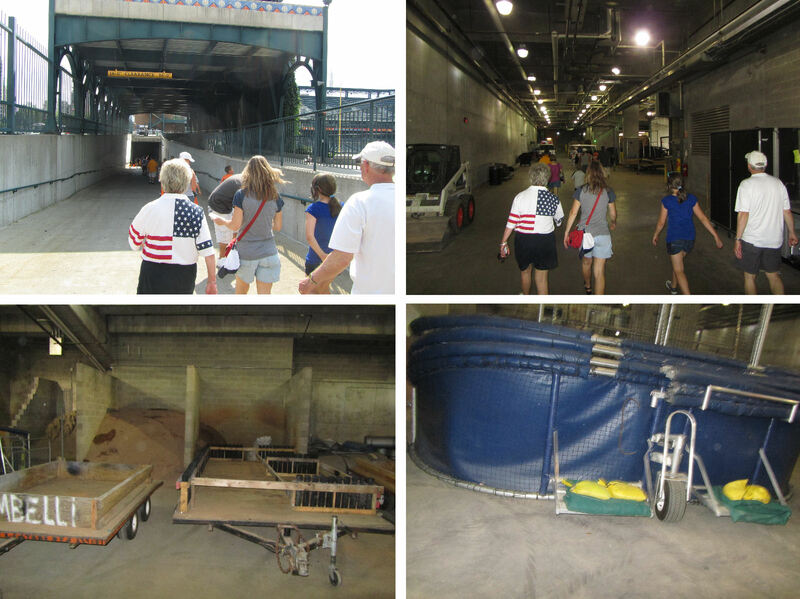 …just past the third base dugout was the umpires’ tunnel. So I surveyed it with my zoom lens and made our plan. 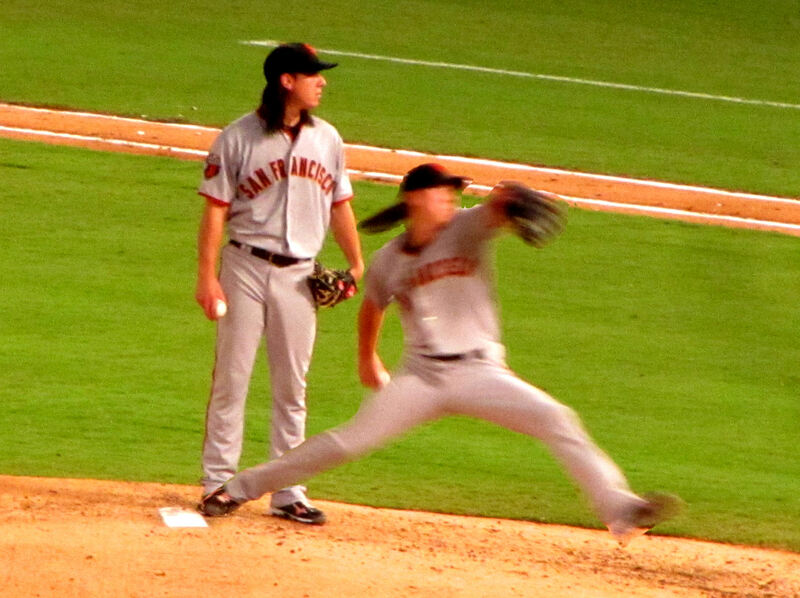 Meanwhile, the Giants tacked on a couple more runs to take the score to 3-0 Giants. 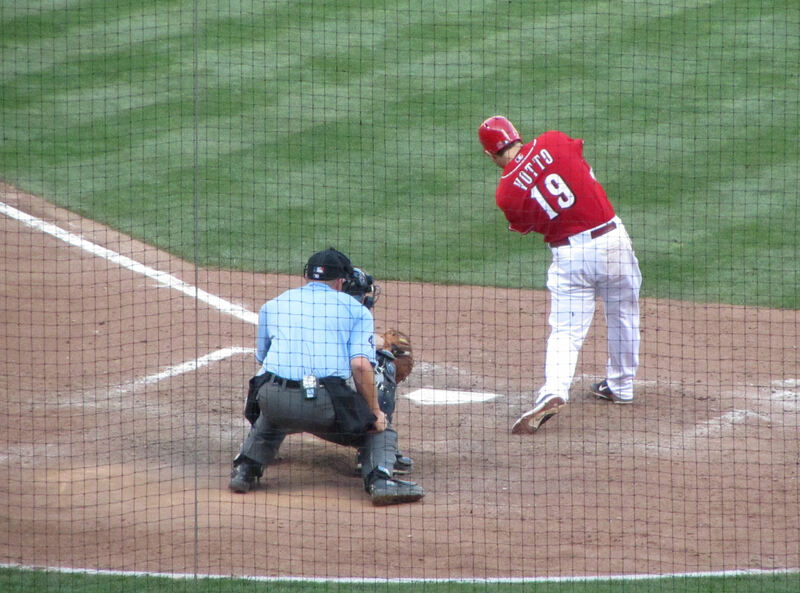 In the fifth inning, Nate Schierholtz scored from third on a wild pitch by Javier Vazquez. And in the sixth, Cody Ross scored on a double by Aubrey Huff. That was all the scoring for the night. He has had some great games for me and Tim. But he went 0-3 at this game. 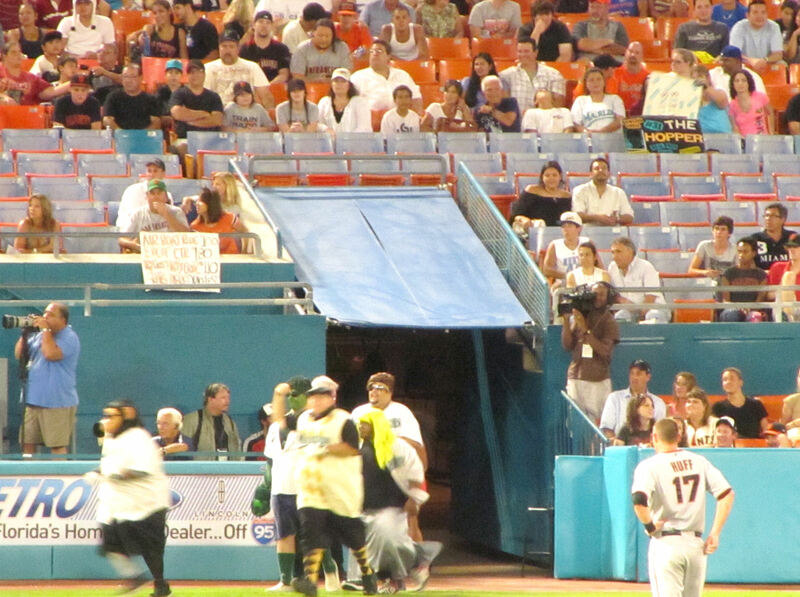 I thought the bullpen set up was pretty odd at Sun Life Stadium. 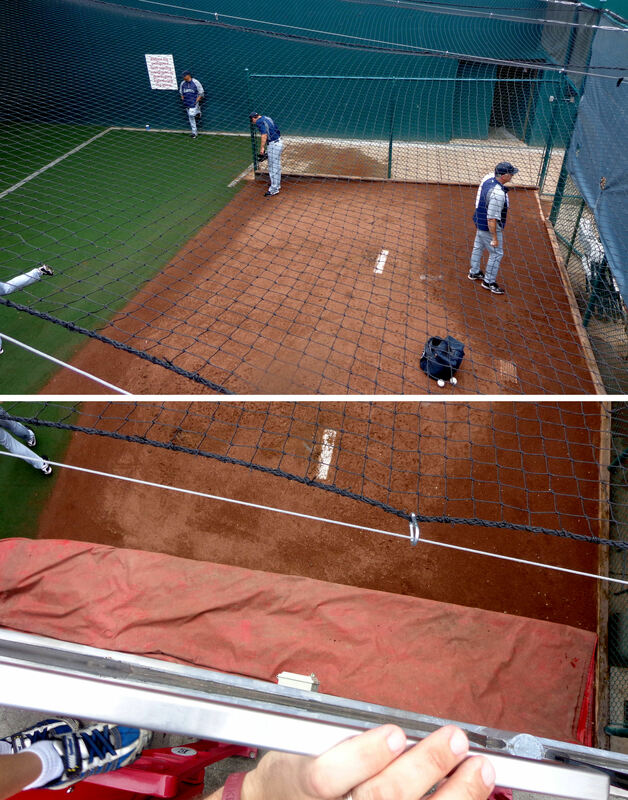 It is not that unusual for the bullpens to be located down the base lines. 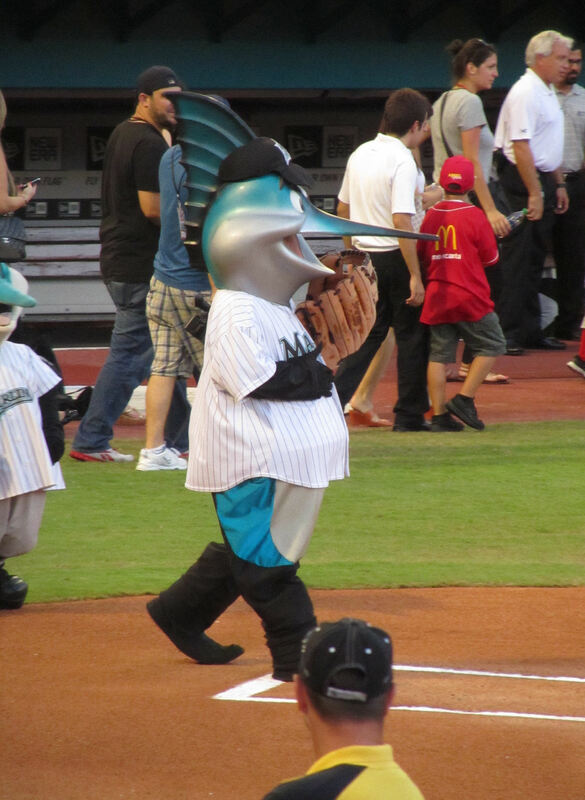 But at Sun Life Stadium, the Marlins bullpen and the Marlins dugout are both on the first base line and the visitors’ bullpen and dugout are both on the third base line. That’s odd because usually a baseline bullpen is located on the opposite baseline from the dugout so the manager can see his relievers warming up in the pen. 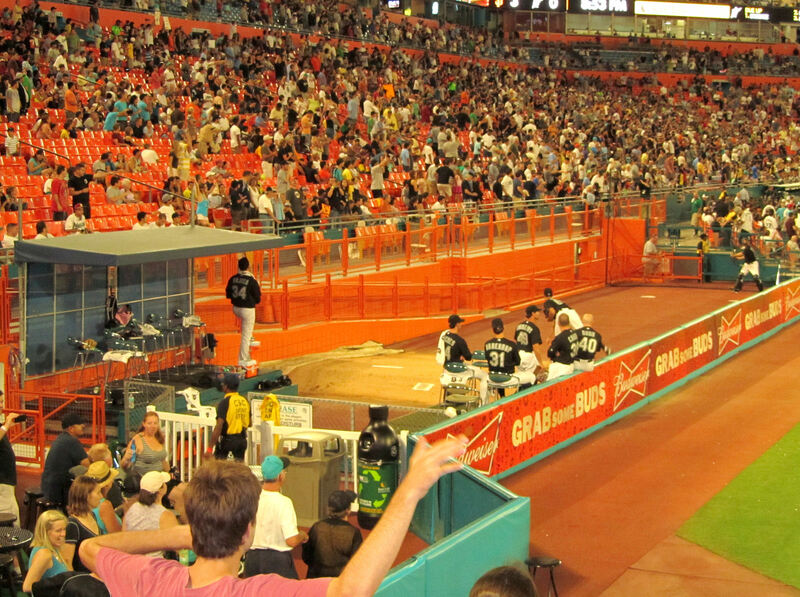 Two seconds after taking that panorama, a police officer in the Marlins bullpen told us we had to stay at least five rows back in the seats, which did not make much sense, but oh, well. getting to the covered tunnel and make a lot toss over the tunnel to us. But there was some more game to watch first. 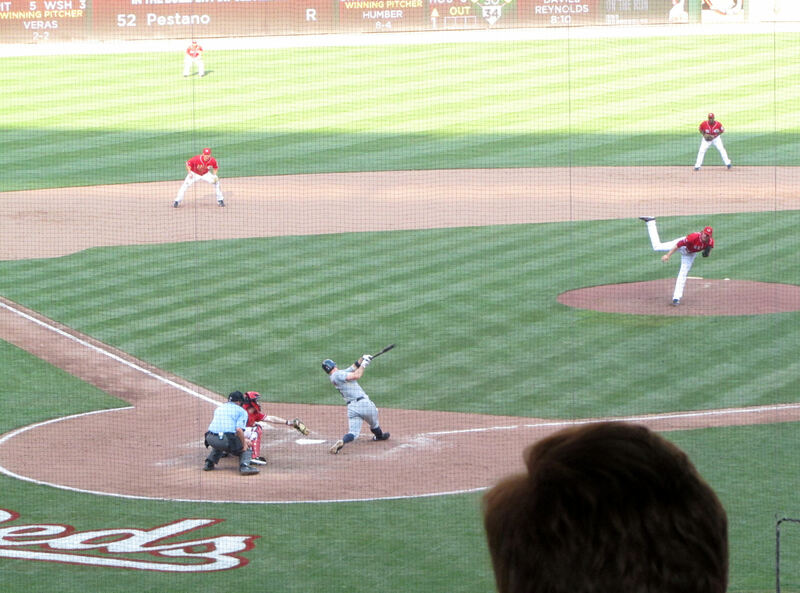 …and we had an excellent view of the action when Aaron Rowand grounded to Dobbs, and Dobbs threw him out at first. I’ll tell you, I am officially sick and tired of hearing about his beard. Can someone else win the World Series already so we can all forget that Brian Wilson has a big beard? Anyway, Wilson and his beard did their job. The Giants won 3-0.
the initial victory high-fives was Jeff Keppinger as he was interviewed post-game. be able to say we got a ball at Sun Life Stadium. 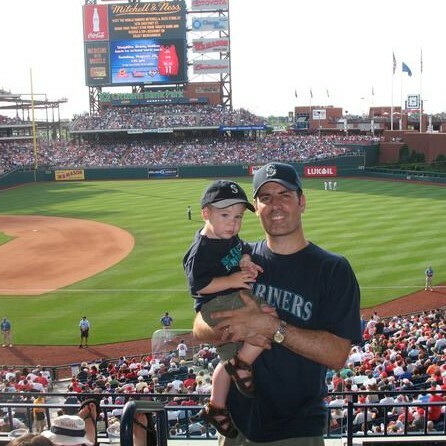 If not, Sun Life would join Shea Stadium, old Yankee Stadium, and Chase Field as the only stadiums Tim has visited and not got at least one baseball. 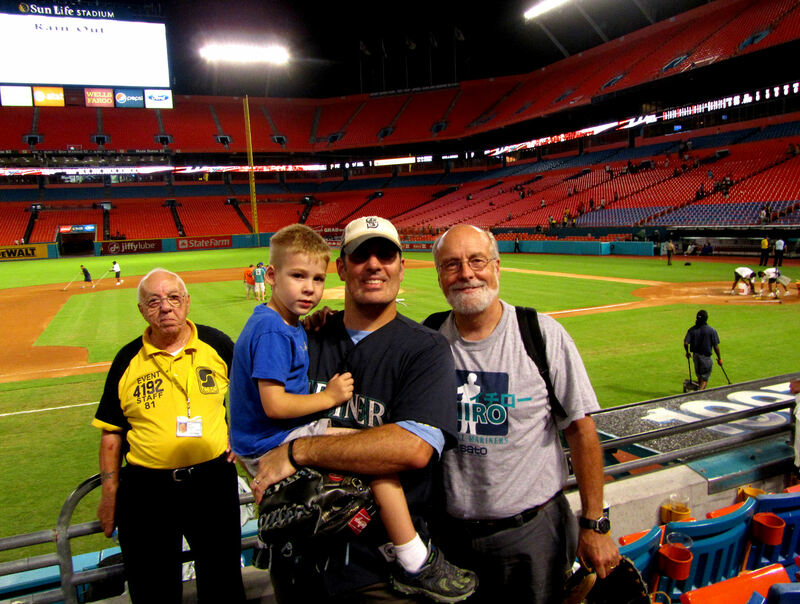 We’ll visit Chase Field again, but Sun Life Stadium was in jeopardy of joining Shea Stadium and old Yankee Stadium on the never-gonna-happen list. * includes Spring Training**divisions where we have seen each team play a home game. Welcome to the longest entry in the history of this blog. …Detroit, Michigan. The Motor City! 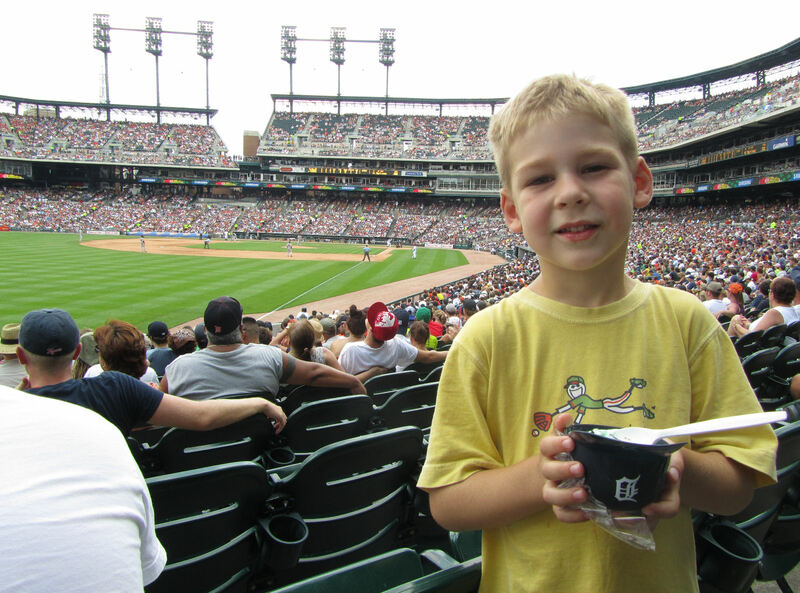 I’ve wanted to go to Comerica Park for a long time. 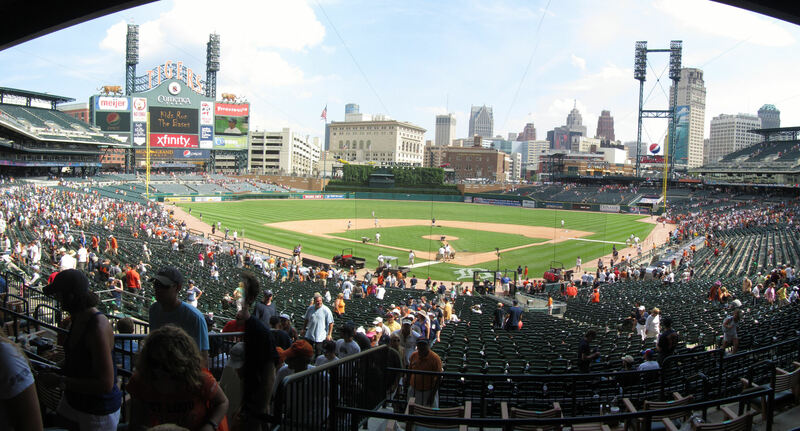 But I heard a lot of negatives about Detroit (the city, not Comerica Park), and I did not know what to expect. As we approached the city on I-75, one of the first high-rise buildings that we saw (not yet in downtown) looked odd. It was about 20-stories high (I guess), and I soon noticed it looked so odd because I could see right through it. I’m not sure if it was burnt out or what, but there were no windows and we could see completely through the building. When we exited I-75, there was a building right at the top of the exit ramp (or right near it) that was half ripped down and demolished. It is pictured above below the “Pure Michigan” sign. Yikes. Detroit was not looking good. The quick drive through downtown did nothing to help the situation. Every other building was boarded up or burnt out. I broke into laughter. It really looked like there could have been an earthquake. 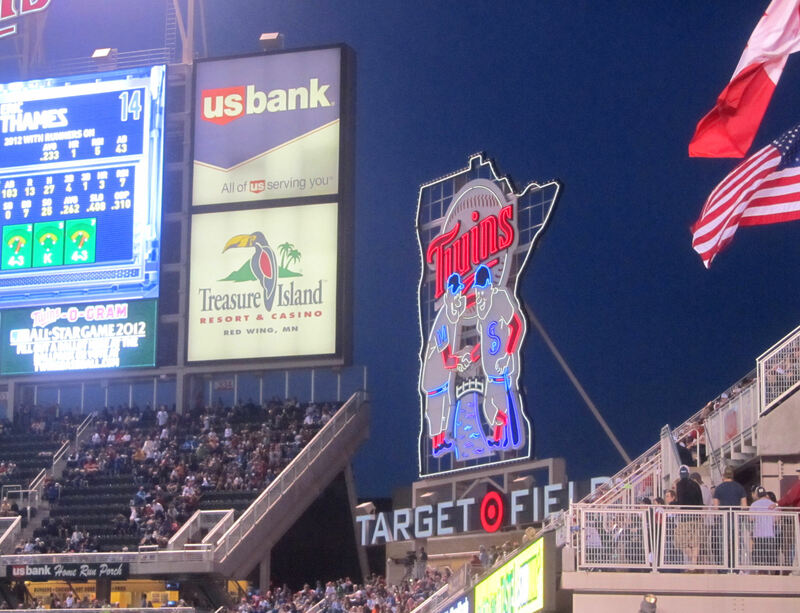 So…it was officially our worst ever introduction to a Major League stadium. 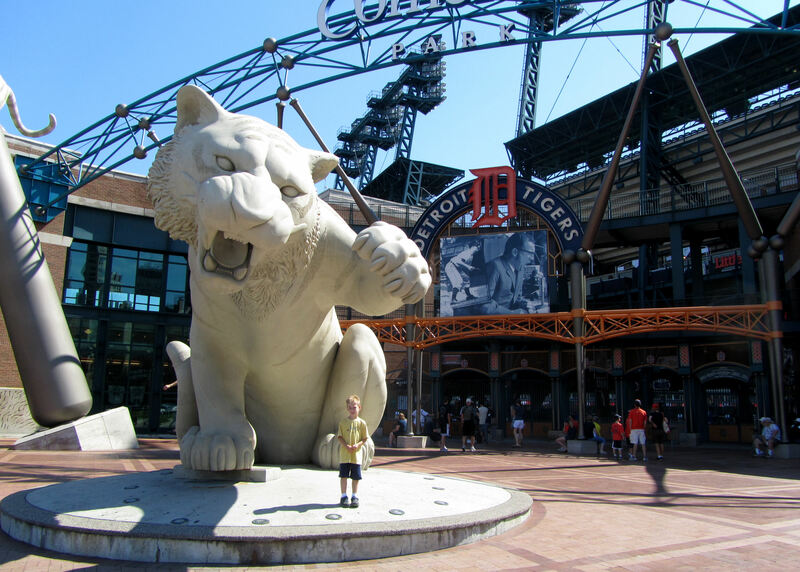 Comerica Park is AMAZING! I loved it. I loved it so much that Tim begged me to stop taking pictures at one point. All-in-all, we got about 450 pictures. And this entry is going to have a ton of them. and I’m kicking myself not for not doing it. Note that Tim is standing at the base of that bat and he looks teeny-tiny…and the bat is so tall that I couldn’t even get the knob into the picture from across the street. Maybe there is a good time to mention my general assessment of the stadium’s design. It seemed to me like the architects/planners thought of every little detail. 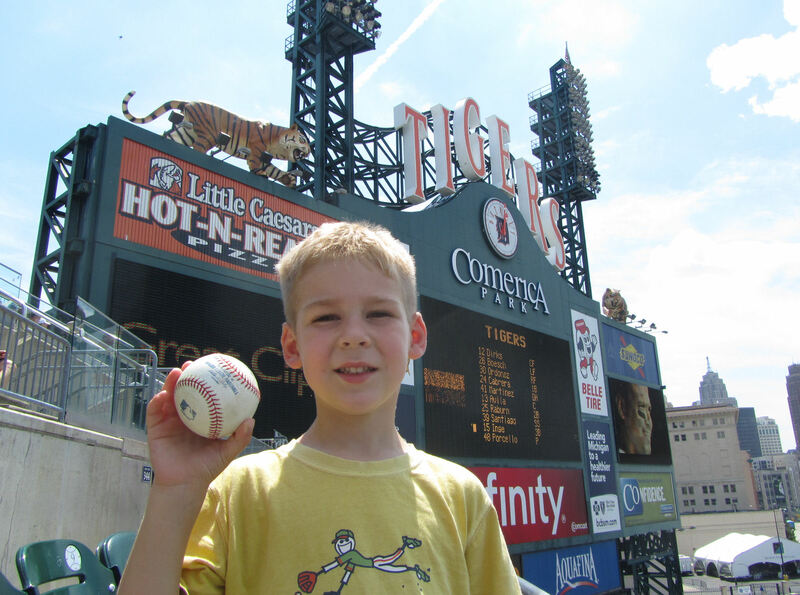 They wanted you to know at all times that you were at the Tigers stadium. 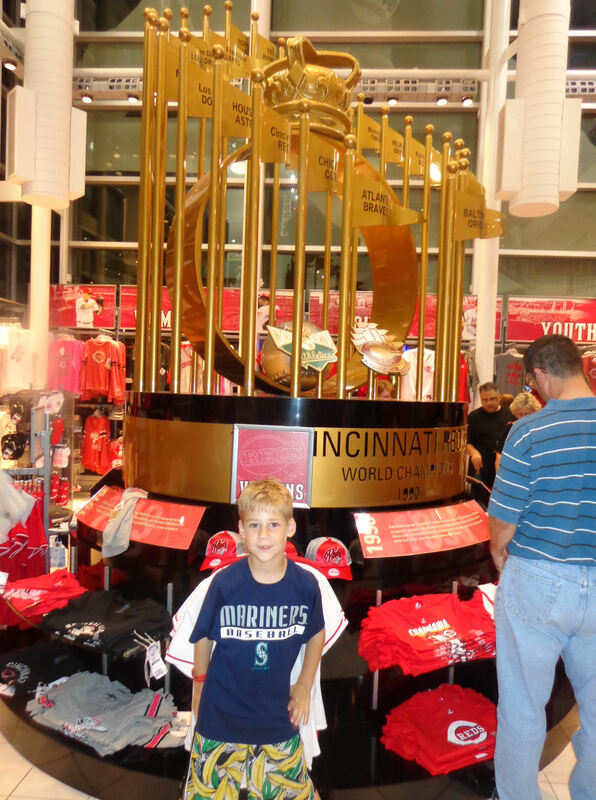 In every ballpark you see lots of team emblems, etc. 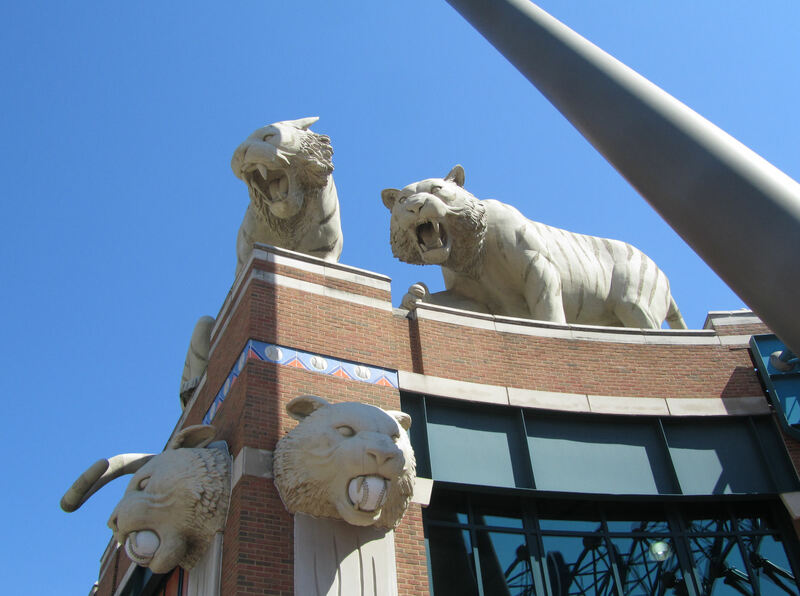 But the Tigers did an awesome job *Tigerifying* Comerica Park. If there was a little open space, they filled it with a Tiger, or a Tiger’s “D” logo, or the word “Tigers” or something cool and appealing to the eyes of the fans. They did an awesome job and it was really cool walking around just taking in all of the sights. In the picture above to the right, there are there orange cones in the distance. Those are set up in front of the doors where the Giants were entering the stadium. 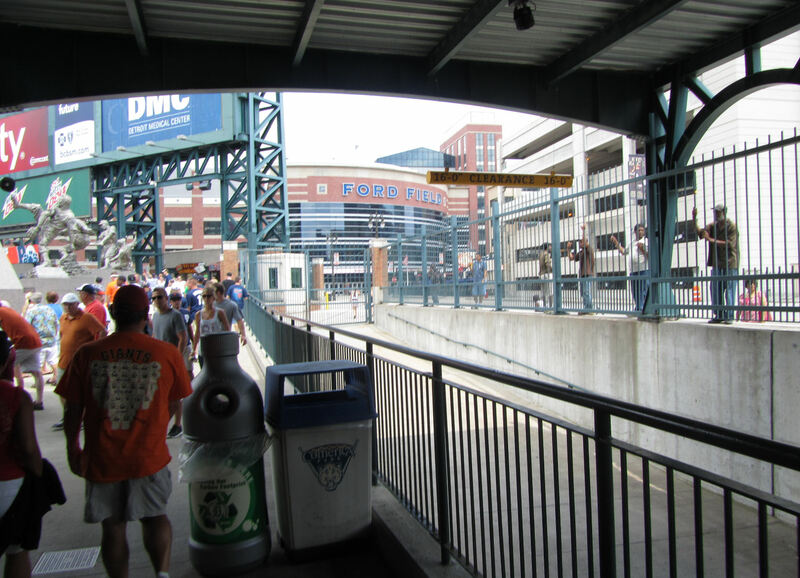 The 3B side of the stadium is situated along Brush Street and on the opposite side of the street Ford Field, home of the Detroit Lions. 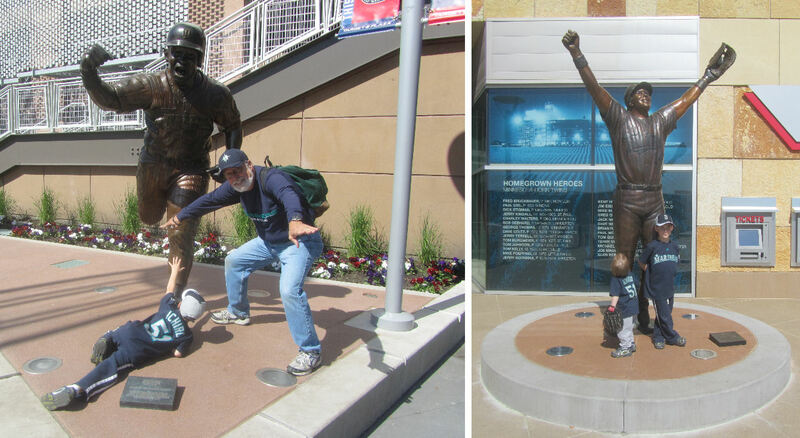 These statues seem to have been designed by the same artists who did the statues inside the LF gate at Nationals Park. 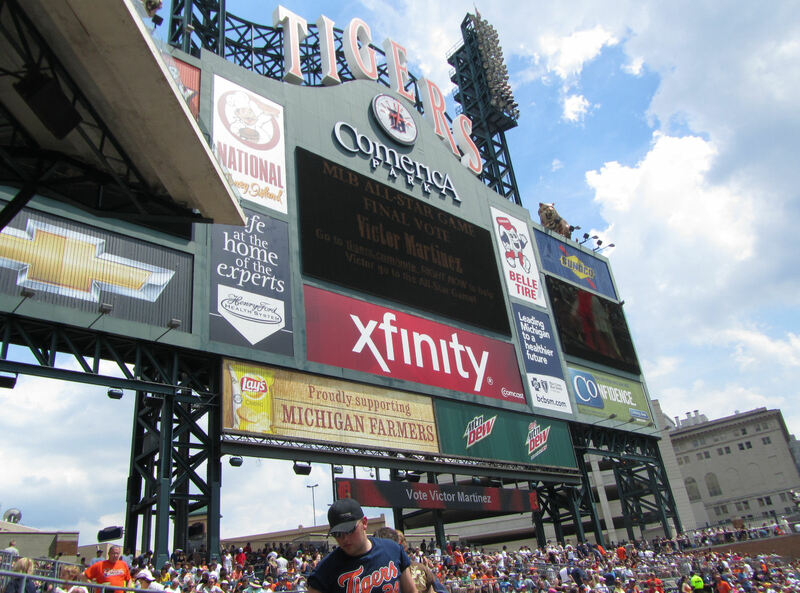 …and I requested (to myself) that I take a picture of this plaque listing all of the people Michiganders have to thank for Comerica Park. As we waited for the gates to open, I had already taken about 65 pictures. 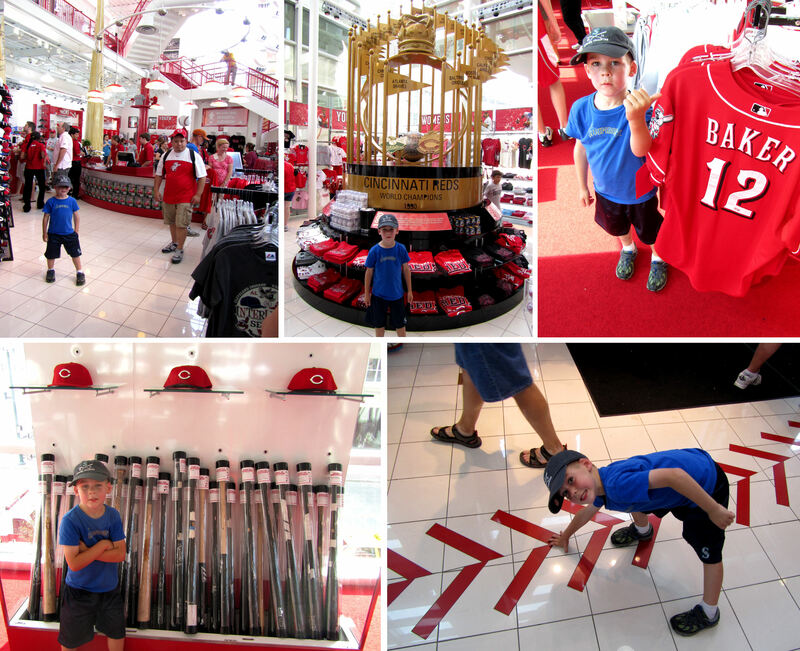 And soon we were let into the ballpark and there was a whole lot more stuff for me to photograph. 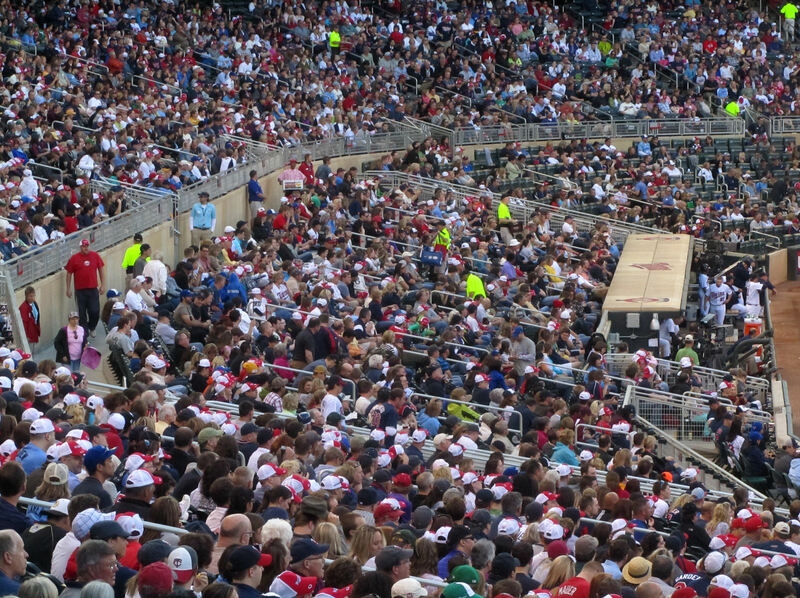 When the gates finally opened, we headed down into section 116 and surveyed the situation. 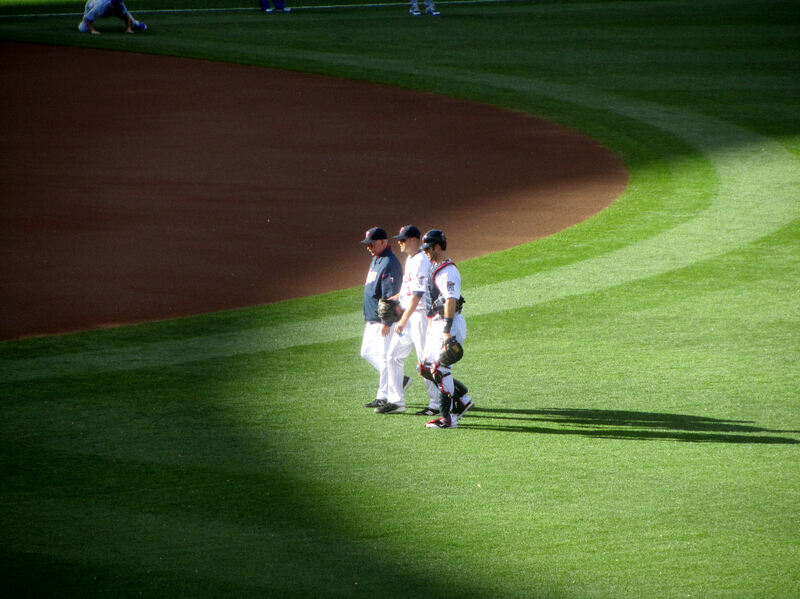 Several Tigers gathering down the LF line to play catch. A bunch of Giants fans joined us above the bullpen and when Baumgartner finished his routine, he tossed the baseball to a Giants fan. With no BP, a big crowd around the Tigers pitchers, and no other Giants throwing on the field at this point, I was thinking it would be very difficult to end up getting a baseball at this game. 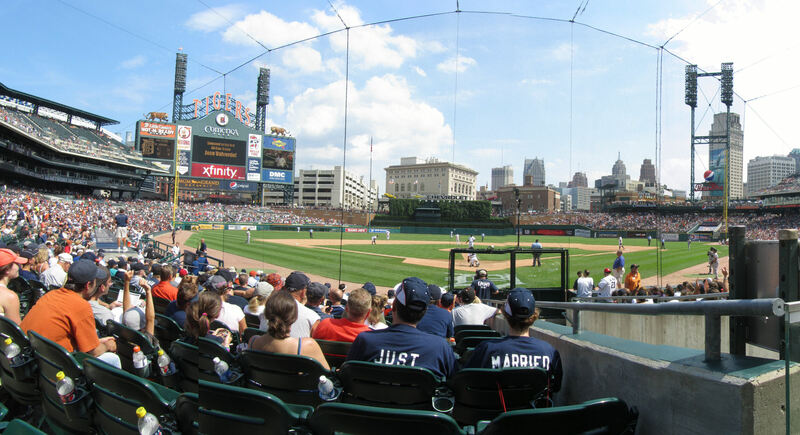 But I was really hoping we would beat the odds and come away with at least one baseball because we really wanted one from Comerica Park and it might be years before we ever get back to Detroit. 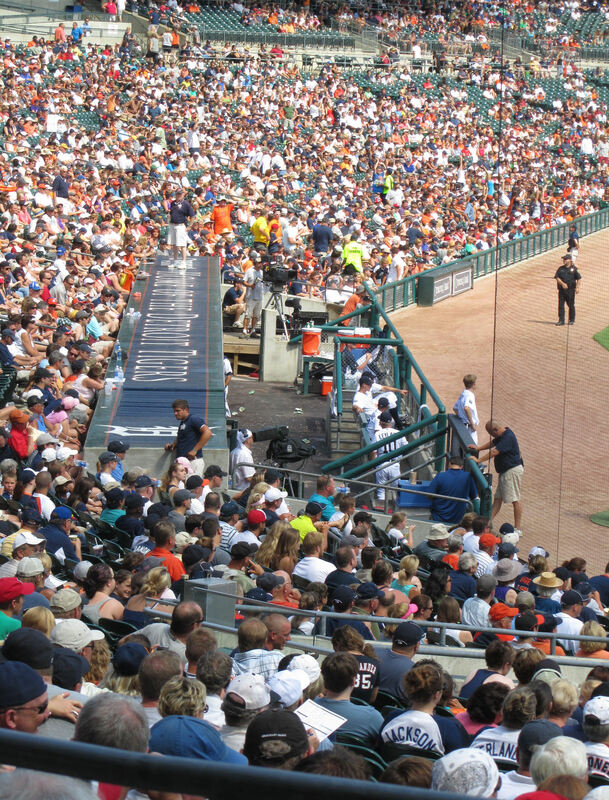 We walked over to the LF foul pole area, but there were tons of people gathered around just a few Tigers. It was pointless to stay there. Just then some Giants pitchers came out to play catch along the 1B line. But it was packed by the time we got there. So we gave up, and headed over to the dugout. And the move worked out. As a Giant (I am pretty sure it was Jeremy Affeldt) ran back into the dugout and tossed his warm up baseball into the crowd while he was still down the 1B line. 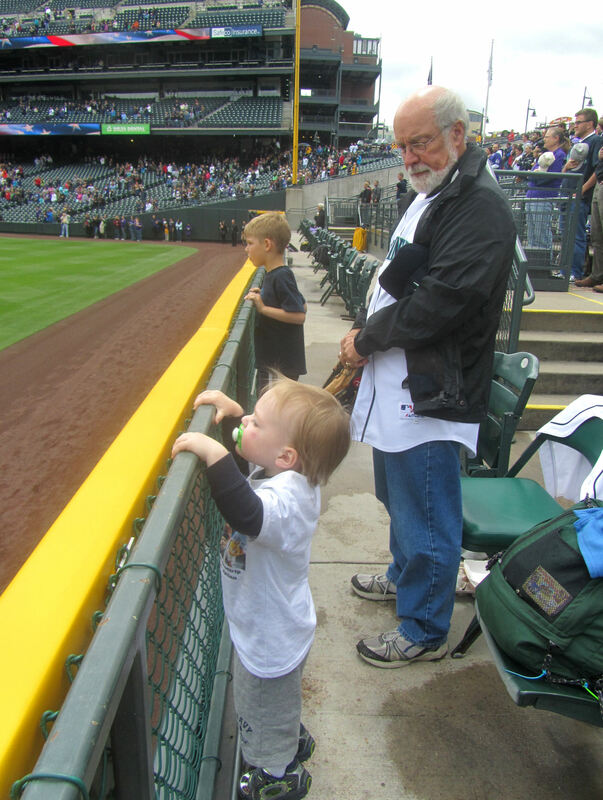 Then when he got right in front of us, he reached into his back pocket, pulled out his back-up baseball and tossed it up to us. It was officially time to explore! 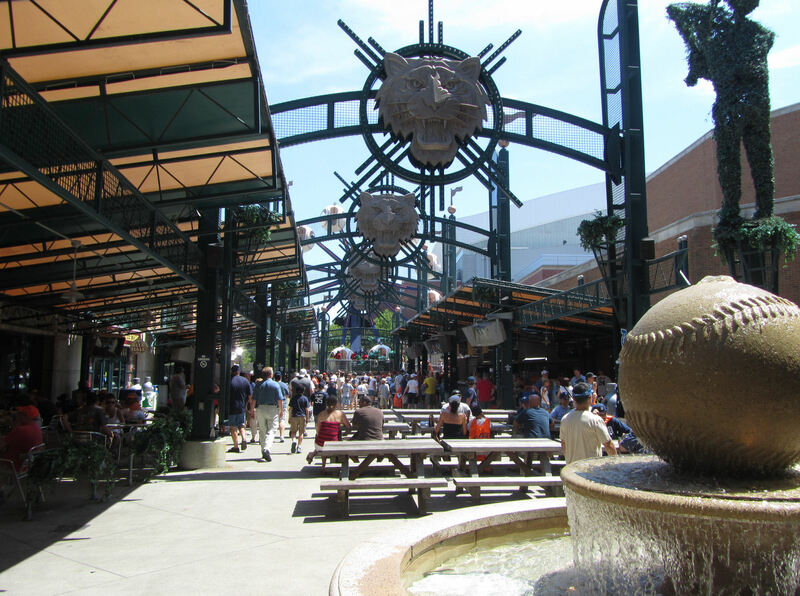 Check out the big baseball fountain to the right in that picture. Cool, eh? 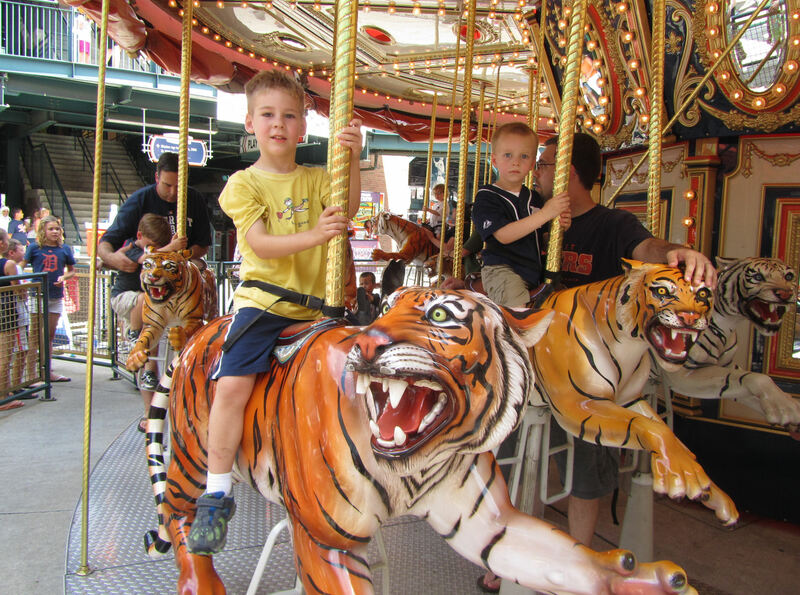 You cannot really tell in that last picture, but all of the traditionally merry-go-round *horses* on this carousel are ferocious-looking tigers. 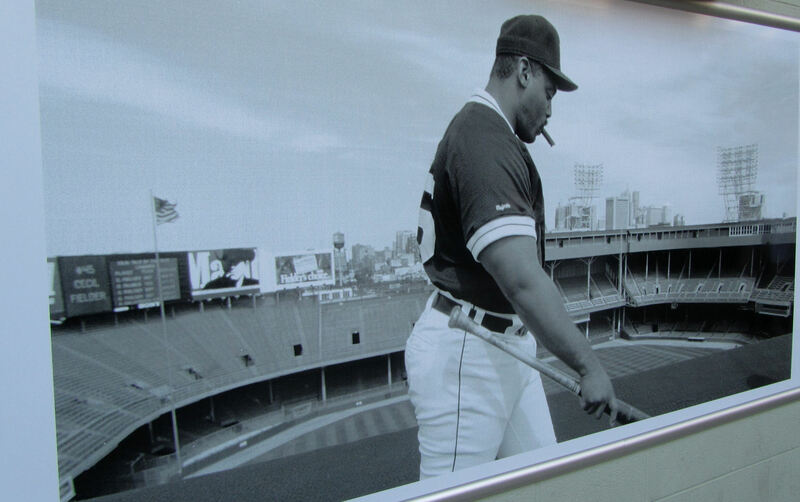 Comerica Park has a bunch of these banners hanging with players from the past. I’m not sure what the significance of the years are – they all seemed to be even decade years. 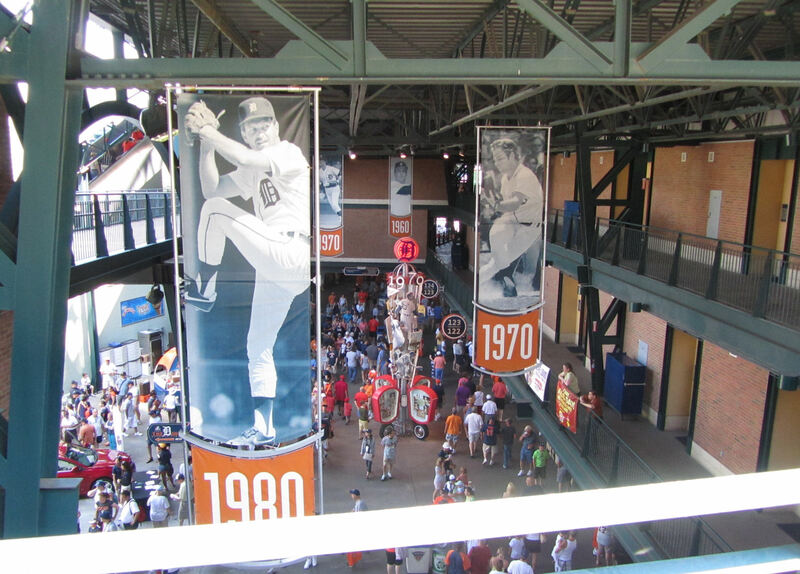 So maybe, for example, that 1980 banner in the foreground simply means that Jack Morris pitched for the Tigers in the ‘80s. Between the Morris 1980 banner and the 1970 banner to the right, there is a weird contraption down below on the concourse floor. 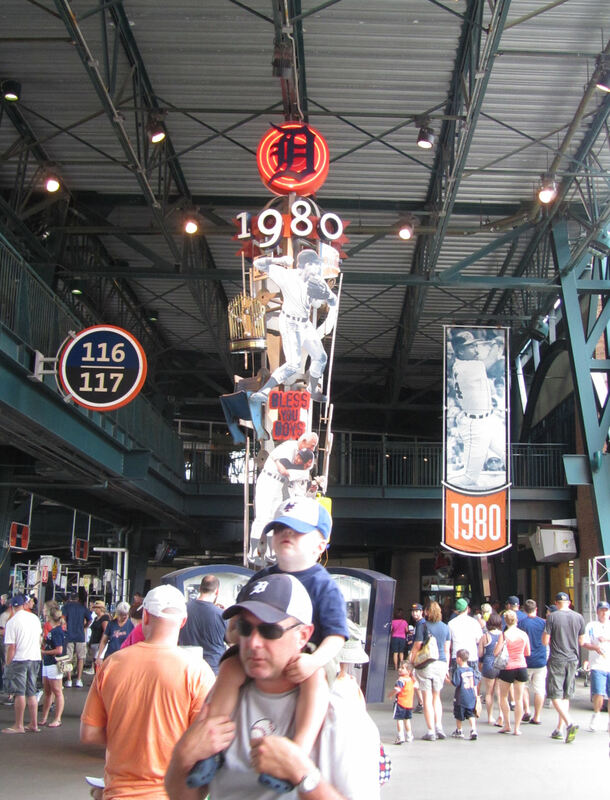 You’ll notice it is resting on tires, stands pretty high up into the air, and is topped with “D” and a “1970.” The Tigers have a bunch of those throughout the field level concourse as well. Again, my thought is that they feature players and artifacts from the decade identified at the top of the display. 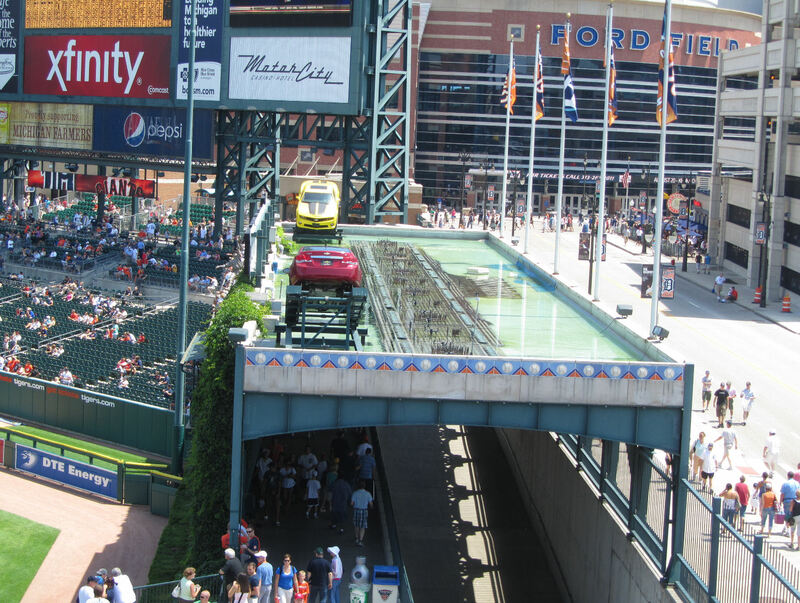 Detroit being the Motor City and all, the batters’ eye features two muscle cars. We also noticed a lot of water on the top of the batters eye, which I original thought was pooled rain water. 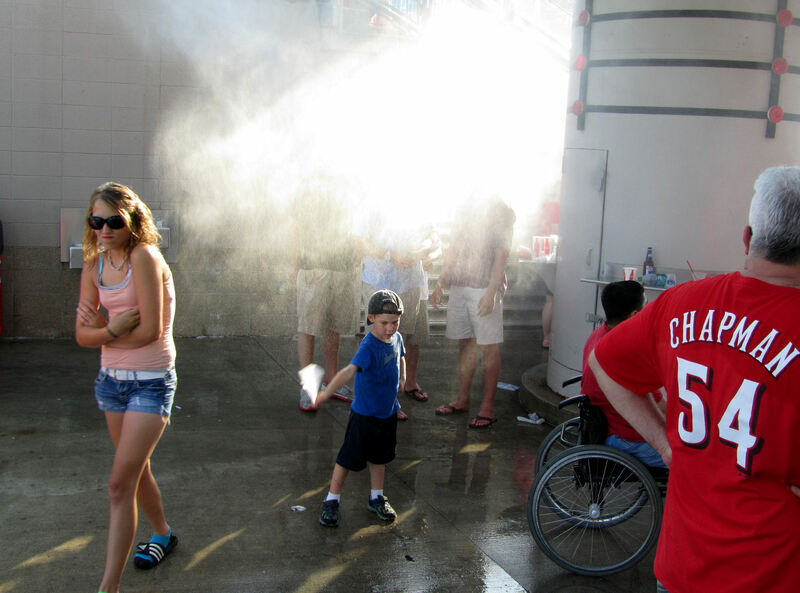 But during the game we realized that there is a fountain on top of the batters’ eye that shoots streams of water high into the air. Look at that! 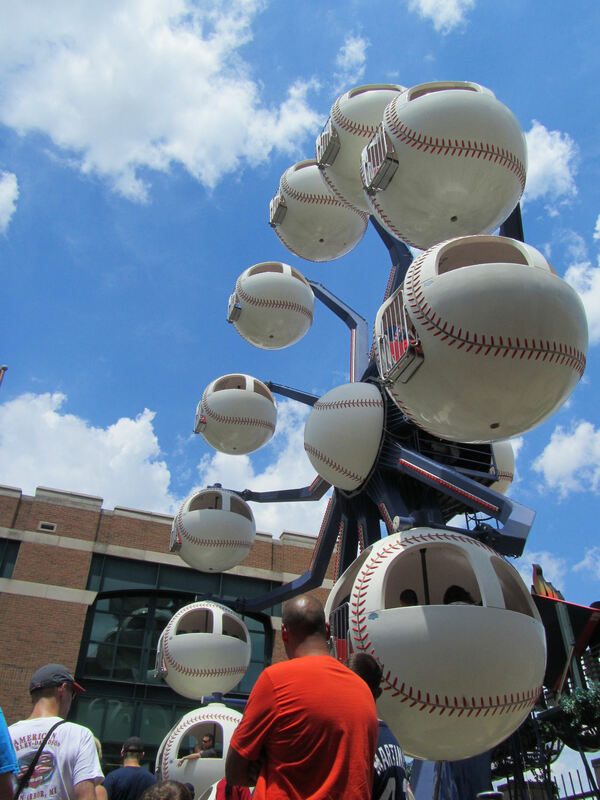 It has (1) crossed bats and a baseball, (2) the word “Detroit,” (3) the “D” from the Tigers’ jerseys, (4) the word “Tigers” in a ferocious tigers-ish font, and (5) baseballs circled with stars. Awesome. 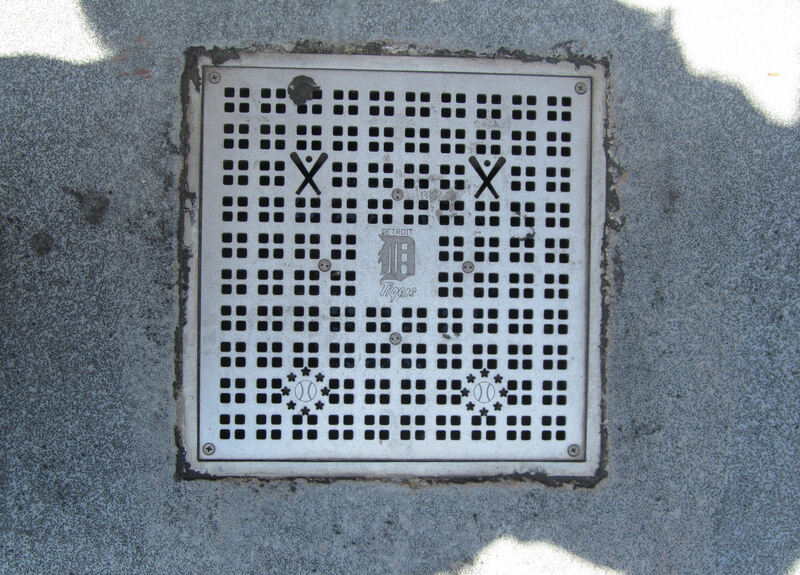 These are almost certainly the best drains in all of MLB. 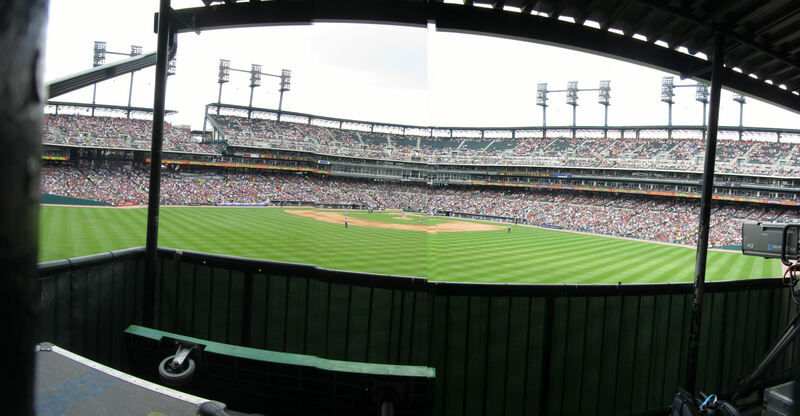 Next, we walked all the way out to the LF corner and took a bunch of panoramas. 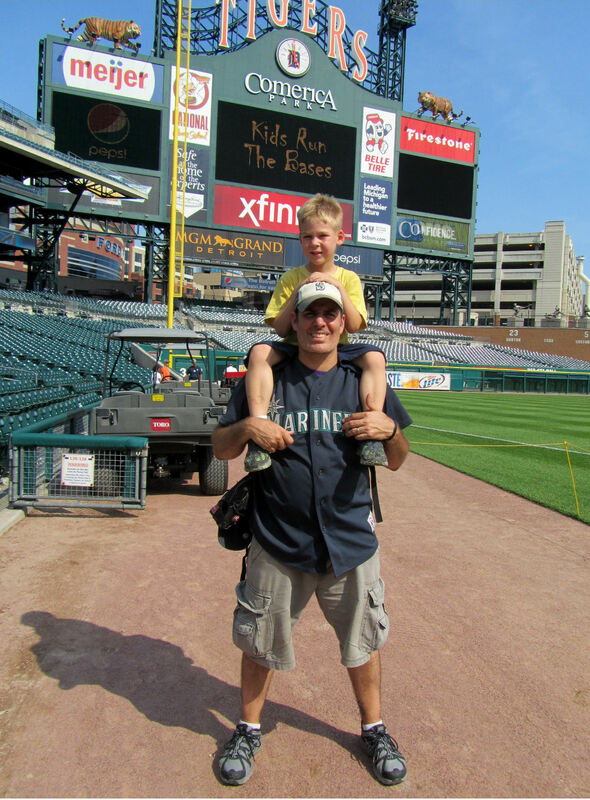 …of Cecil Fielder walking on the roof of old Tiger Stadium. 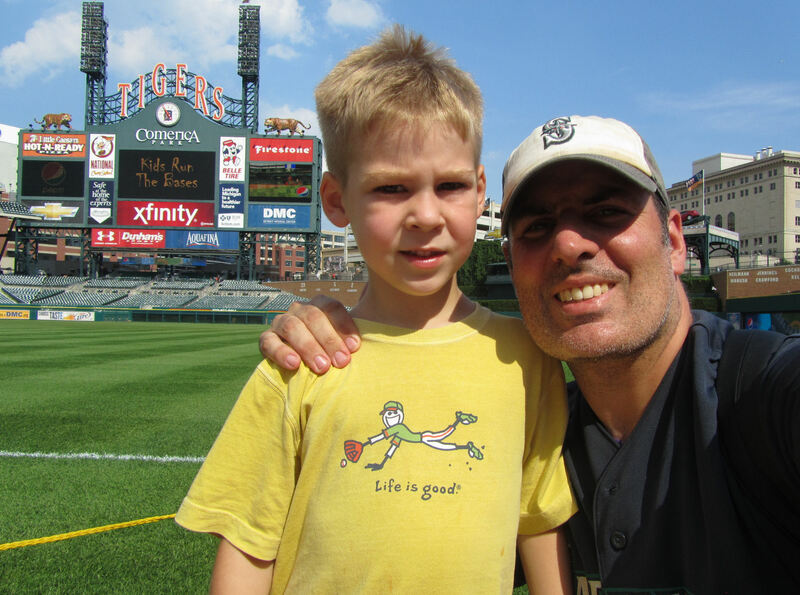 Man, I wish I Tim and I could have visited Tiger Stadium. From watching games on TV, it looked gloriously old-fashioned. 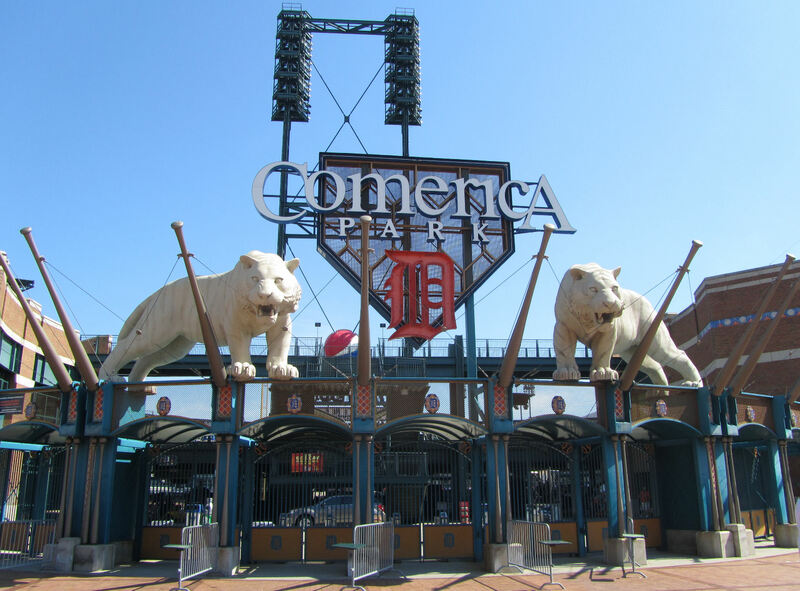 I was appalled when the closed it and opened this new-fangled Comerica Park place. Well, if they had to replace (and then tear down…oh, no!) 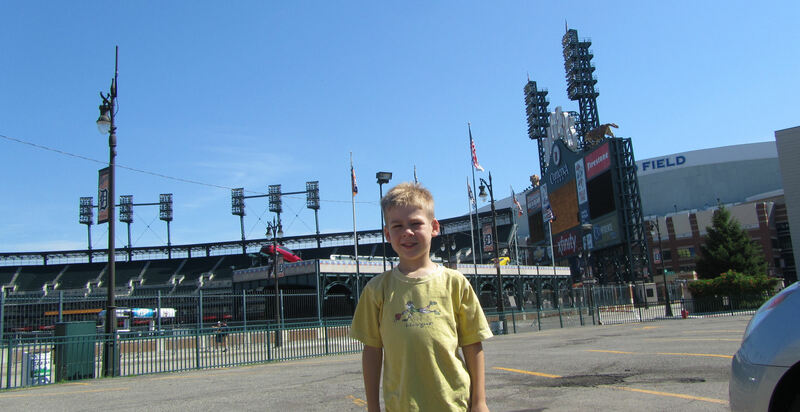 old Tiger Stadium, they couldn’t have done a better job replacing it. Check out that awesome scoreboard with full-color Tigers on the prowl. Outstanding! When Tim and I were looking for the perfect spot for this picture, an usher came over and complimented me for wearing my baseball glove on my head. He said it showed that I was really a baseball player. I thought that was cool. Thanks, usher guy! I just noticed that I can see our car in that picture. Cool. 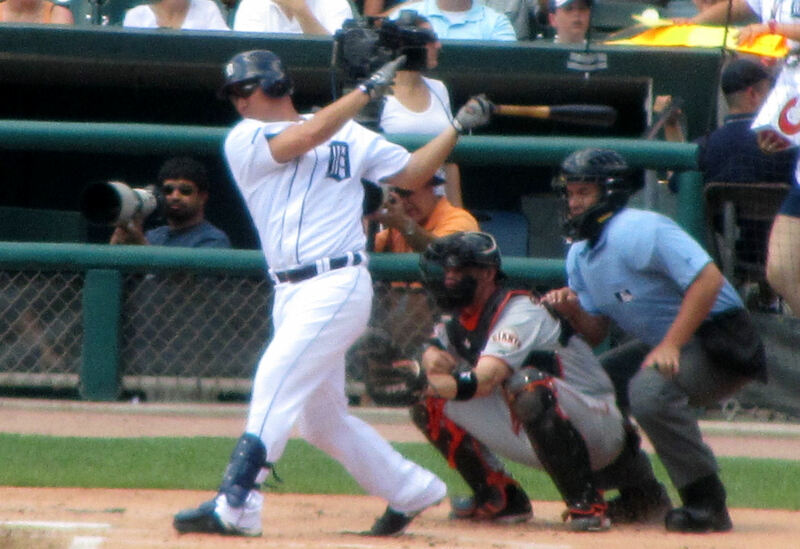 It was All-Star announcement day and the Tigers seemed to have a bunch of All-Stars (Cabrera, Valverde, Avila…). Each time another all-star came to bat or entered the game, the PA announcer announced the all-star selection and the place went wild. 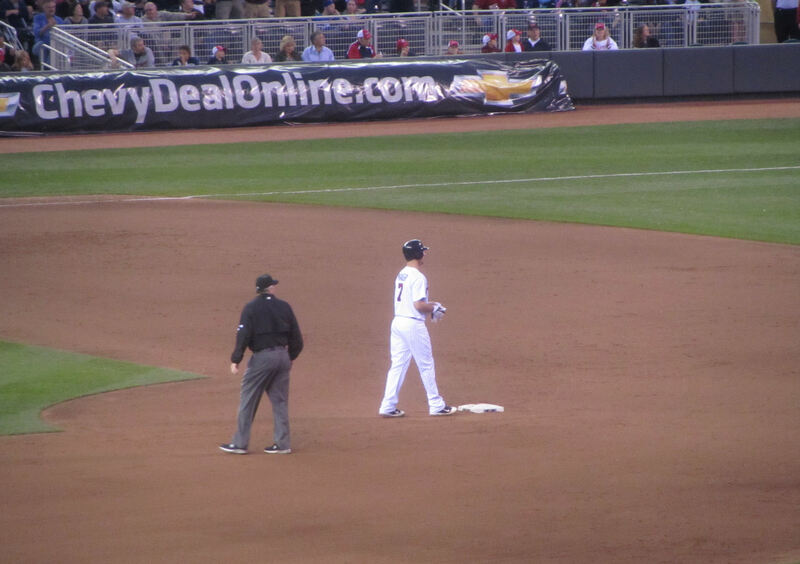 Park’s infield field level reminded me of Camden Yards. It has the same type of umpires’ tunnel directly behind home plate and a similar cross-aisle that runs all the way around the place. So we didn’t miss any of the action as we made our way along the cross-aisle and toward the Ferris Wheel snapping pictures. having to miss any of the game. We were really lucky. There was almost no line at all when we arrived at the Ferris Wheel. 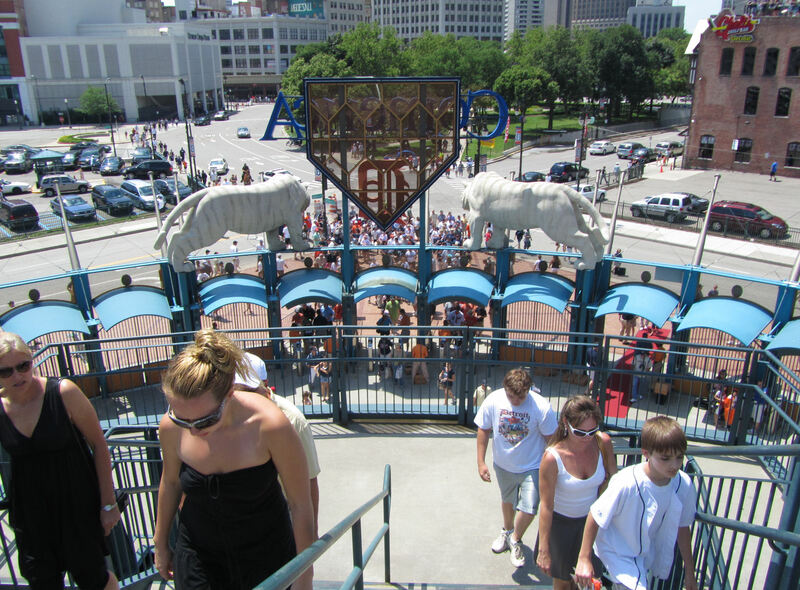 But by the time we were up top inside the Ferris Wheel, the line reached almost all the way to the field level concourse. When we reached the carousel, the line was semi-reasonable, it did not quite wrap all the way around the carousel. We hopped in line thinking that tickets must be sold right up by the front of the line (like with the Ferris Wheel), but then I noticed a ticket sales booth off to the side. We got out of line so I could buy my ticket and about 40,000 people took our place in line. By the time we got my ticket, the line wrapped all the way around the carousel TWICE! I told Tim we would have to come back later. That line was going to take forever. See the people all the way to the right on the opposite side of the fence? They’re watching free baseball! 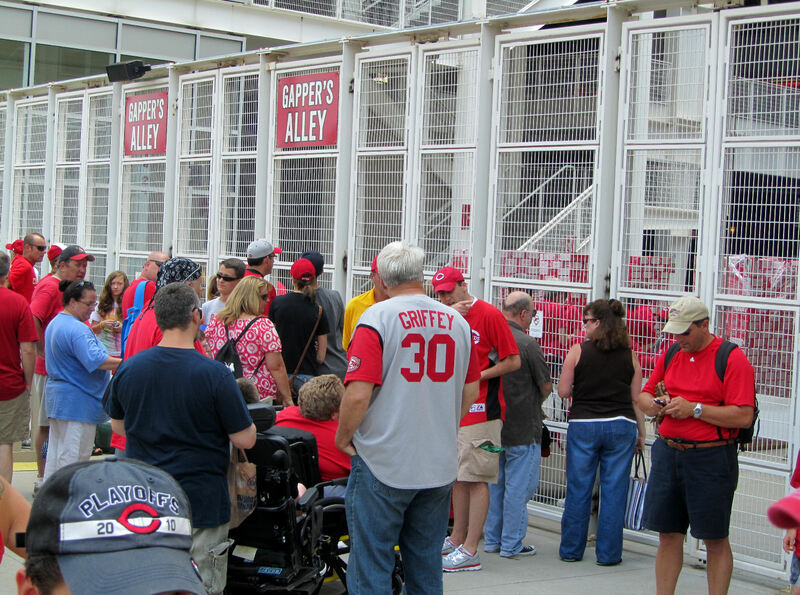 The walkway from LCF to RCF runs along Adams Street and people can stand along the Adams Street fence and watch the game. 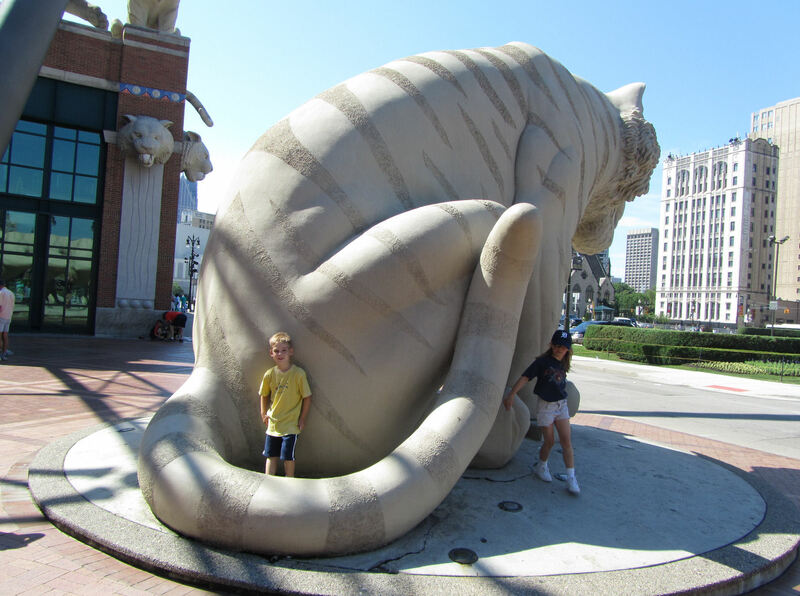 I don’t know if the Tigers like that, but I think it is great. 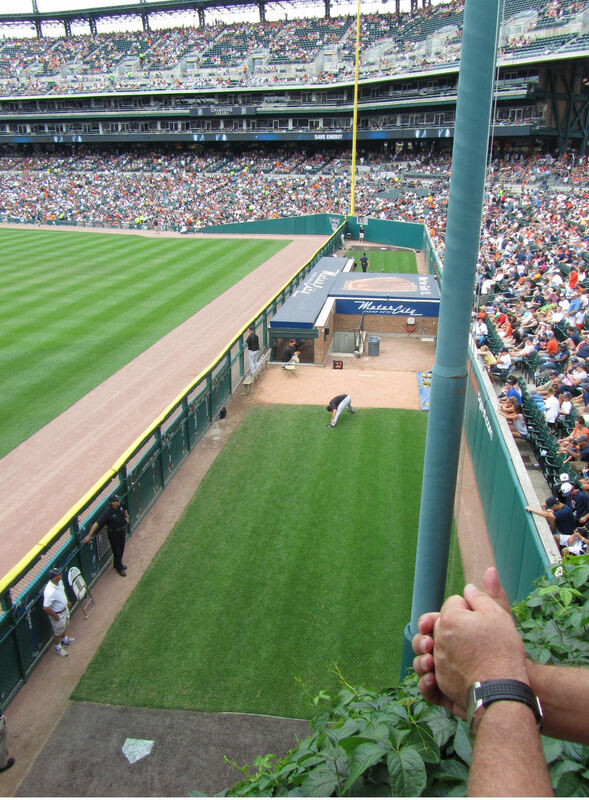 The closer bullpen is the visitors and the one in the LF corner is the Tigers bullpen. 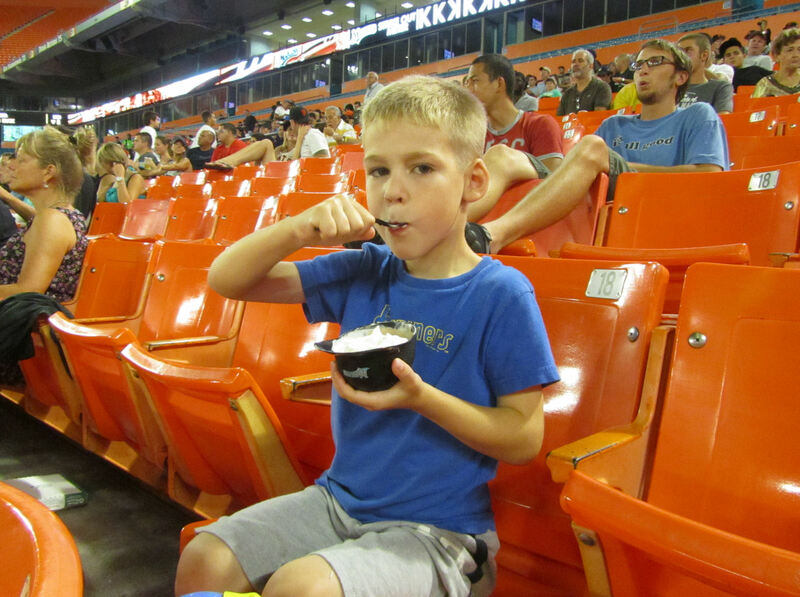 …and found some ice cream seats in our section. The scoreboard has three screens. A bit one in the middle and smaller ones on either side. 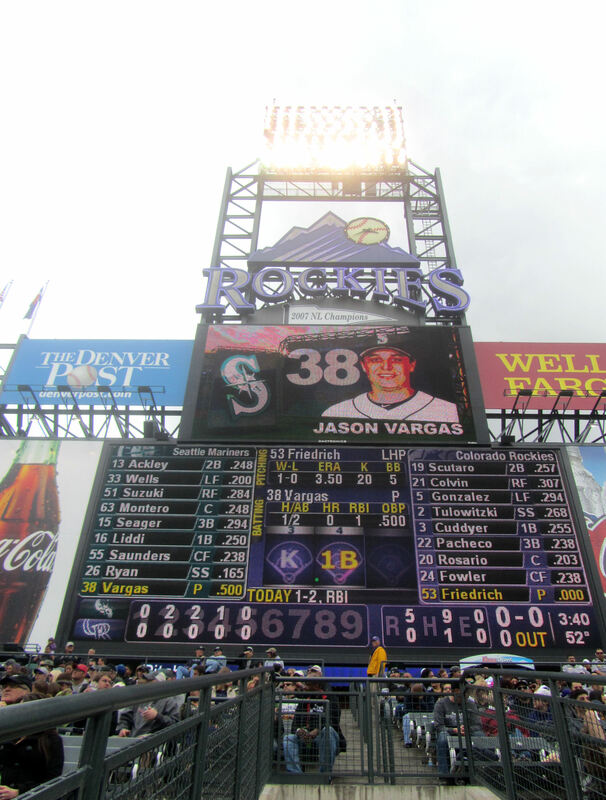 Only the smaller screen on the CF side of the scoreboard is a full-color screen. The other two are the black background with yellow text type of screen that has been around for ages. I assume that someday soon the Tigers will install a huge high definition screen. 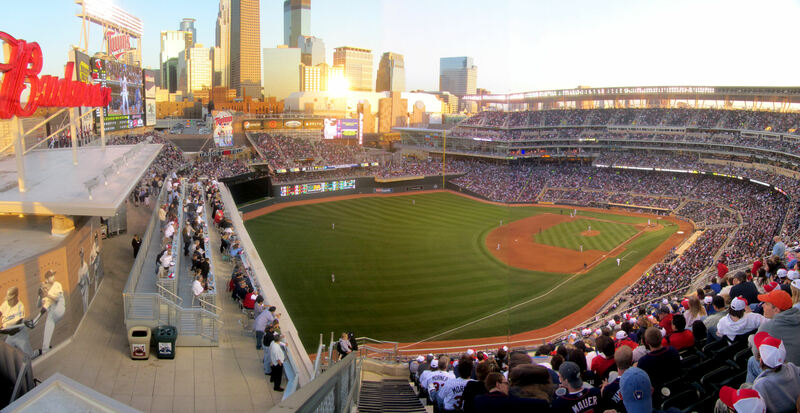 Once they do that, Comerica Park may be almost perfect. 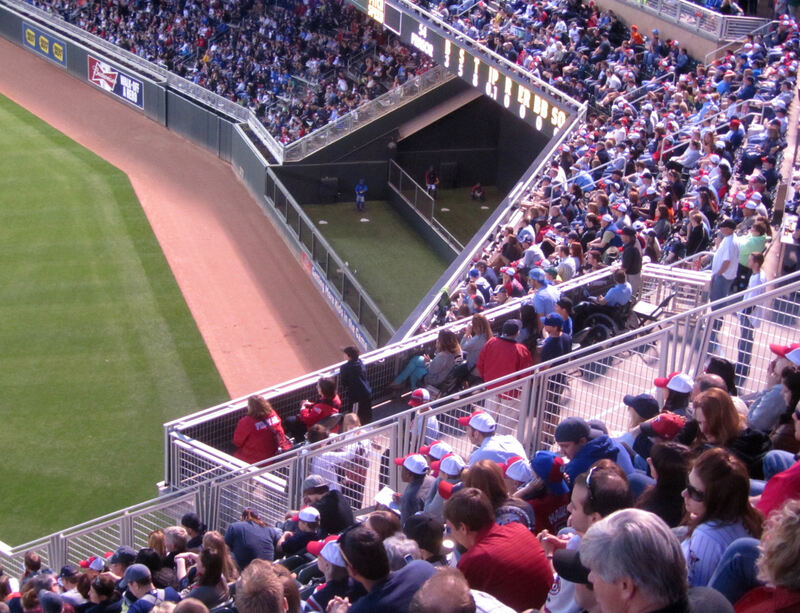 It is a switch-back ramp for wheelchairs to descend from the field level concourse to the cross-aisle. Pretty cool, idea. half blocked my shot, but you can still see some of the action). 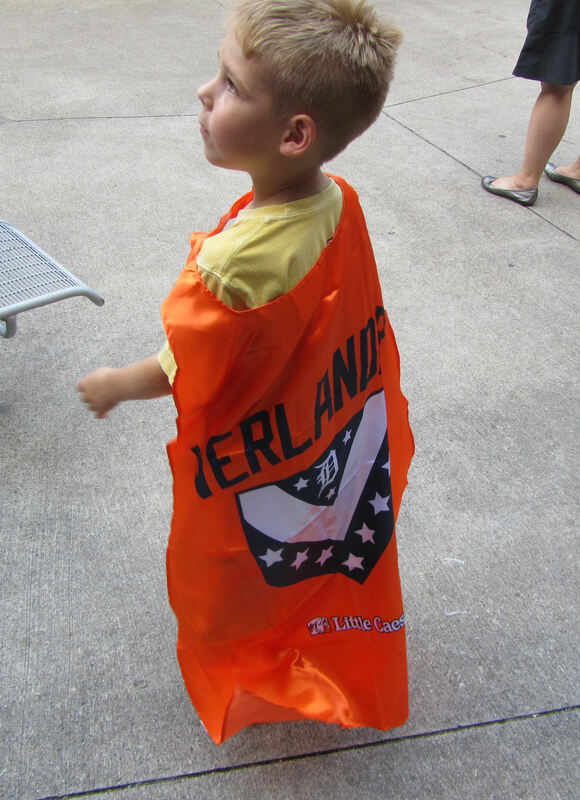 All kids got this Justin Verlander super hero cape! Super V! They were actually pretty cool. 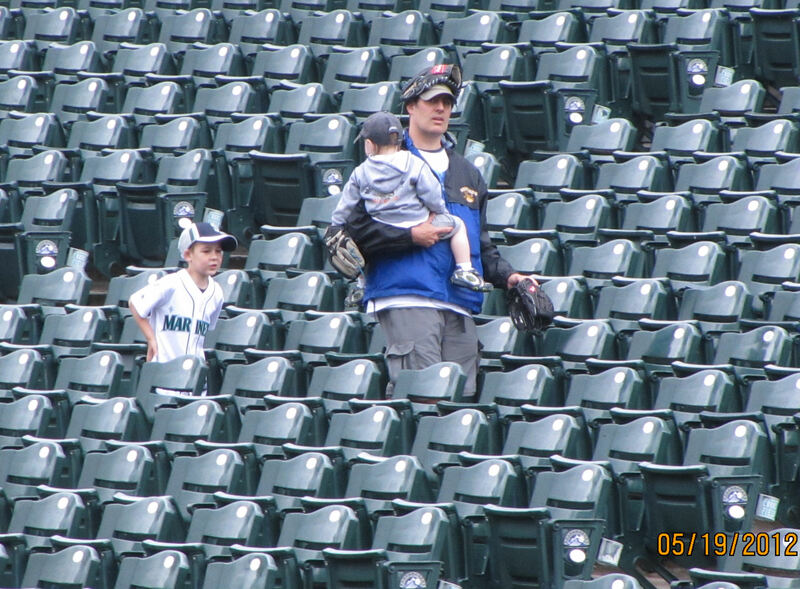 Tons of kids (and even some adults…including the entire grounds crew) were wearing them throughout the game. 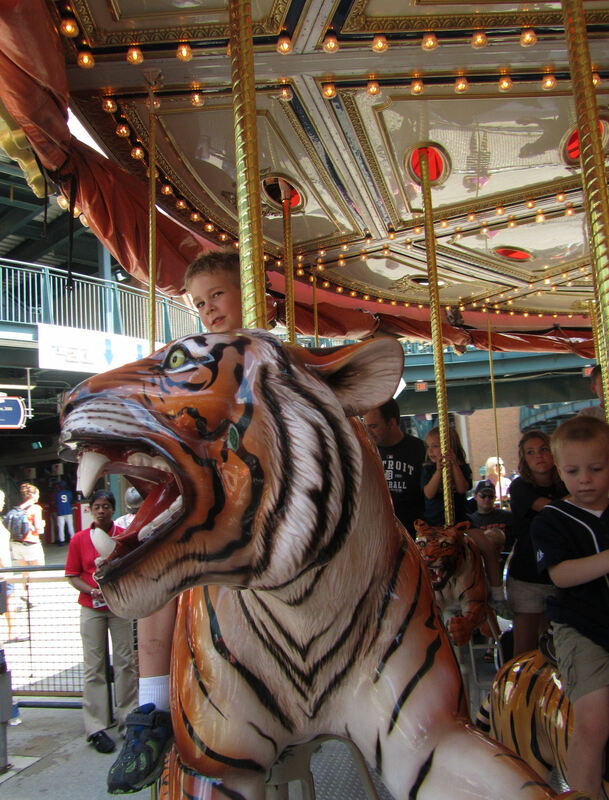 The tiger-go-round was actually pretty cool. The tiger *jumped* really high sending Tim high above me as I stood next to his Tiger’s sharp teeth. 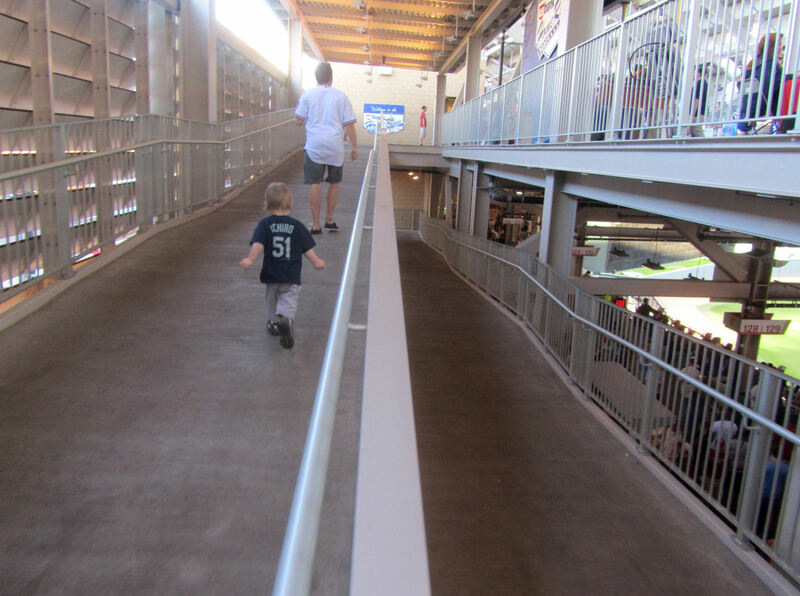 …and there was tons of room to run in case someone sent a foul ball our way (but no one did). 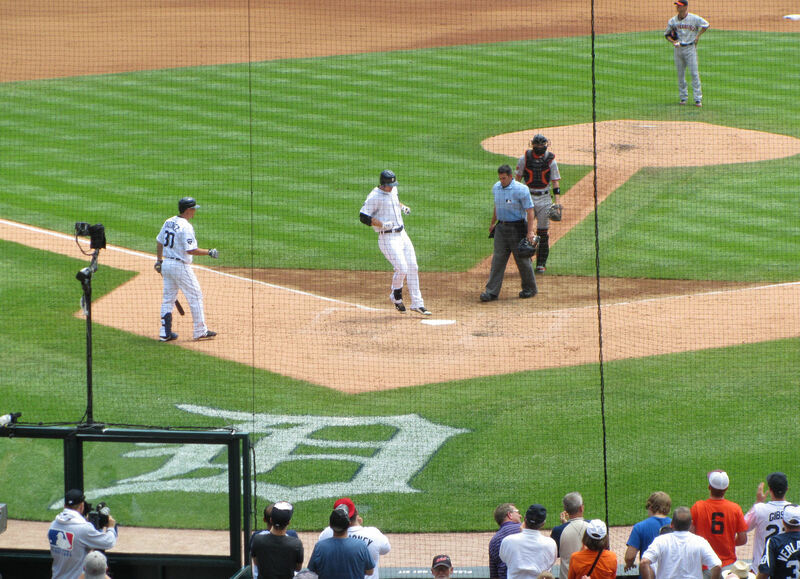 …close out the game for a save and a 6-3 Tigers win. It is always great to get an umpire baseball. 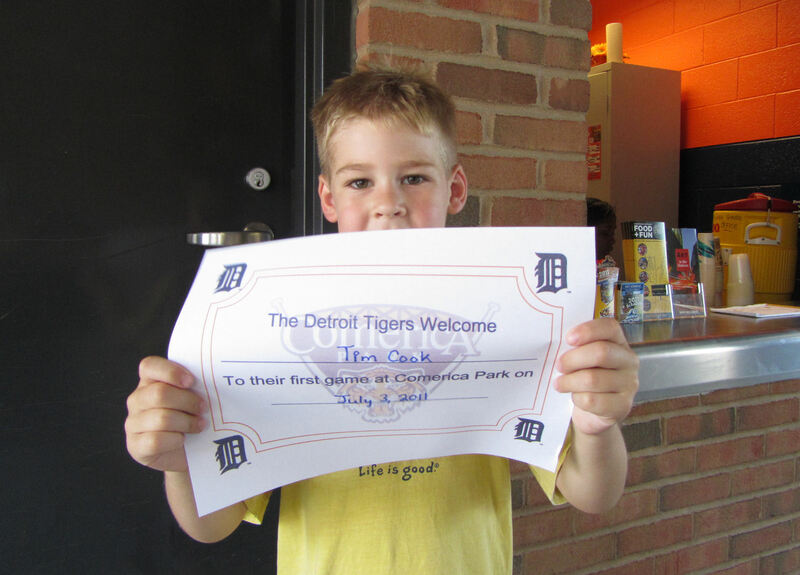 And it we were pumped to get one at our first game ever at Comerica Park. 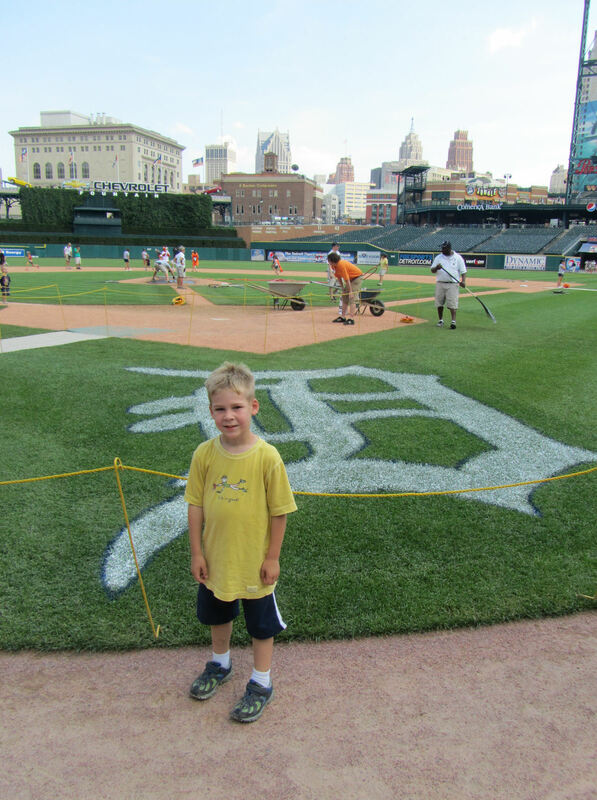 The game was over, but our day at Comerica Park was not. 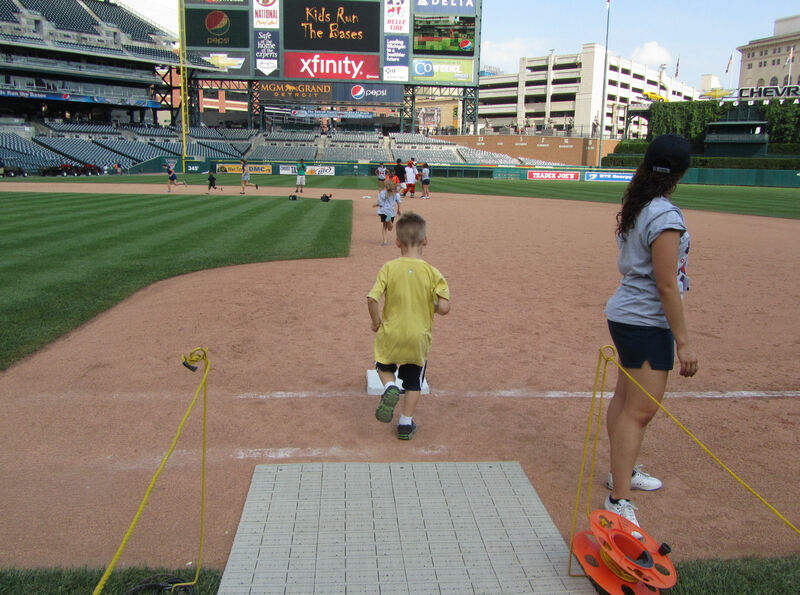 It was Kids Run The Bases day! Hooray! 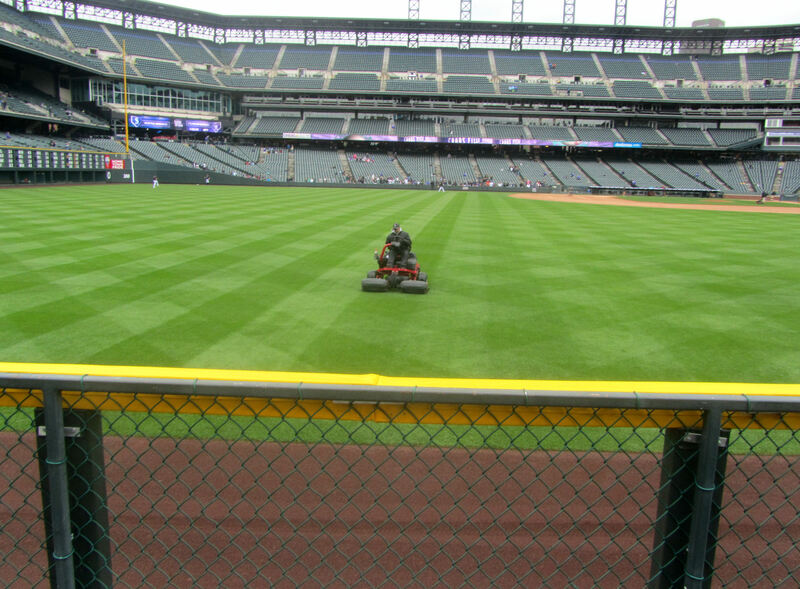 …and down under the RF seats. 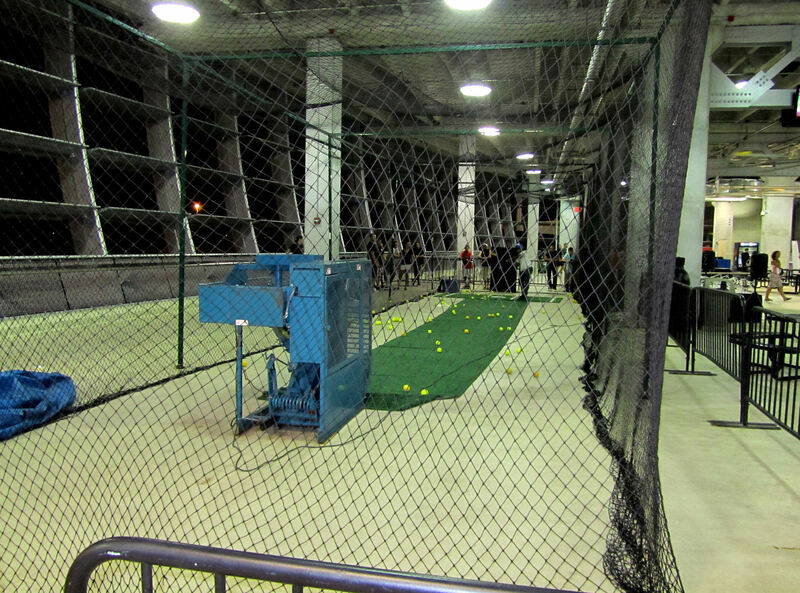 Of course, we touched the batting cage on our way by. 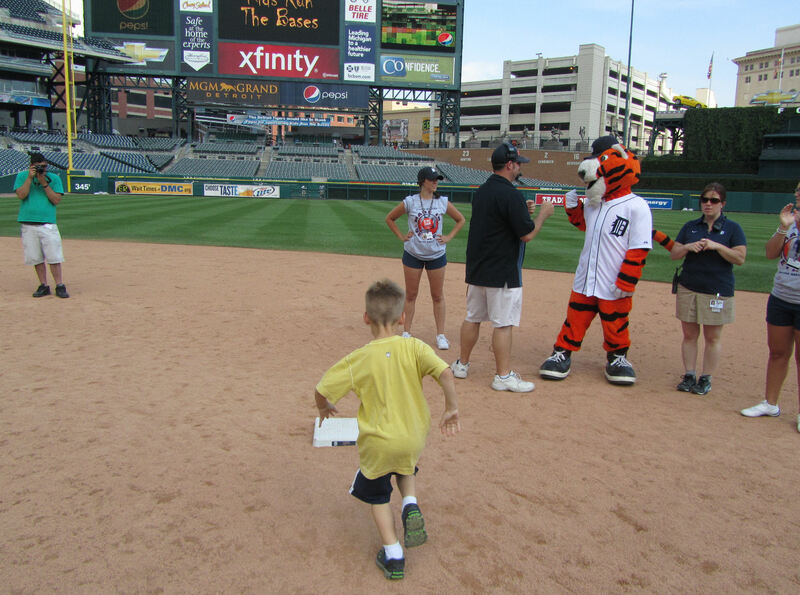 The Tigers staff was very cool during Kids Run The Bases. Some teams rush you through there, others let you savor the experience. 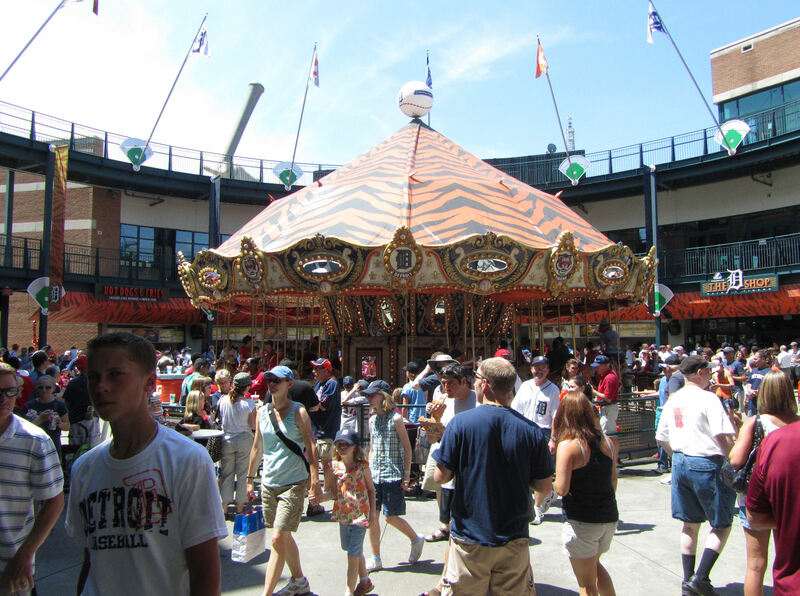 The Tiger, who as far as we could tell have totally nailed the whole *fan experience* concept, were of the “savor it” variety. 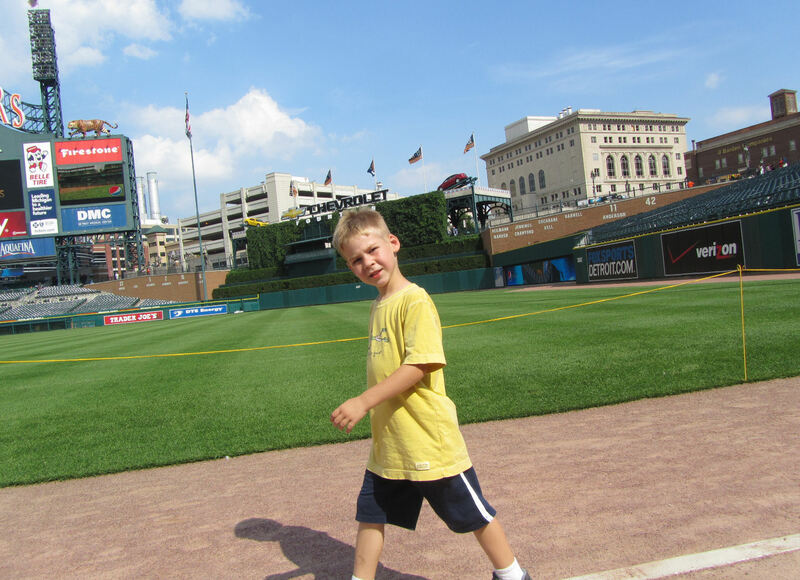 …and with the Comerica Park sign (foul territory). 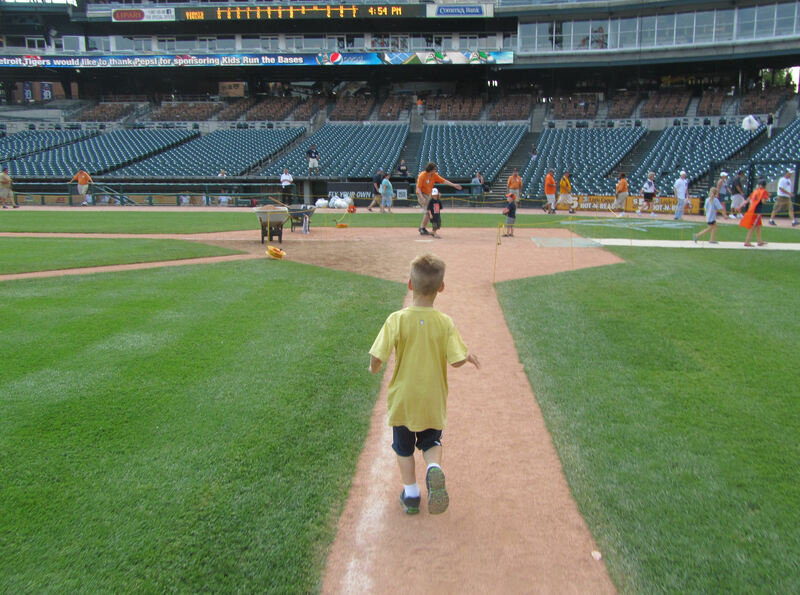 …he “walked the line” – the foul line, that is. And it wasn’t just chalk foul line. 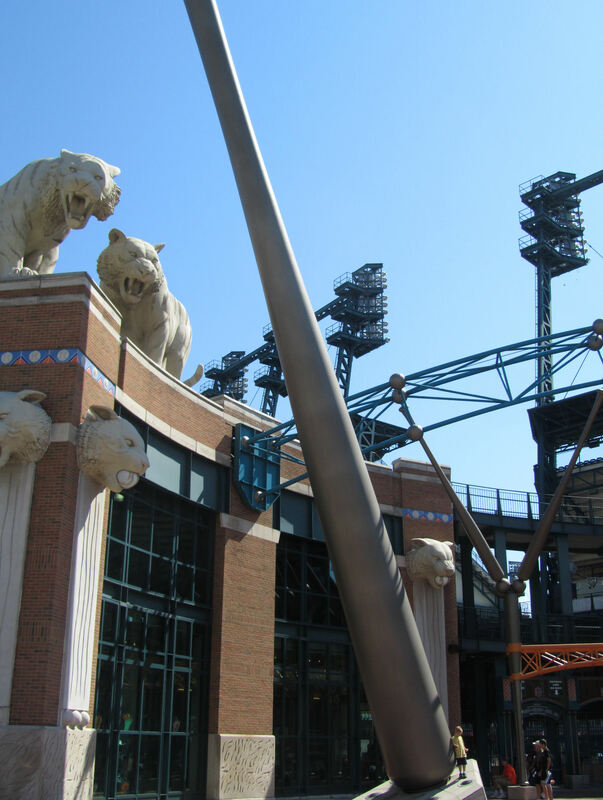 The Tigers have something (wood, hard plastic, or something) set into the ground. 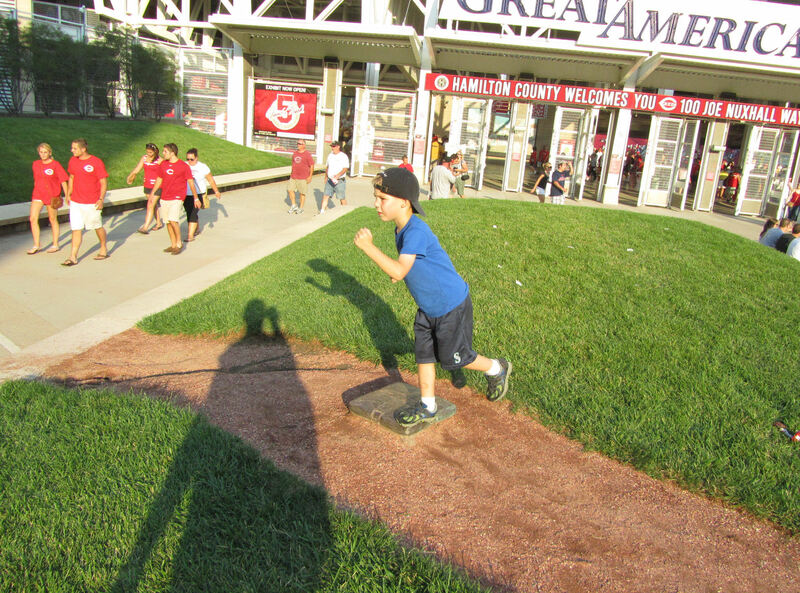 These are some of the little things the fans get a chance to notice during Kids Run The Bases, and we greatly appreciate that opportunity. …and then getting ready to (oh, no, illegal, illegal!) 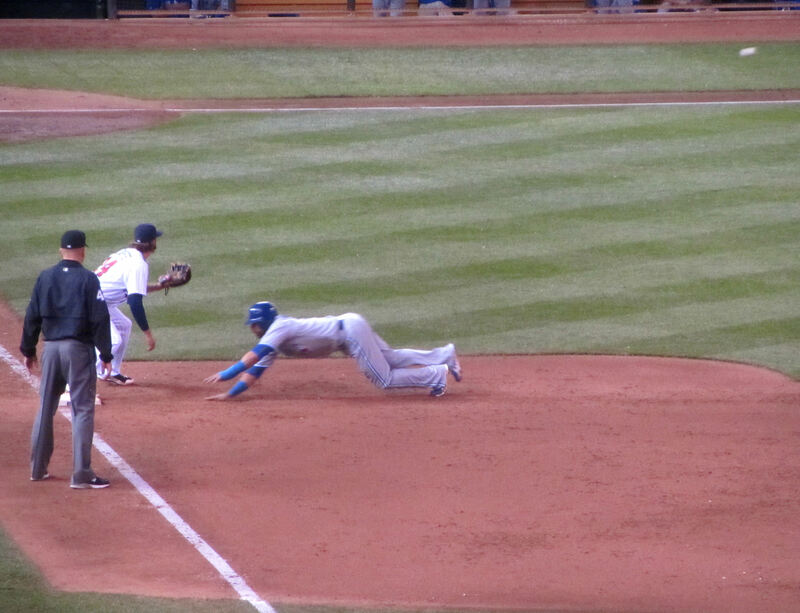 slide into home! SAFE! (“Hey, kids, no sliding!” called out the friendly guy manning the home plate area). 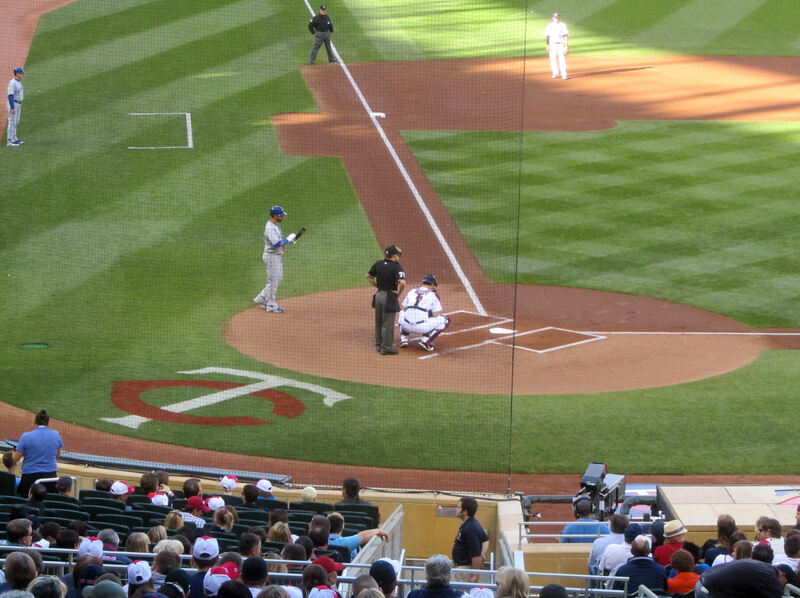 …, which is reminiscent of our picture of Tim with the big Pirates “P” painted behind home plate at PNC Park. 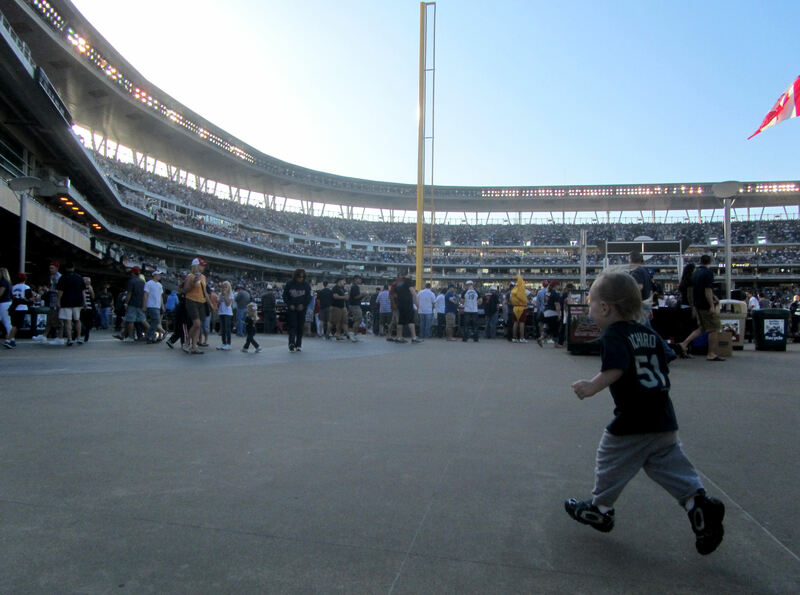 Hey, teams who hurry everyone through kids run the bases (I’m taking to you Mets, Nationals, Phillies), take a cue from the Tigers (and the super-West-Coast-relaxed Padres) and let the fans really enjoy the Kids Run The Bases experience. The Tigers staff are cool folks. 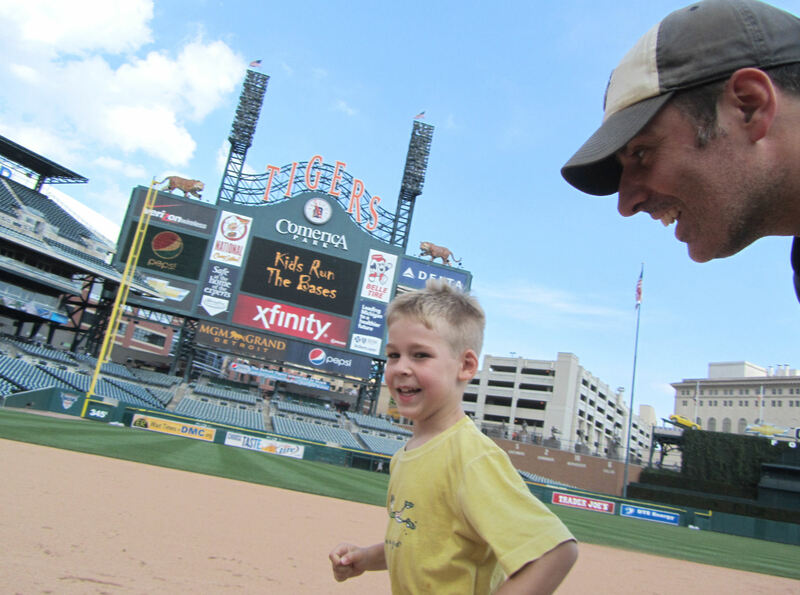 Thanks to everyone at Comerica Park! I’m serious. 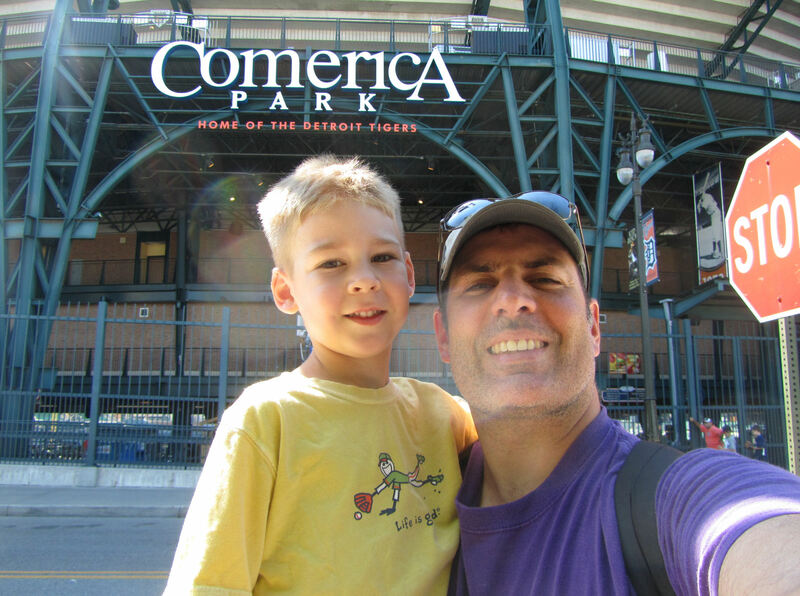 Comerica Park is awesome! Well, done Tigers! *includes Spring Training**divisions where we have seen each team play a home game. 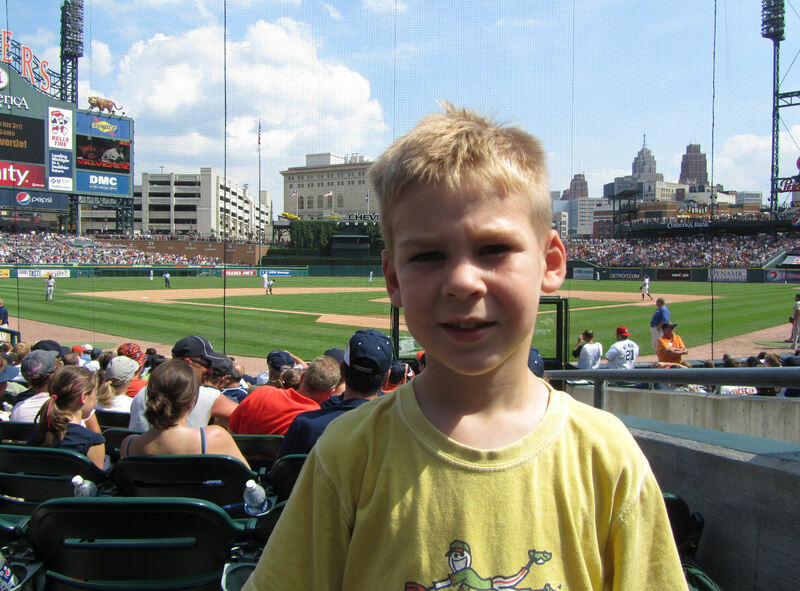 I’ve been trying to get Tim and I to Comerica Park for a couple years now. It has never seemed to work. My original plan this season was to work it into our Texas trip back in May, but the flights just wouldn’t work. 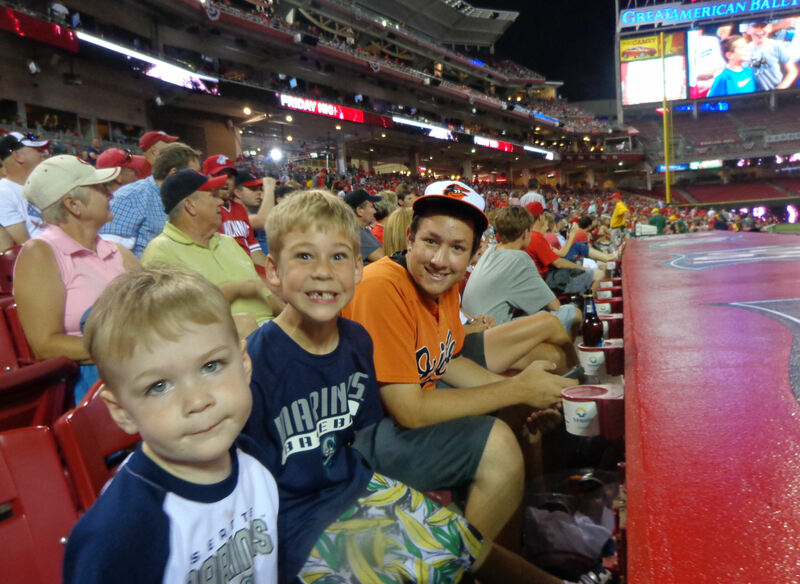 So we came up with a new plan: Fourth of July weekend road trip to Cincinnati and Detroit. Cincinnati was up first. 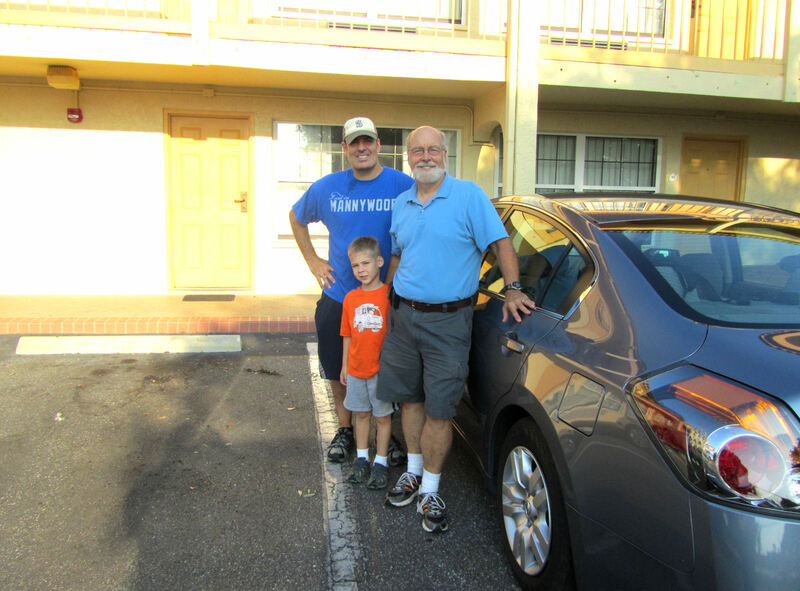 We hit the road in the evening on Friday, July 1st and drove to a hotel in Pittsburgh. 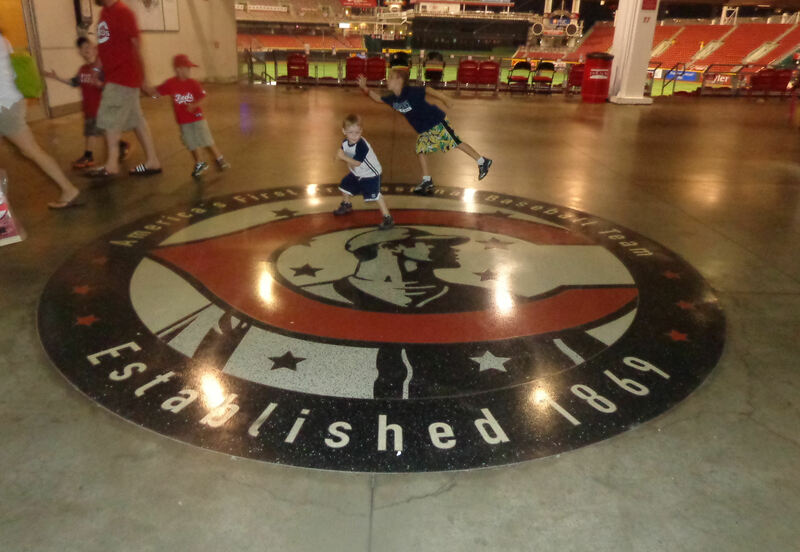 On Saturday, July 2, 2011 we headed off to Cincinnati to take in a game in the “Ohio Cup” series – Cleveland Indians vs. Cincinnati Reds. 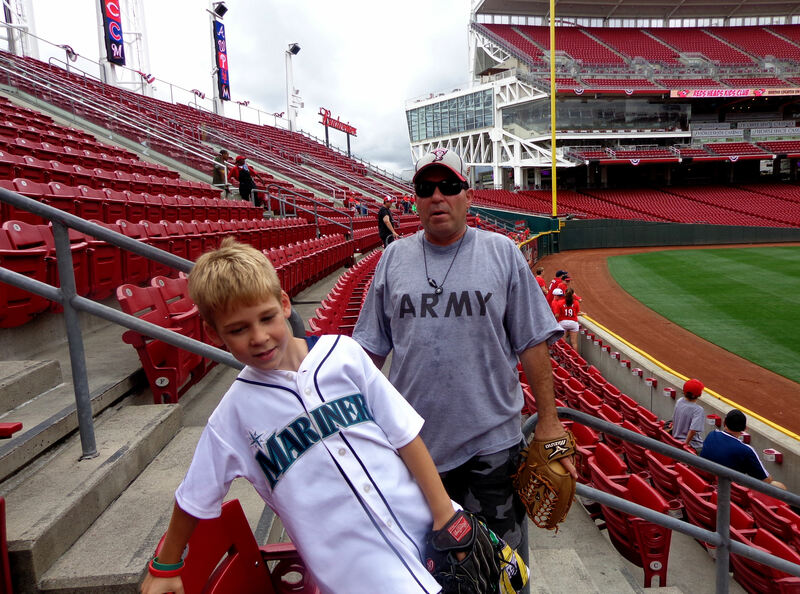 But the game wasn’t until 4:05 p.m., and it was only about a four hour drive to Cincinnati. No matter what, we were going to get there before the gates opened. 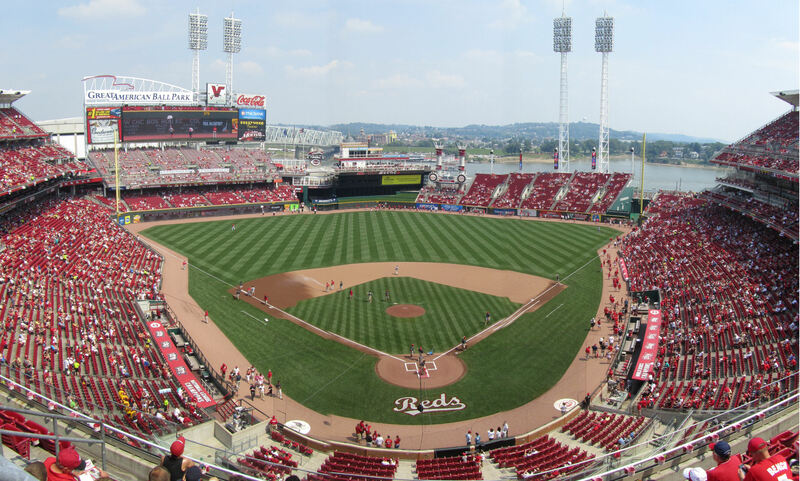 So, when we were about 50 miles out from Cincinnati, I called Colleen and asked her to look up the address for Moeller High School – Ken Griffey, Jr.’s high school (and, oh, yeah, Barry Larkin’s too)! …where I imagined Griffey playing ball as a teenager. 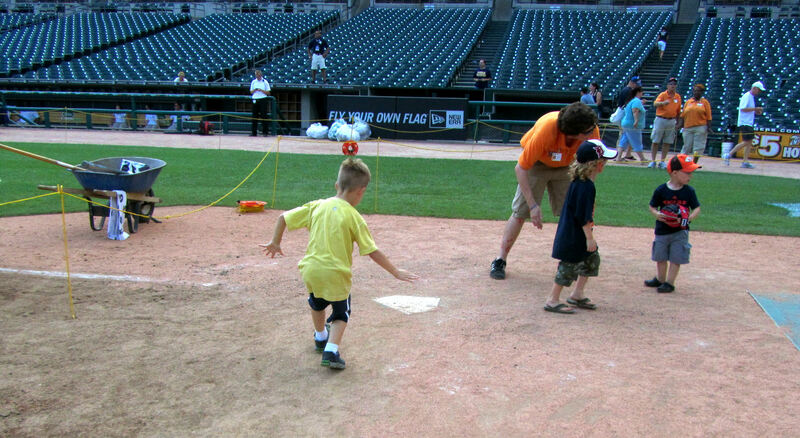 We ran the “bases” (there weren’t really any bases) and took some lefthanded hacks (without a bat) at the plate. Ah, it felt just like we were “The Kid” himself. Up above a hill out in right field, there were really (really!) nice looking soccer and football fields. It made me think that there must be other baseball facilities somewhere else. 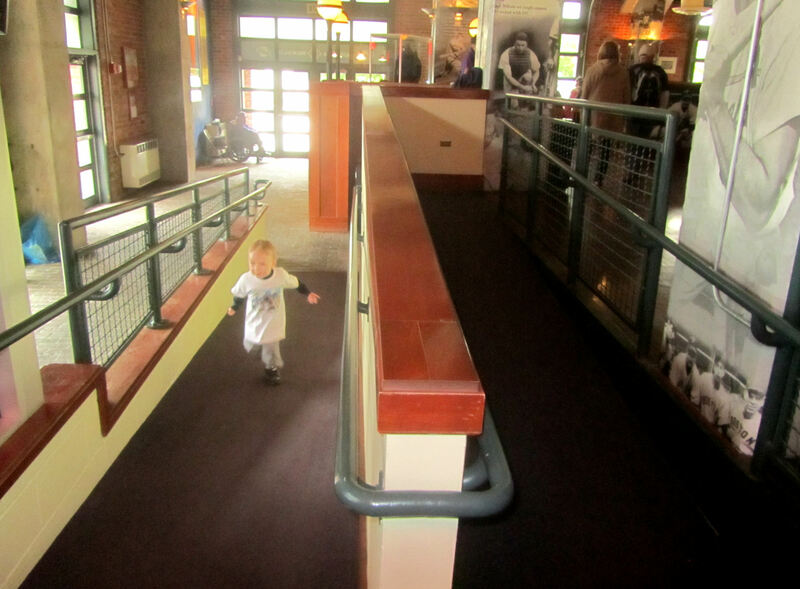 In the picture above to the right, Tim is pretending he is Griffey walking into school. Just as we were able to leave, a guy exited the main doors (where Tim is approaching in that picture above) and started packing some stuff into a van. I ran over and asked him if he knew where the baseball team plays. He was very nice and we ended up striking up a 10 minute conversation. 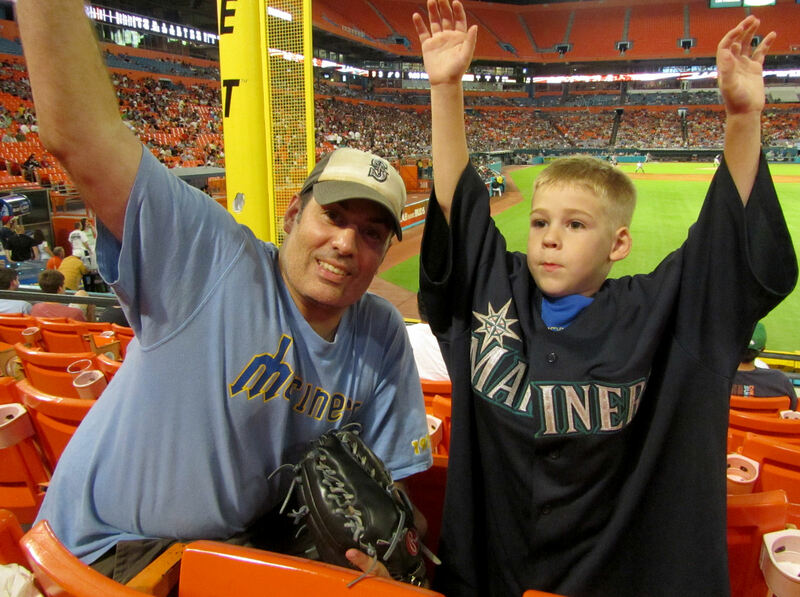 It ends up that the guy was Griffey’s U.S. History teacher back in the mid-1980s. 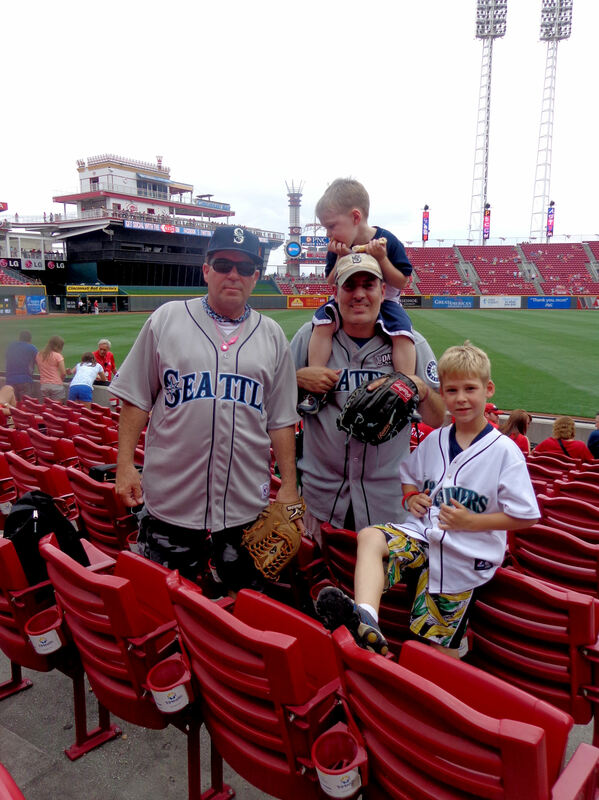 He shared a handful of Griffey stories with us that were incredibly awesome to hear. Nothing overly important or exciting. Just tidbits about Griffey the high schooler and Griffey the man returning home after being traded to the Reds in 2000. It was a cool behind the scenes glimpse at my all-time favorite ballplayer. If were really the discussions (and I have no reason to doubt it), it certainly looks like Griff proved himself right. Oh, yeah. And he mentioned that Griffey spent some time practicing on that scruffy field behind the school, but that’s it. He never played games there. And with that, lets continue on to Cincinnati. 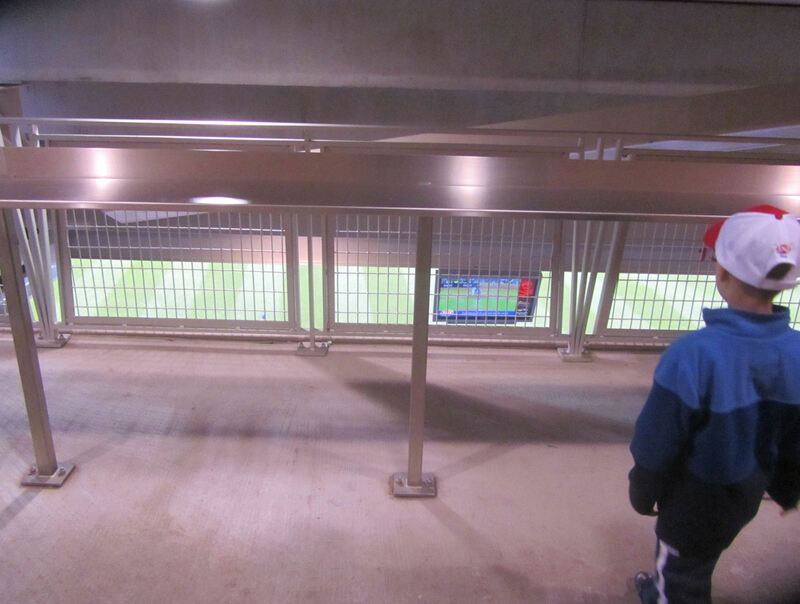 …to get to the stadium. 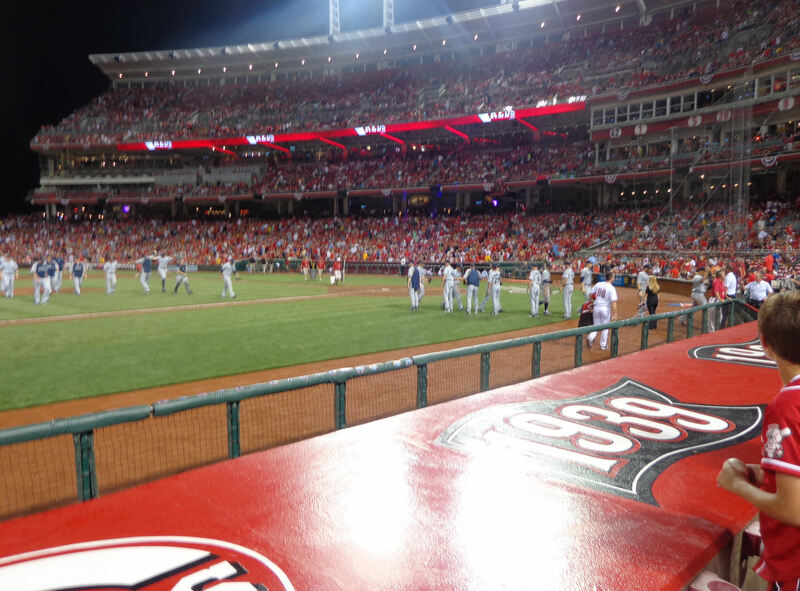 (Those pictures were actually taken after the game…so everyone is walking away from the park instead of to it.) 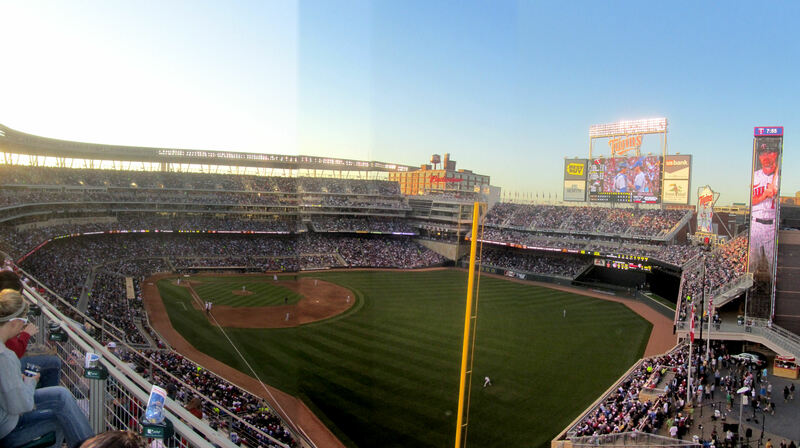 In the picture above to the right, you can see that the ballpark is tucked between two buildings. 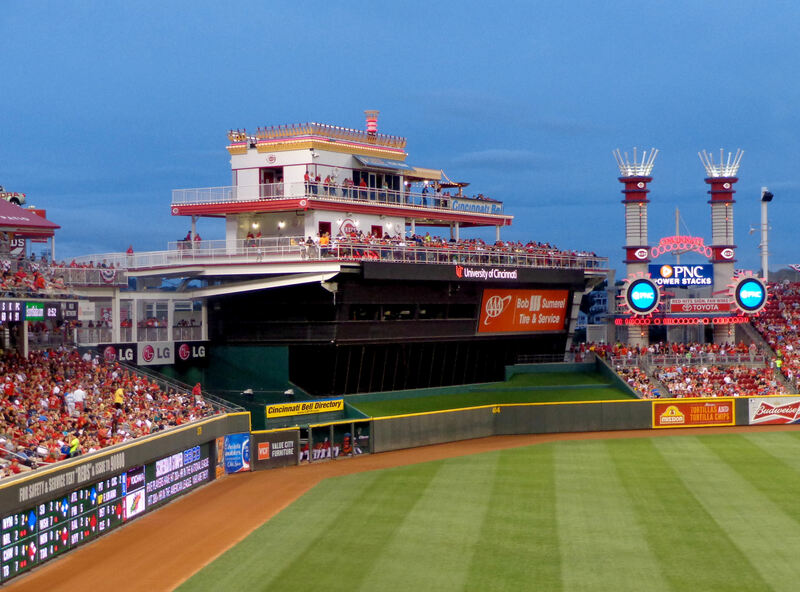 The building to the left the Reds front office and the building to the right is the main team store and the Reds (very cool) Hall of Fame. …and that picture to the left is a huge engraving (I guess that’s what you would call it) on the end of the front office building. In the picture above to the right with Tim facing the statue of the pitcher, Tim explained that he was being the catcher and he was telling the pitcher what pitches to throw. territory where an Indians pitcher fielded it right in front of us. When I asked if he could toss it up to Tim, he walked over and handed it directly to Tim. As he walked away, I called out, “Wait! What’s your name! ?” He reply, simply, “Tony!” I thought that was pretty funny. We’re on a first name basis, you know? I later checked the roster and found that Tony’s last name is Sipp. Tim looks pretty sweaty in that picture, but it is really water. It was so hot that we kept dousing Tim’s head with cold water. 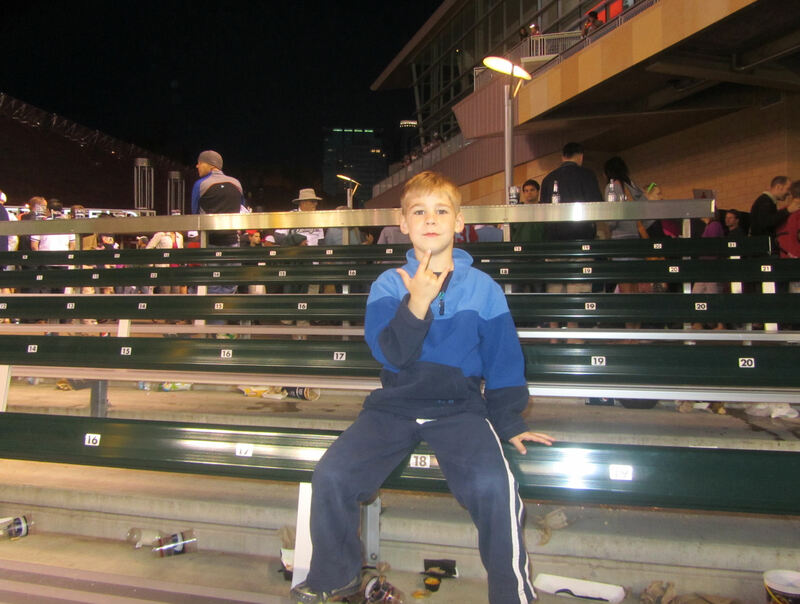 Although no one checked our tickets when we headed down into the seats behind the dugout, I got the feeling that someone was supposed to have done so. 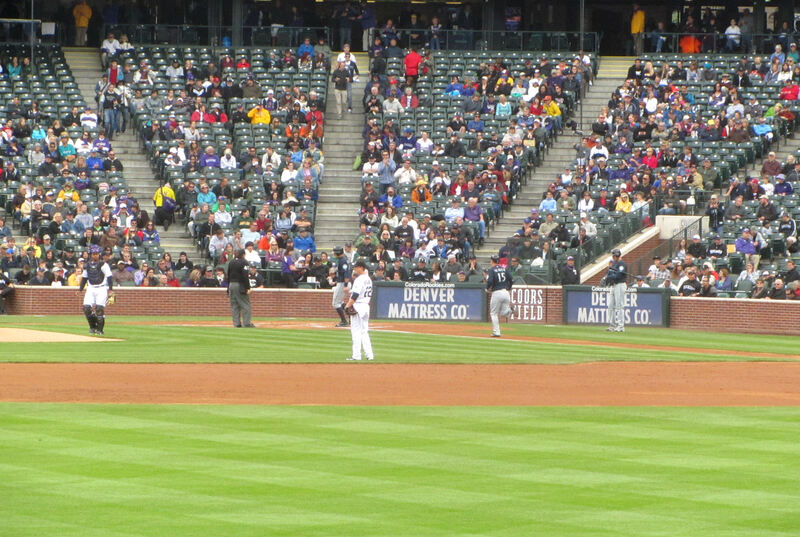 There was hardly anyone in the seats behind dugout, but lots of people down the foul lines and in the outfield. 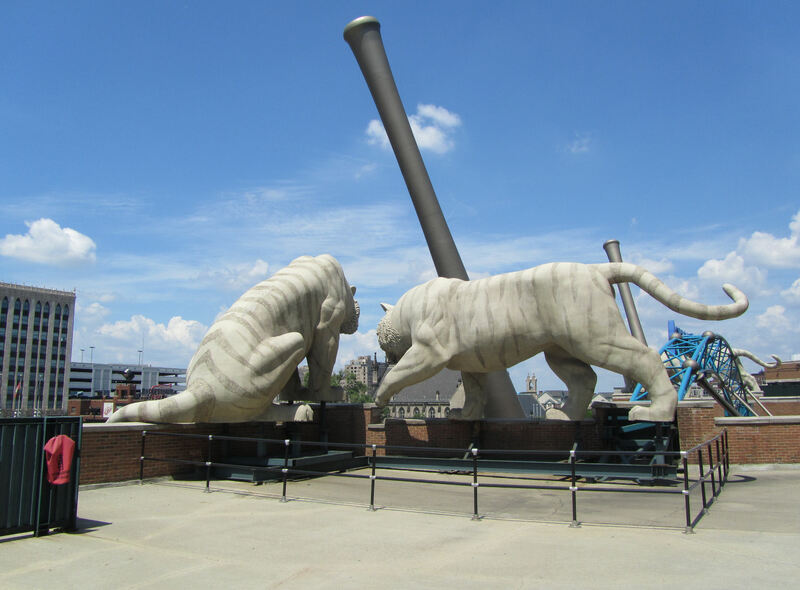 There is a big steamboat looking thing above the batters’ eye in CF and Tim requested that we go out there and check it out. So that’s what we did…well, we tried to. 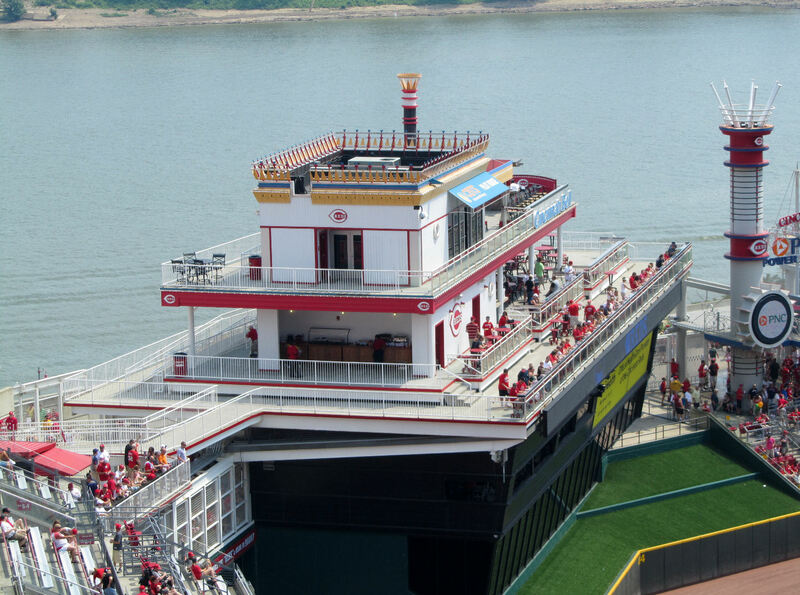 You can’t actually get out onto that steamboat unless you are part of the group that has the steamboat for the game. One Indians player in CF was clearly having more fun than anyone else on the field. I had no clue who he was. The last group of hitters was only two guys and I am pretty sure they were pitchers preparing for their final interleague games. 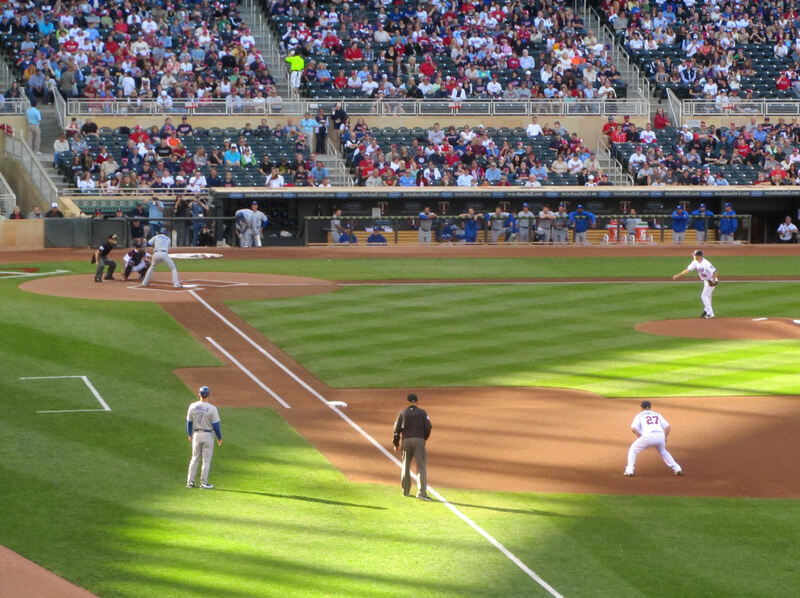 They hardly got the ball out of the infield. But they did get one ball out to the “fun guy” in center field. He was way out there in CF. After gloving the baseball, he started walking toward another player in LCF. I didn’t say a word, but I held my glove up. As he walked, he noticed us and he threw a laser to me. It was an amazing throw considering the height and distance the ball traveled. I took pictures of the guy and tried to get a close up of his glove…where it appeared that his name was embroidered. In the best photo, I could tell the first name was “Cade” and the last name looked like it started with “Dur.” The roster told me that Chad Durbin now pitches for the Indians and Wikipedia told me that Durbin has a son named Cade. So there you go, thanks are due to Mr. Durbin. Interesting side note, the baseball that Durbin threw up to us is a minor league baseball. It is so scuffed and dirty that it is impossible to read which MiLB league it is from, but it clearly appears to have the MiLB logo instead of the MLB logo. The bullpens were actually pretty interesting to me. 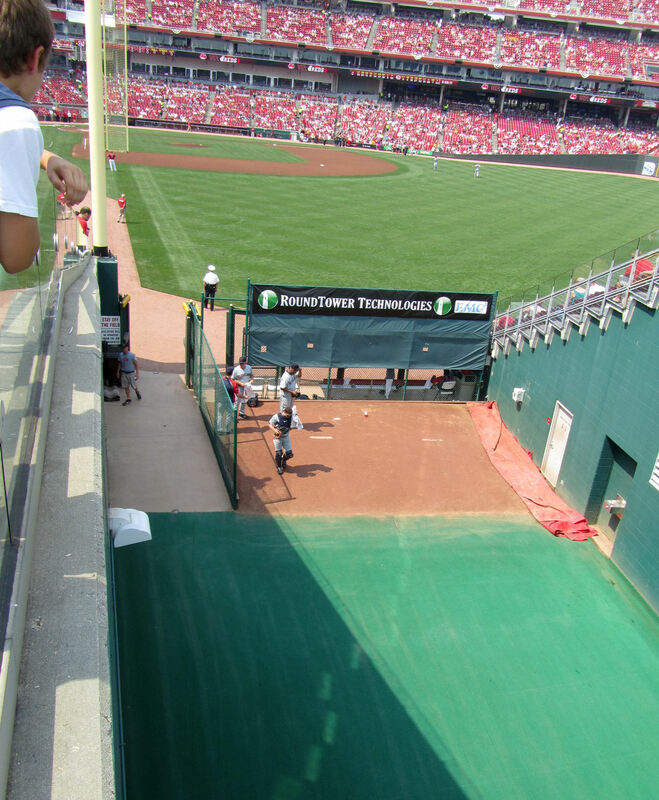 A lot of stadiums where the bullpens are not side-by-side seem to put the visitors’ bullpen out in the direct sunlight and the home bullpen in a shady area. The Reds, however, did the opposite. 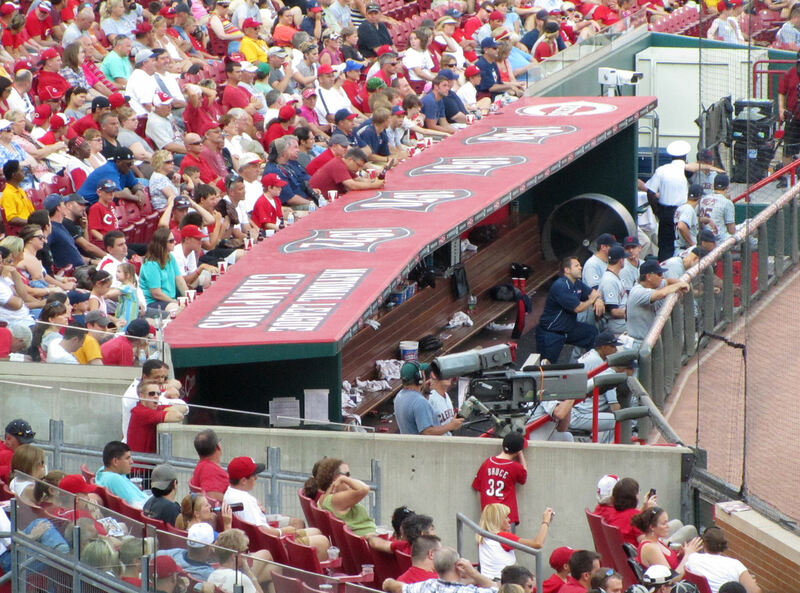 Pretty early in the game, the visitors’ bullpen was in the shade while the Reds relievers were still in the direct sun. 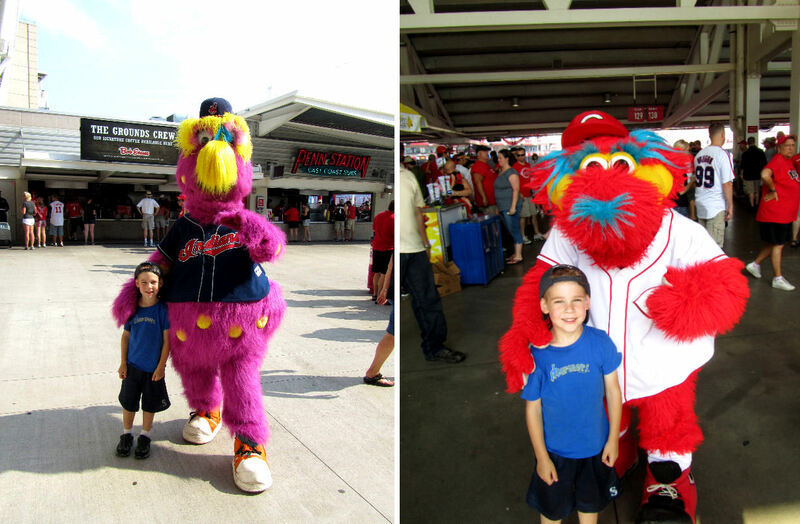 Mr. Redlegs is very similar to Mr. Met. 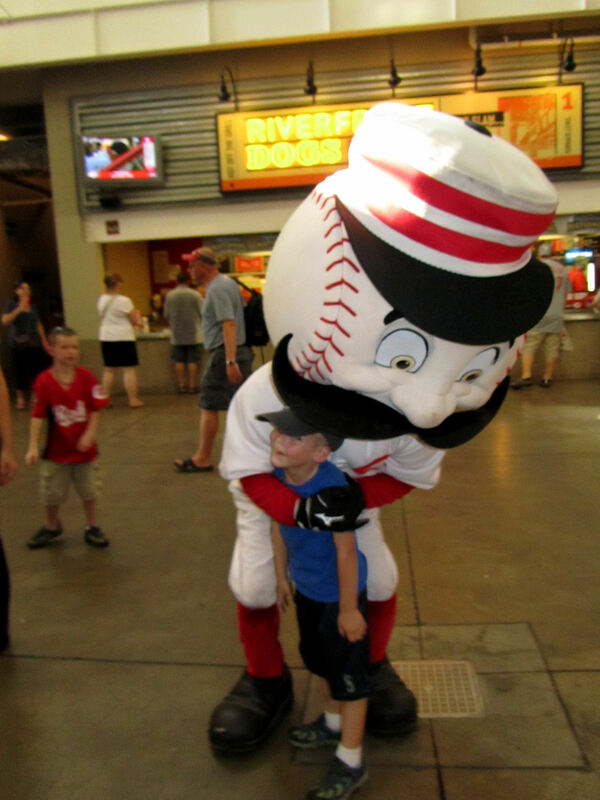 But if you ask me, Mr. Redlegs is hands down the superior mascot. 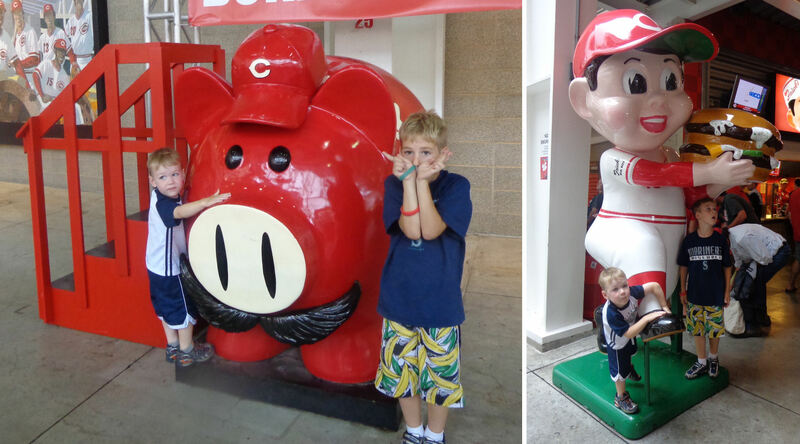 The Rollie Fingers ‘stache really sets him apart…as does his retro Reds hat. 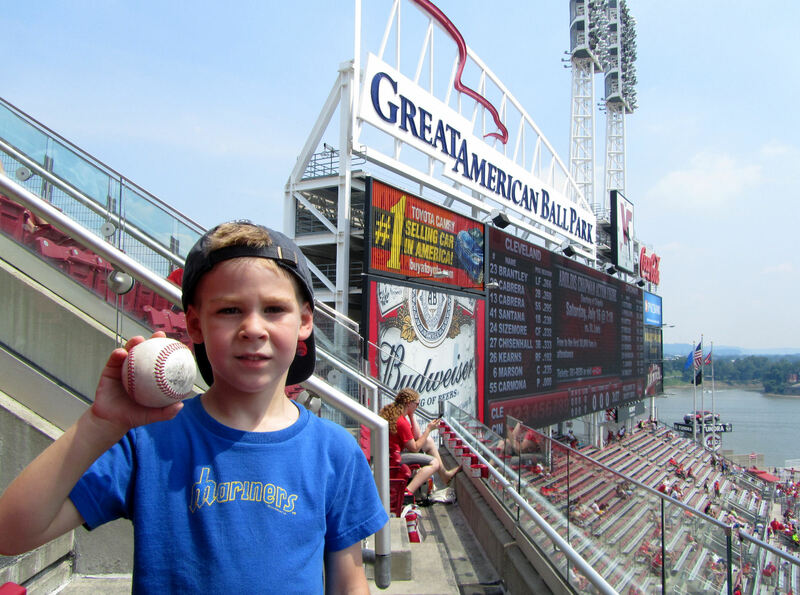 the question, we were hoping Chapman would sign Tim’s baseball from Tony Sipp. 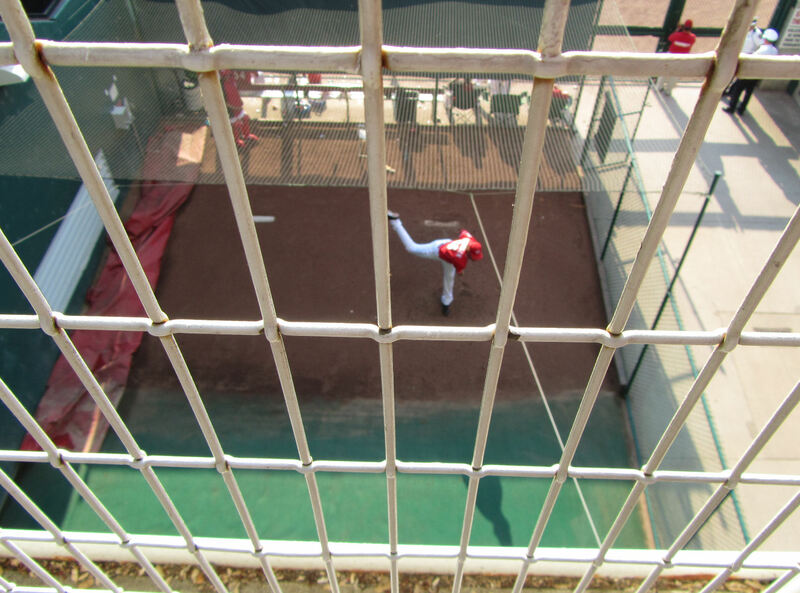 Soon after we arrived at the stairs up above Chapman, he called it quits and walked into a door opposite the bullpen. We waited patiently. And then he reappeared. I called his name and I’m pretty sure that he only stopped because he saw Tim. When Chapman stopped below us, he was holding a Gatorade-type bottle in one hand and he motioned for me to toss the Sipp baseball down to him. At this point, he had the drink in one hand and the baseball in the other hand, he motioned for me to toss down our pen. I figured he would just let it hit the ground and then pick it up. But he showed some major hand-eye coordination by catching the pen at hip level with his index finger. It was very impressive. After he signed the ball and tossed us the ball and pen, I shouted out a big “Gracias, Aroldis!” That put a huge smile on his face. 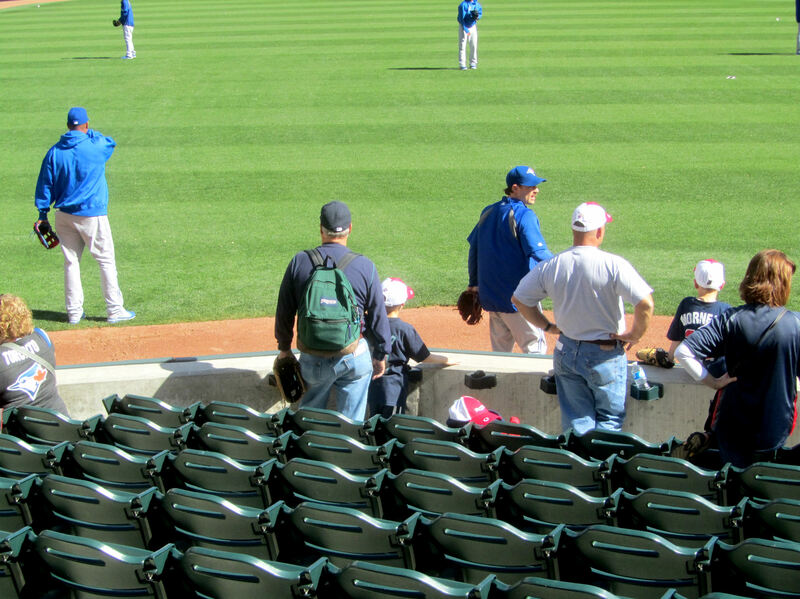 During this interaction (and while previously watching him signing autographs), we were probably 10 feet above Chapman’s head and it was impossible to chat with him. Nevertheless, it was clear that the guy conveys a ridiculously warm/nice/pleasant attitude. He really seemed like a great guy. Here is a picture of the Chapman autograph. …2010 N.L. MVP Joey Votto. 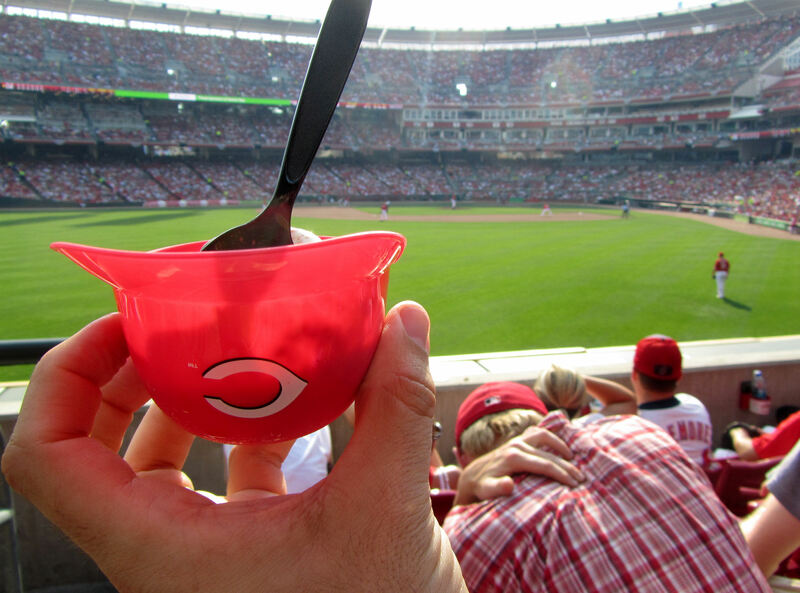 In that at bat, Votto is about to ground out in the first inning. This was a low scoring game. 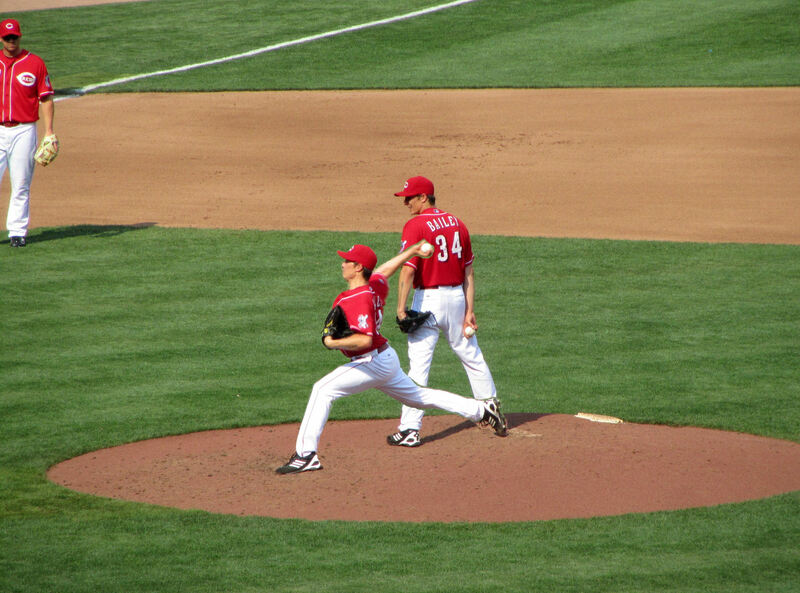 The pitching match-up was Fausto Carmona vs. Homer Bailey. We sat in our assigned seats through the second inning and the score was 0-0. Meanwhile, former-Mariner Mickey Brantley’s son Michael Brantley hit a 3-run homerun in the top of the third inning. That would be all the runs that the Indians would score during this game, and it was all they would need to win. 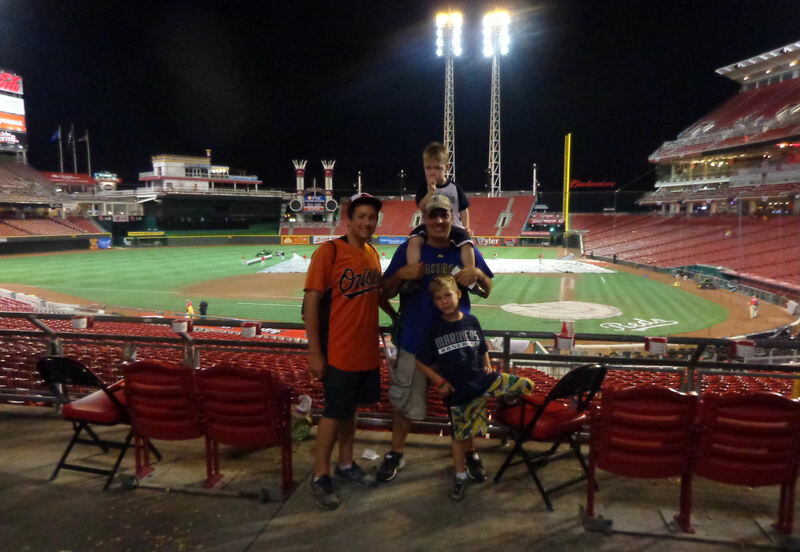 While we were interested in the game, we were just as interested in seeing as much of Great American Ball Park as we could. After we were thoroughly misted, we decided to head in the opposite direction of our seats and keep exploring. …check out Ken Griffey, Sr. in the mosaic to the left (of course, Sr. (wearing number 30) was an instrumental part of the “Big Red Machine” back in the day). Junior has got the Hall of Fame stats, but Senior has got the rings (2 of them). …flied out to CF. I would have got a great action shot of the Grady Sizemore and Austin Kearns running into each other just before Sizemore made the catch, but a lady walked into my pitch and totally ruined it. Booo! baseball seams on the floor of the team store. 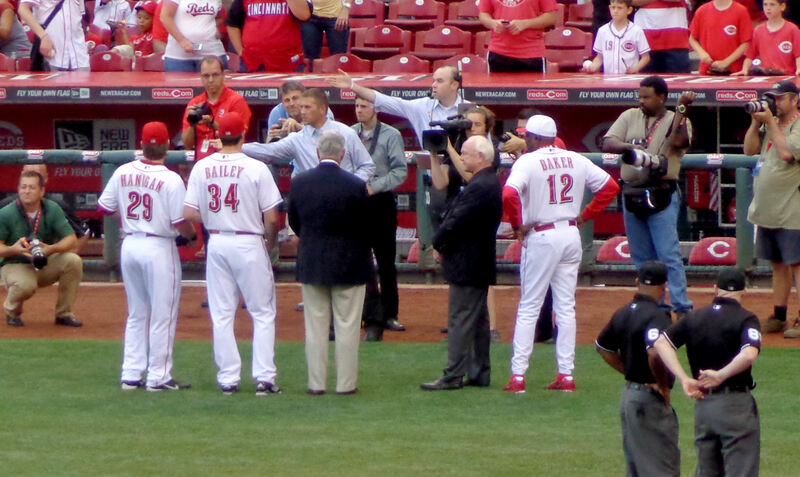 …which again features Ken Griffey, Sr. (wearing number 30). 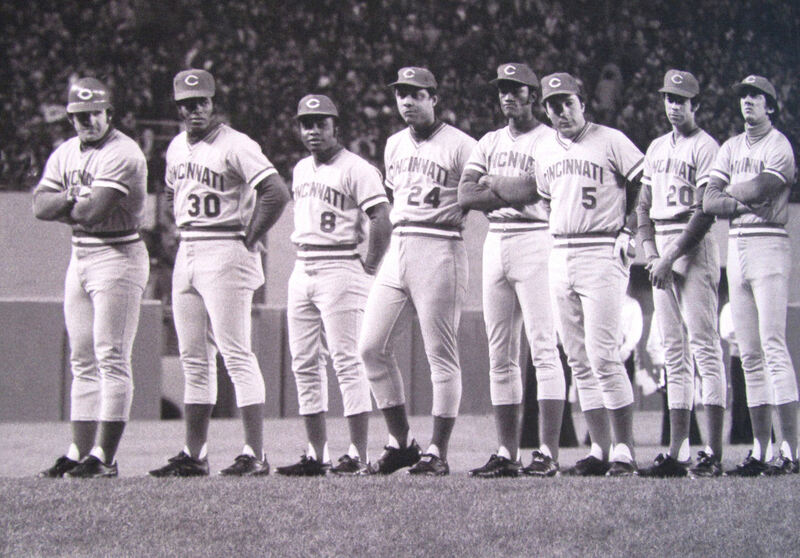 Lets see if I can name the rest of the Big Red Machine (from left-to-right): Pete Rose, Ken Griffey Sr., Joe “Everyone’s Favorite Broadcaster” Morgan, Tony Perez, George Foster, Johnny Bench, Cesar Geronimo, and Dave Concepcion. 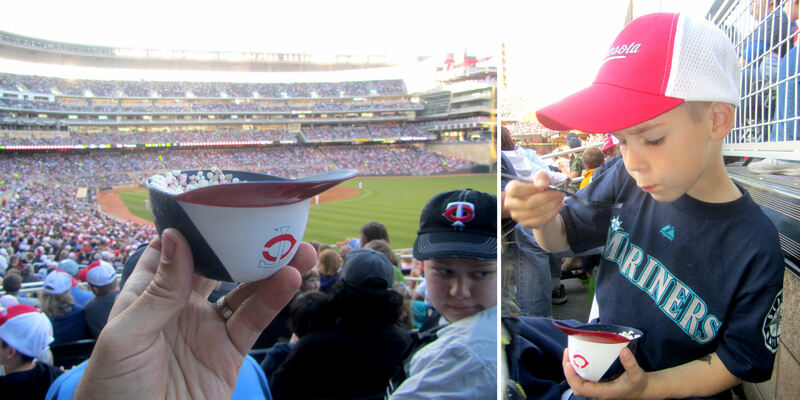 The ice cream helmet line was ridiculous. It was as if every fan at the game was in line. 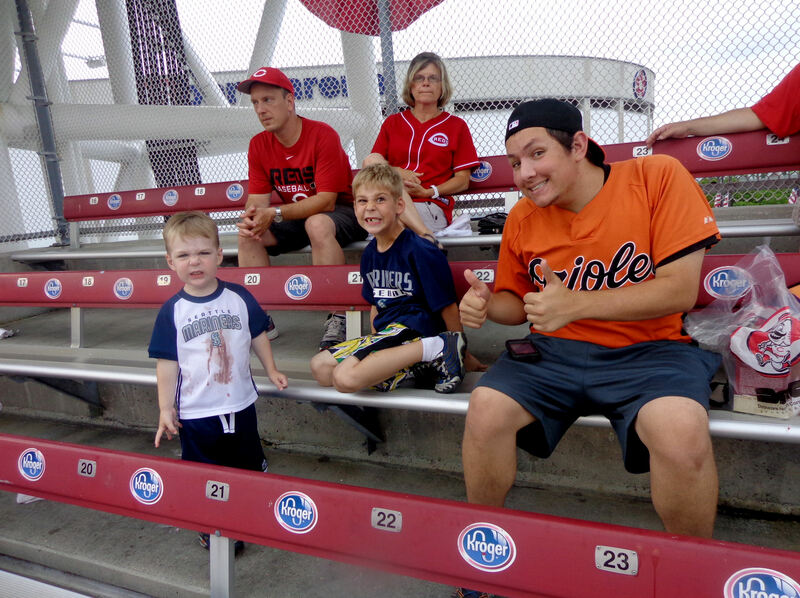 We were in line for at least a full inning. But when we got to the front of the line, it was worth the wait. They had about 6 (maybe 8) toppings, and they were free and unlimited! We both got twist soft serves. Tim got smashed up M&M’s with whipped cream and a cherry (which he got specifically to give to me) and I got smashed up Reese’s pieces. Delicious. 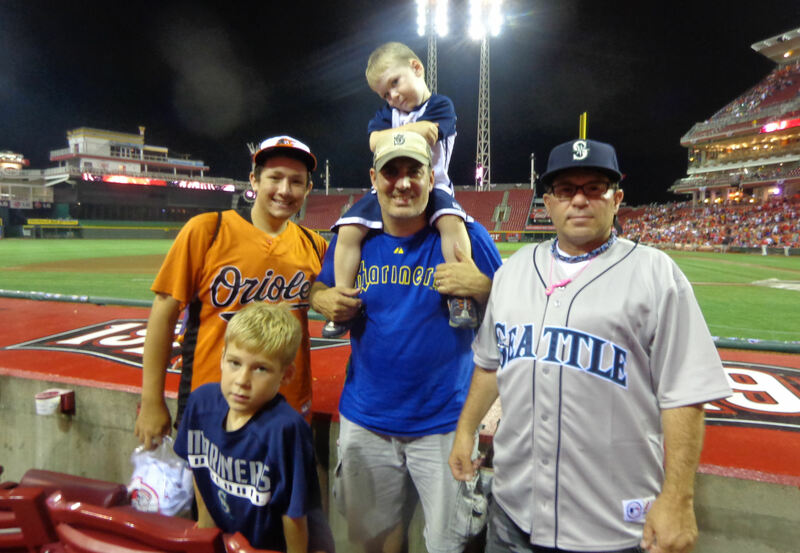 We were going to stay at a hotel 3.5 hours north in Toledo, Ohio after this game. So we decided to head over to the SRO areas behind home plate to watch the end of the game. The plan was to make a quick exit once the game ended. 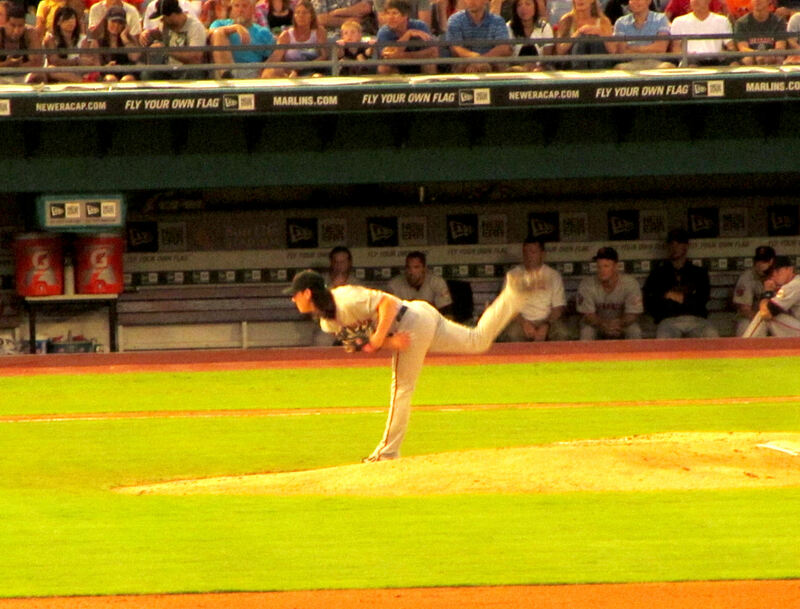 Phillips struck out for the second out of the inning. 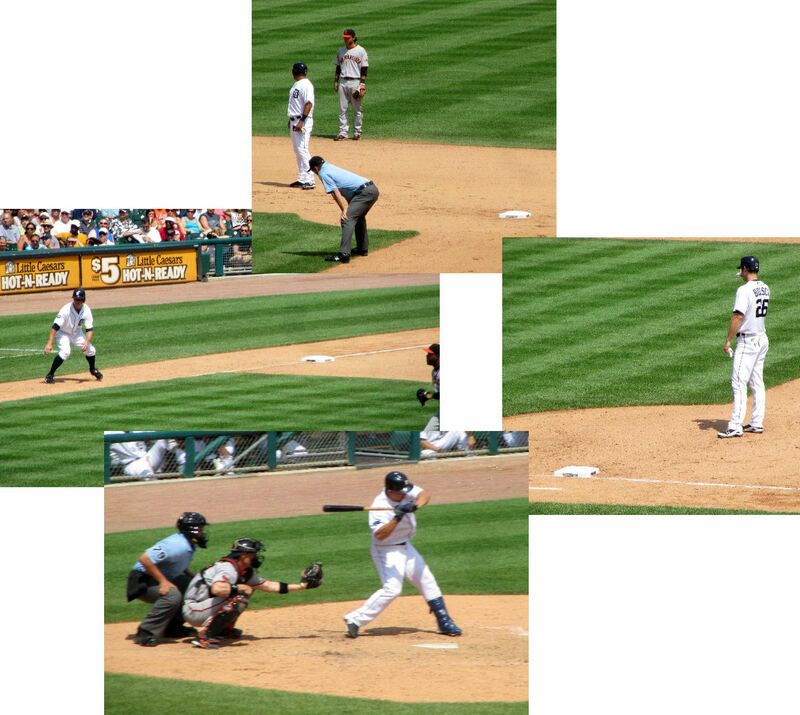 With the tying runs on base, Scott Rolen came to bat with two outs as the potential winning run. But he struck out to end the game. 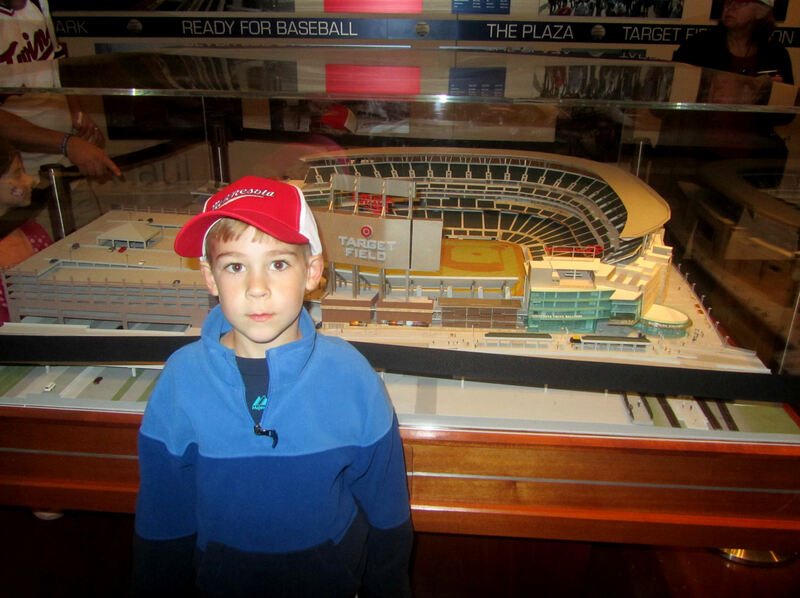 Although we missed a lot of the game because of all of the exploring we did around the ballpark, we had a great time. And the great time didn’t stop just because we had a 3.5 hour drive ahead of us. It was the night of July2nd and people were out in full force lighting off their own fireworks demonstrations. Tim had a great time watching the fireworks and didn’t fall asleep until after 11:00 p.m., right we pulled up to our hotel. 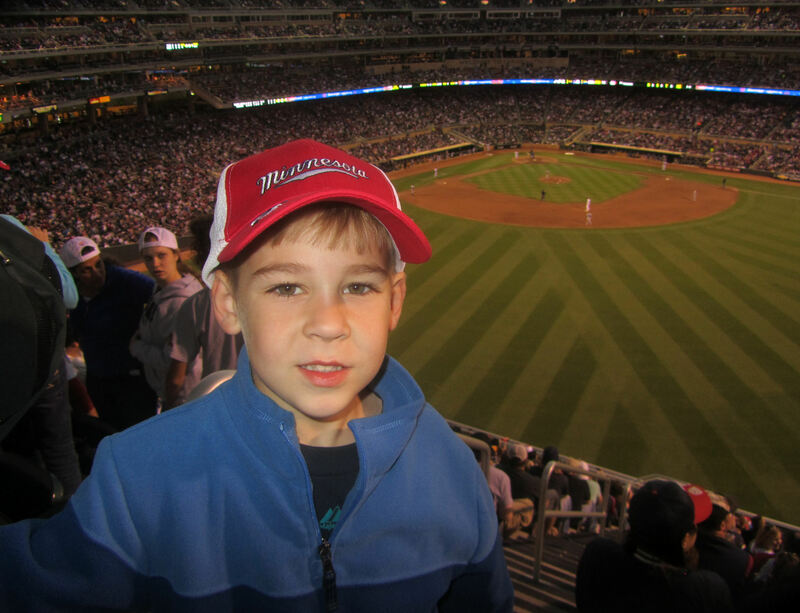 This entry provides a map through Kellan’s MLB adventures, featuring a picture from every regular season game he has attended along with the final score, date, location and a link to the relevant game report.